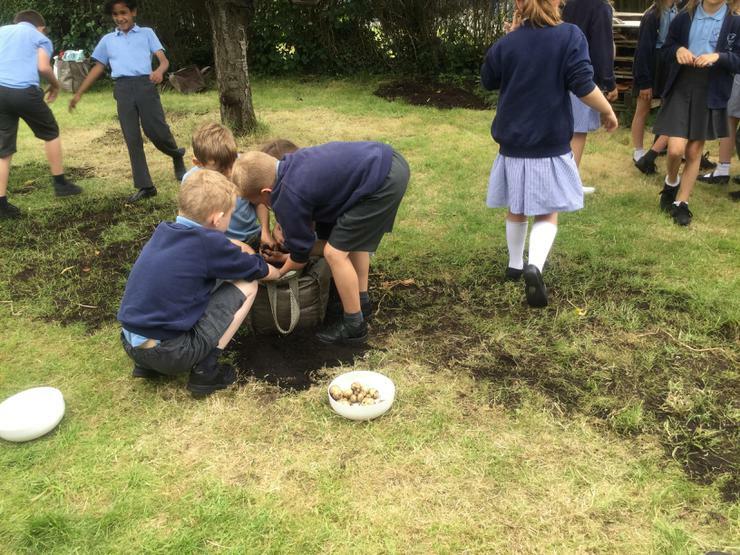 The children have had a fantastic time at gardening this year and have transformed the garden from a winter wilderness to a lovely summer garden. 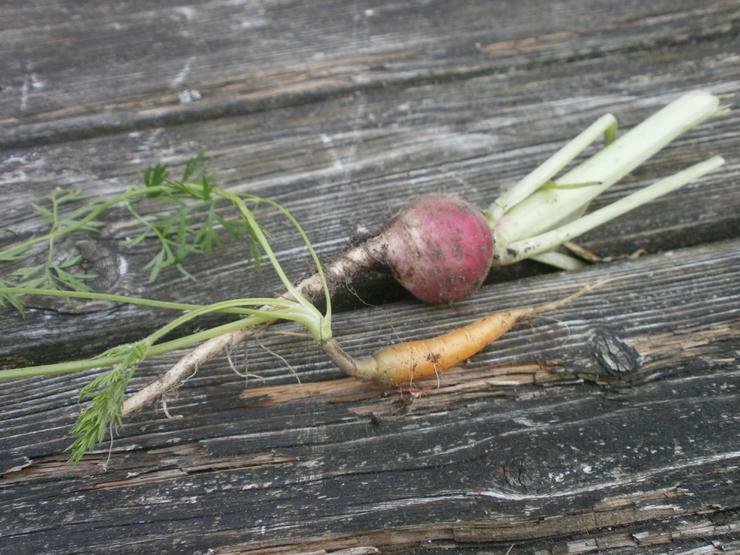 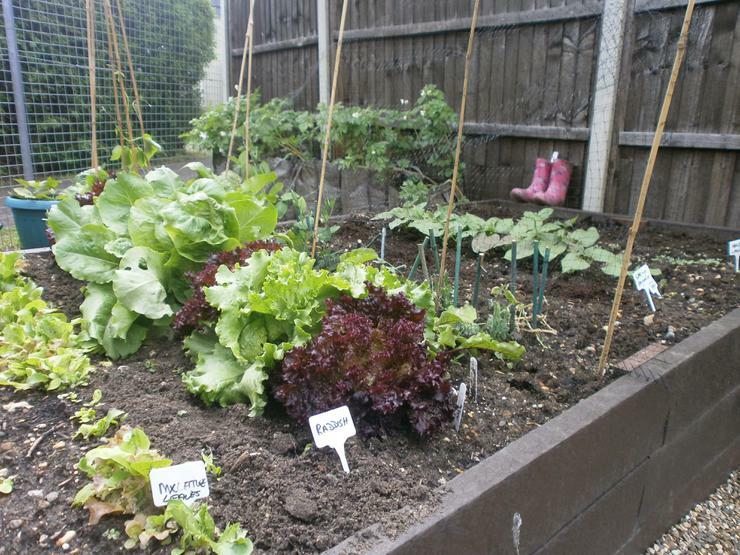 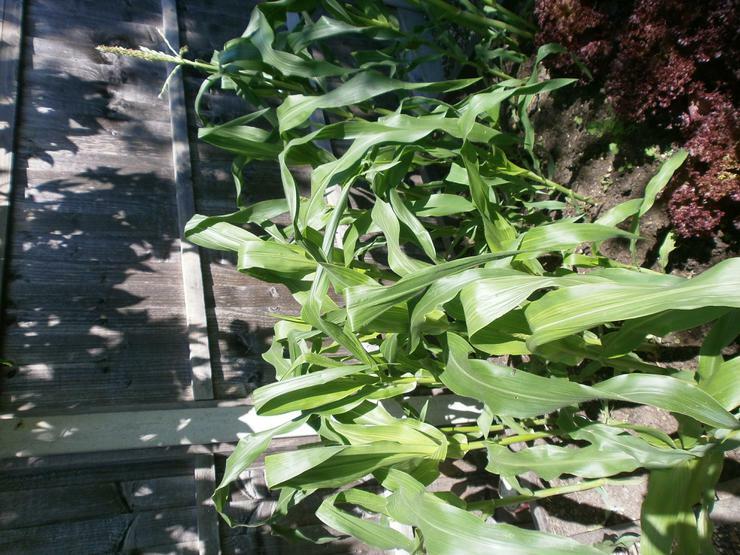 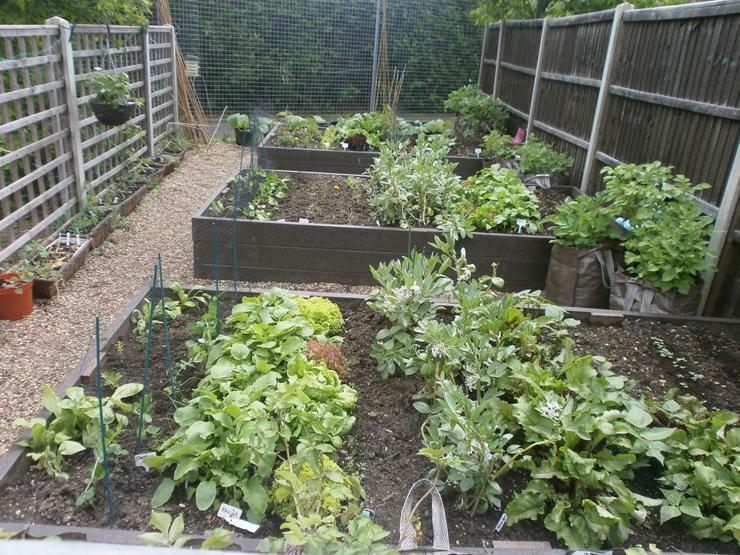 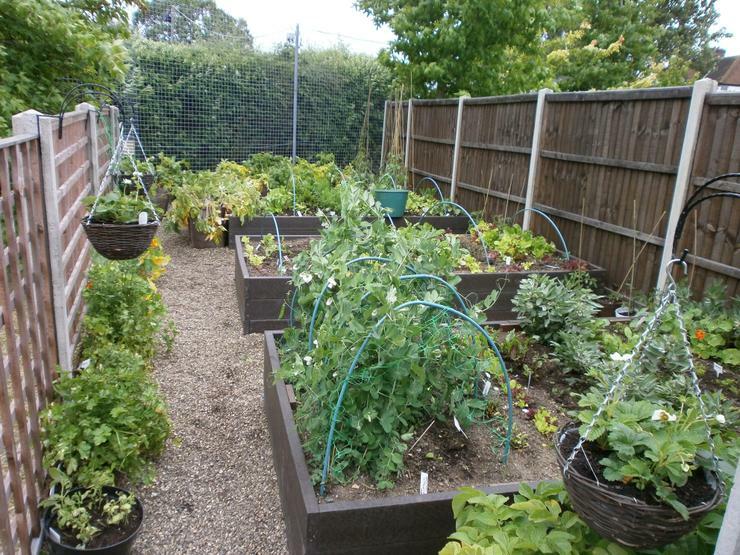 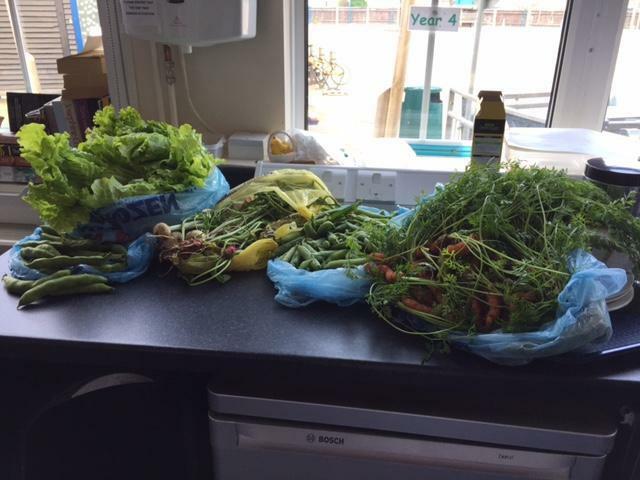 We have grown lots of vegetables from seed including sweetcorn, carrots, lettuces, radishes, tomatoes and many more. 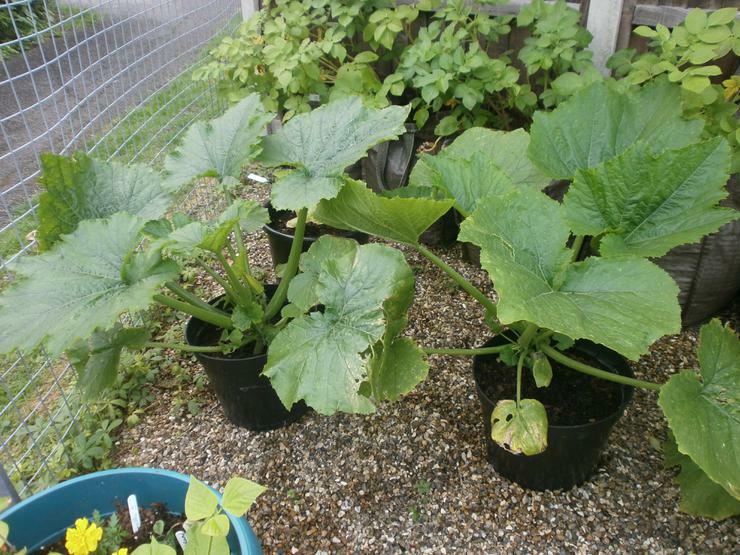 We are also hoping to have some juicy melons ready for the end of summer! 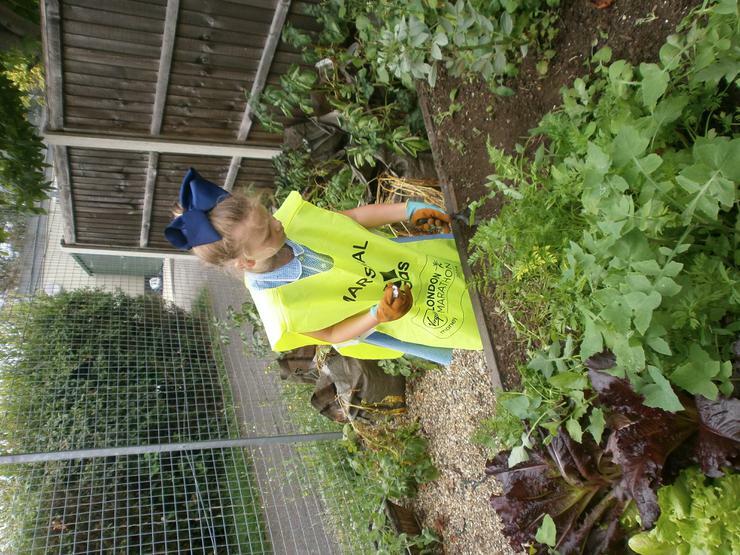 Our school garden is looking amazing after some great work by the children keeping the garden watered and snail free. 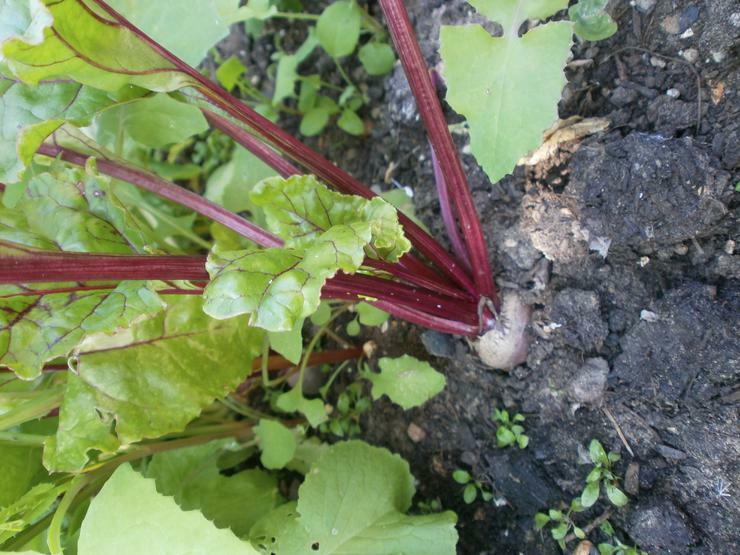 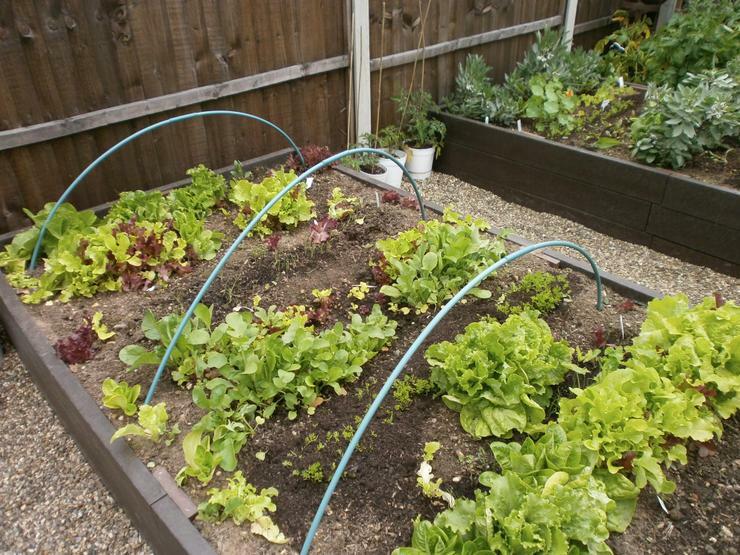 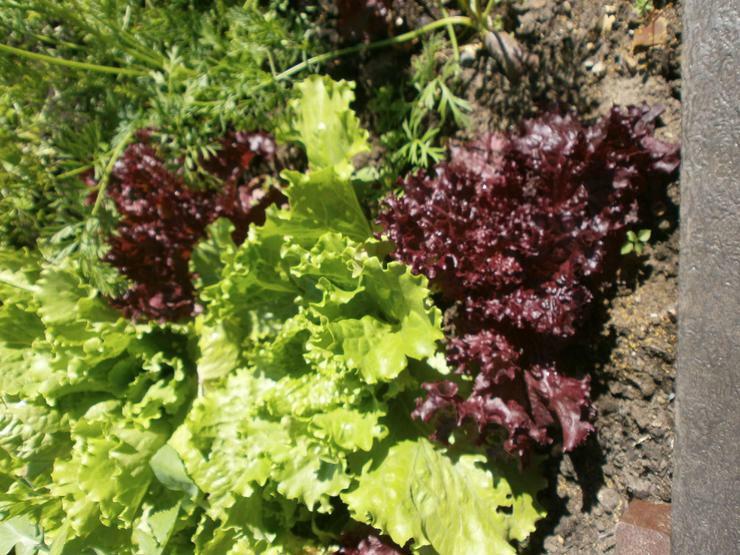 We have harvested lettuces, radishes, beans and strawberries from our raised beds and are looking forward to some lovely beetroot, french beans, tomatoes, carrots and cucumbers. 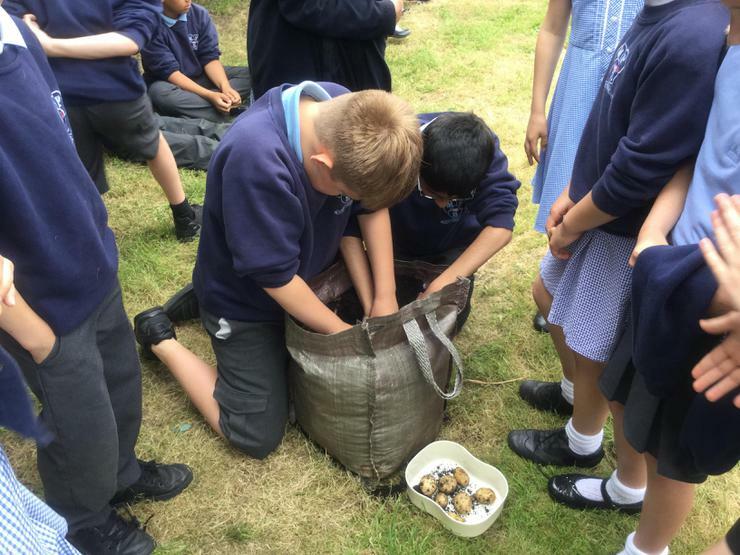 We have seen our first potatoes from our potato bags and each class is now counting the potatoes in their bags before seeing them turned into wedges. 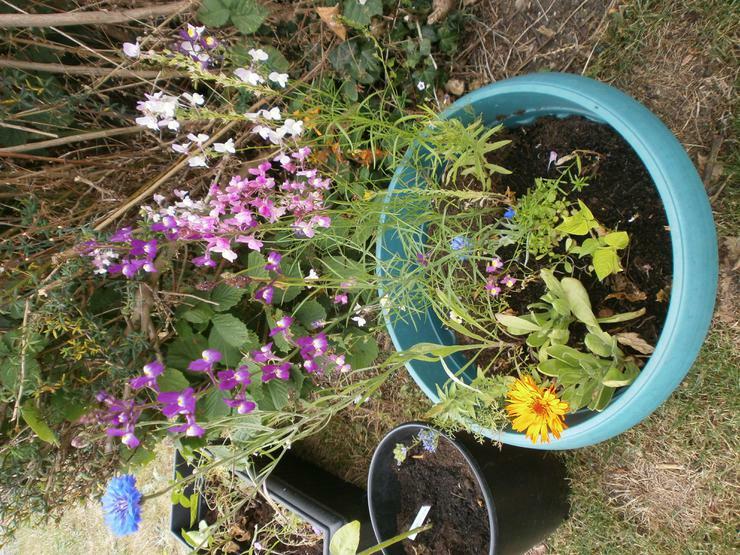 We have also grown some wild flowers, sunflowers and sweet peas to encourage bees and other wildlife and are hoping to see more over the summer holidays! 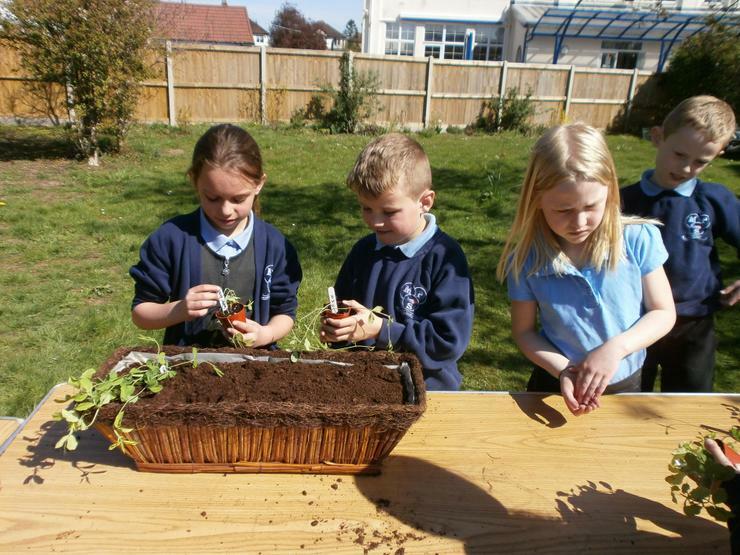 Our gardening sessions for 2017 have now started with every child having a go at gardening over the Spring and Summer terms. 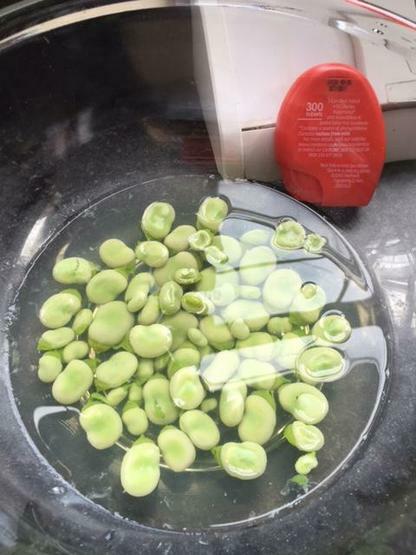 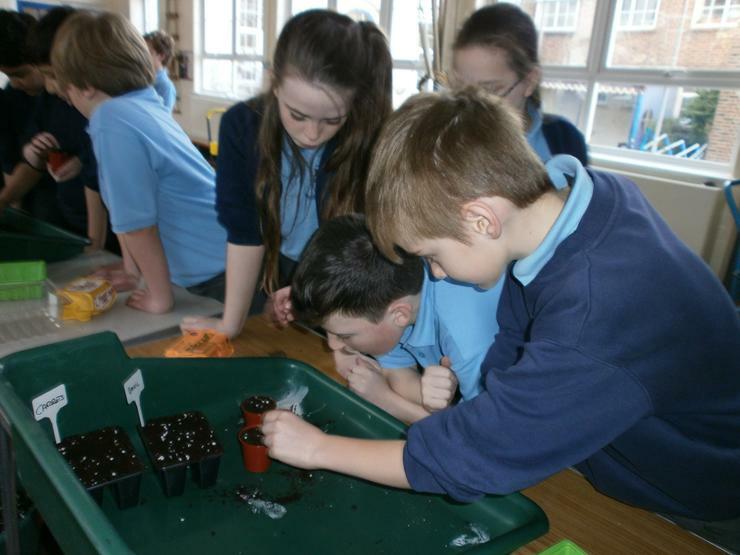 So far we have tested our vegetable knowledge with a fun quiz, planted our potatoes in our potato bags, sown lots of different seeds including broad beans, french beans, carrots, tomatoes, courgettes and had a go at growing giant and dwarf sunflowers. 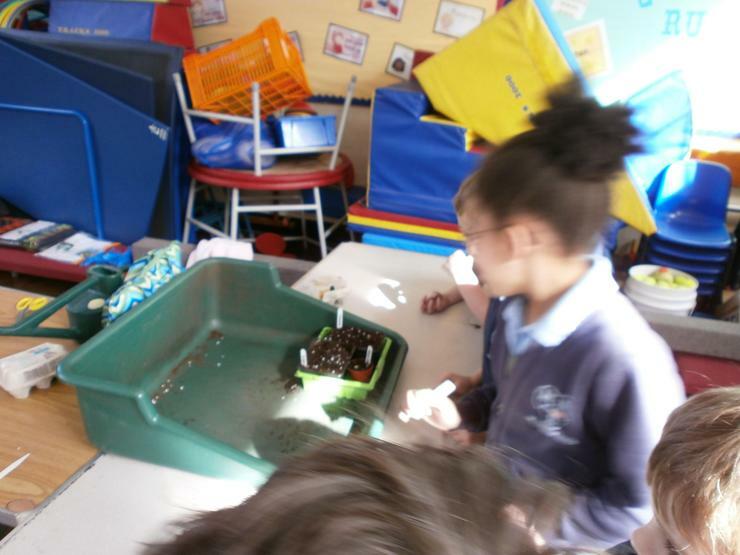 The children have all been doing an excellent job at looking after the potatoes and seeds in their classrooms. 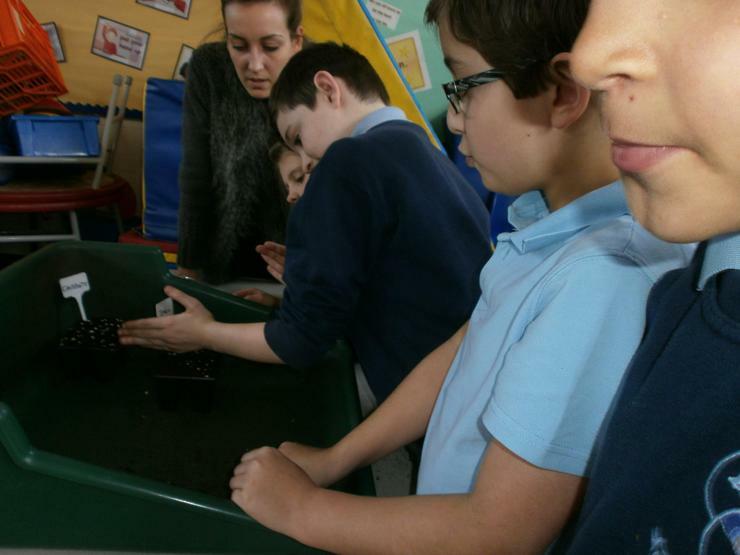 We are hoping that our giant sunflowers grow really well! 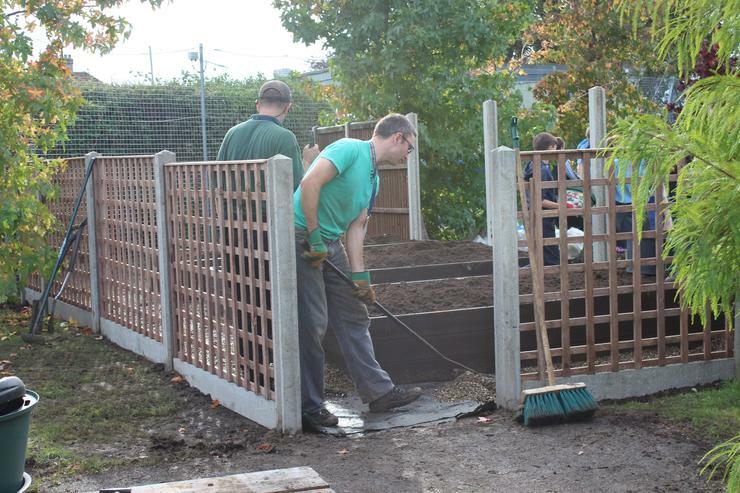 Now that the weather is warming up we are looking forward to putting our vegetables in our raised beds. 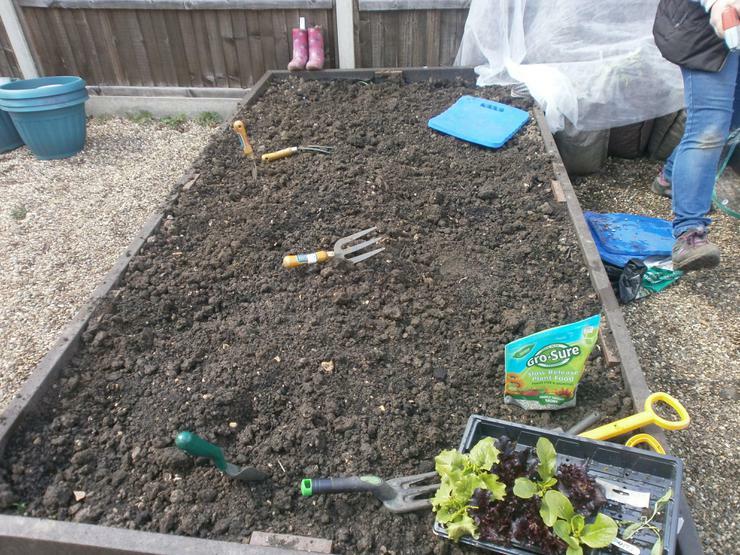 We are going to add other things including radishes, lettuce, beetroot and strawberries. 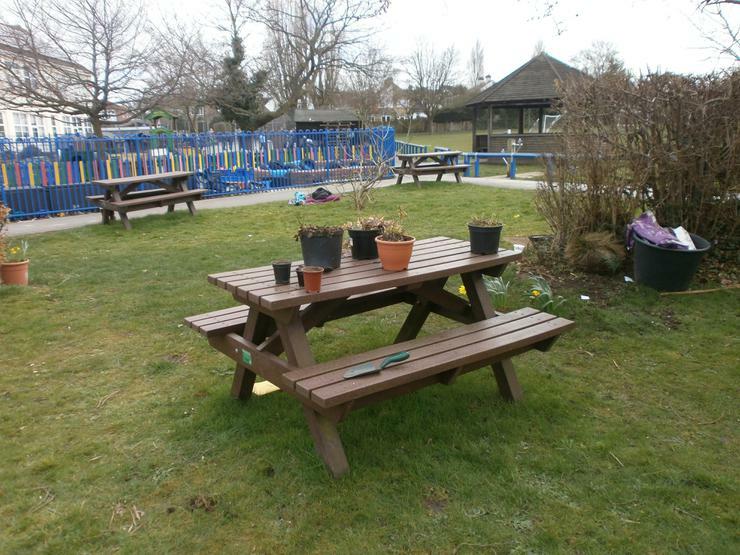 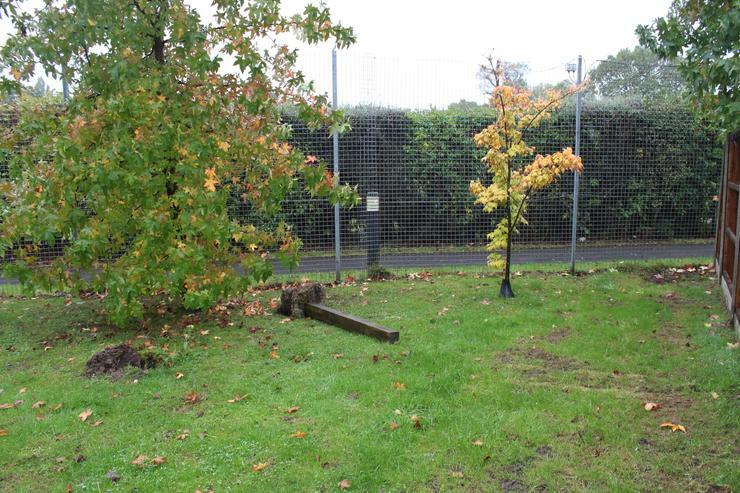 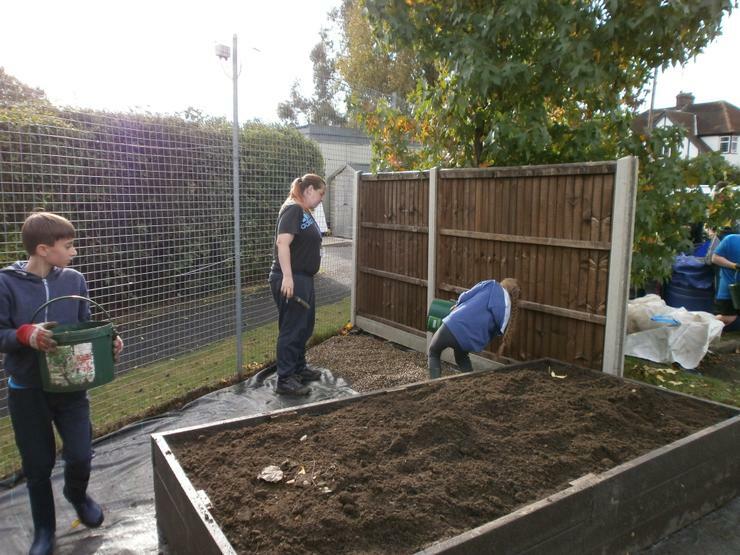 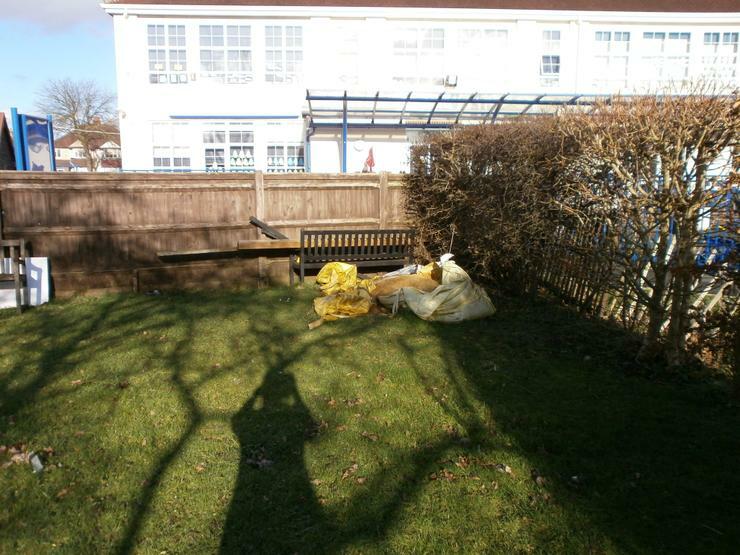 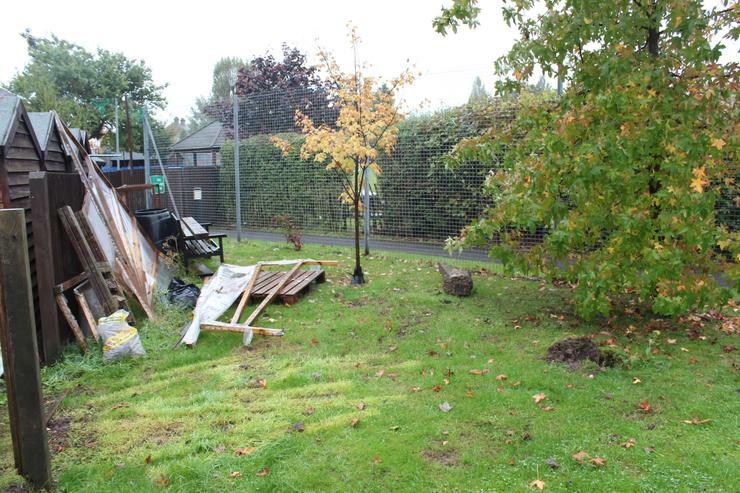 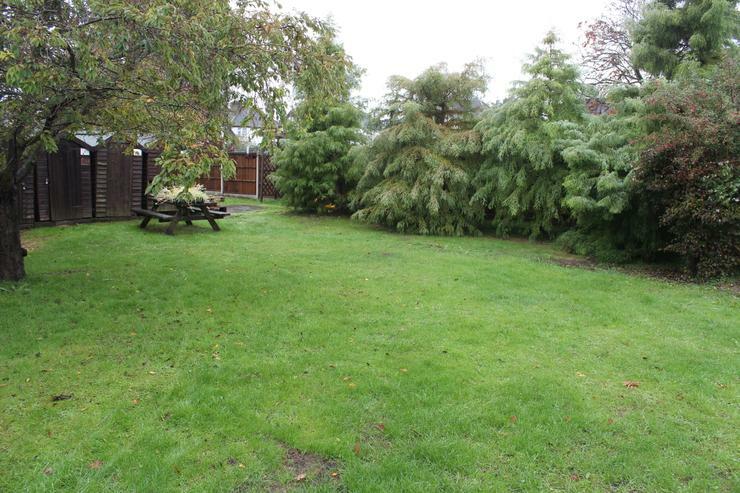 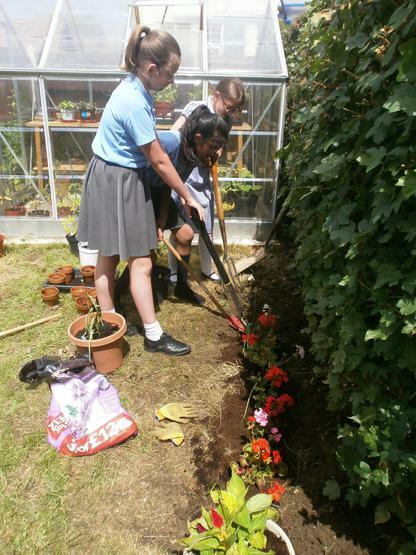 Our gardening club has done a great job at clearing the beds and leaves from winter. 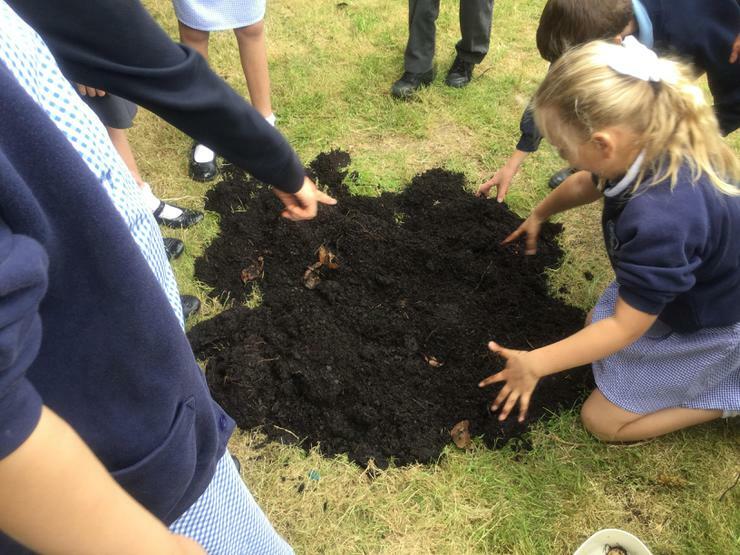 We are all very excited to have been joined by a pair of Robins and their chicks who have a nest in the garden and are eating the worms we have dug up. 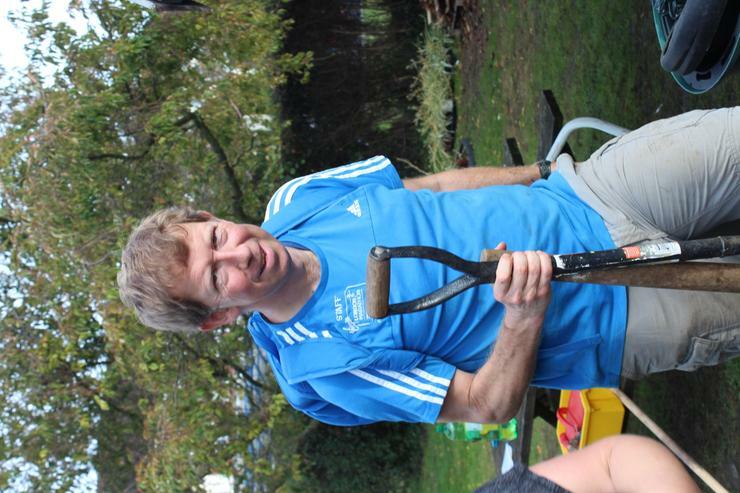 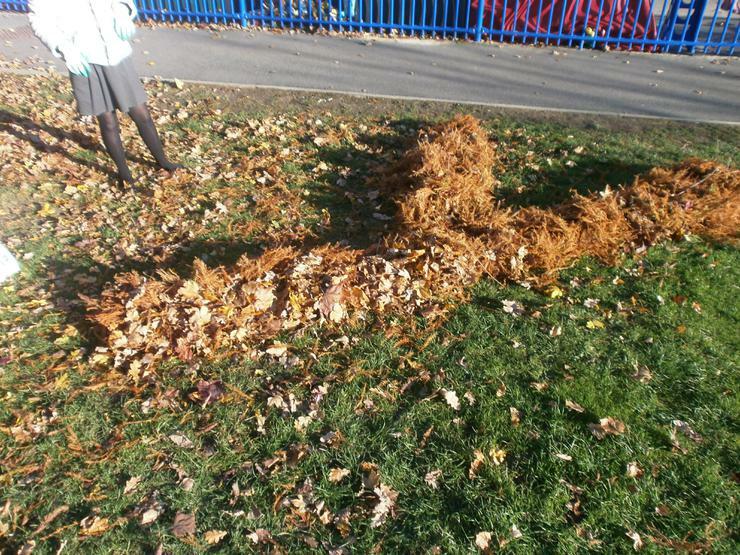 Who would have thought clearing up leaves could be such fun! 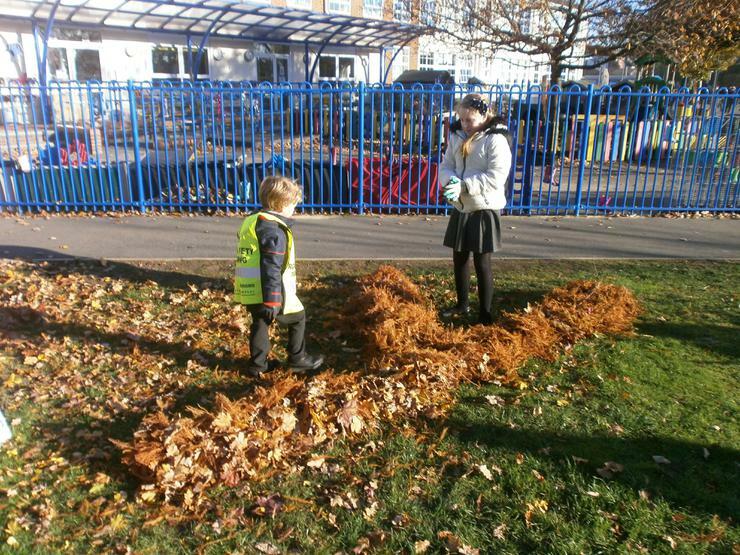 Gardening Club spent a really enjoyable lunchtime today clearing fallen leaves in the garden and our Reception children managed to practice their alphabet at the same time by shaping the piles into different letters. 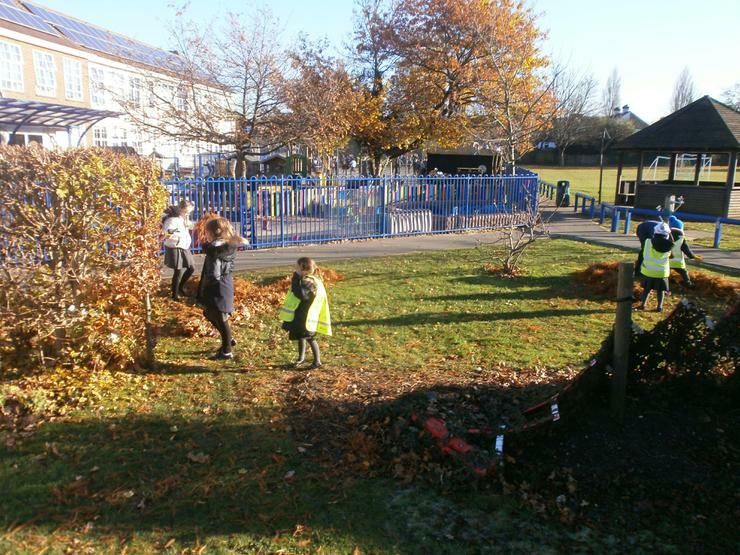 There are still more leaves to come down and we're really looking forward to the next session! 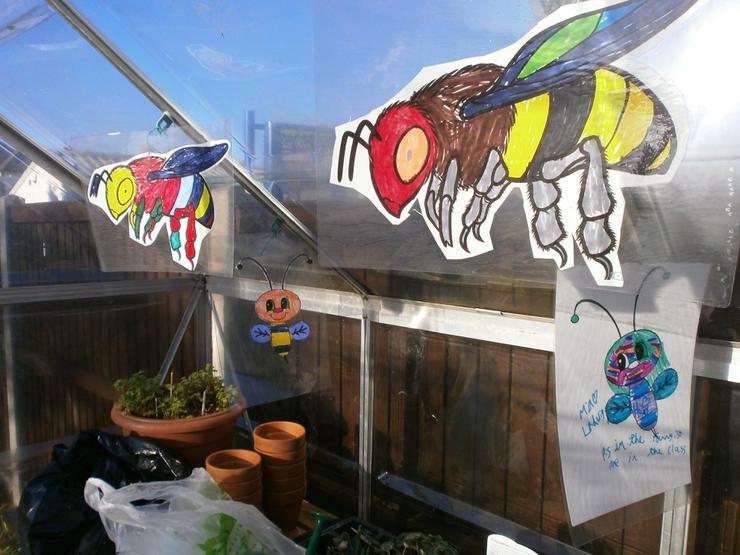 We also decorated our greenhouse with the insects and bugs that we had coloured in - doesn't it look great! 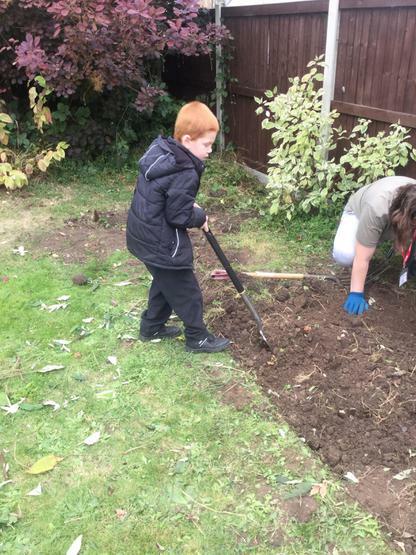 A huge thanks to those parents and grandparents who came along to our Get Your Grown Ups Growing Day today, as you can see from the pictures, they worked really hard and the children loved having their grown ups in school. 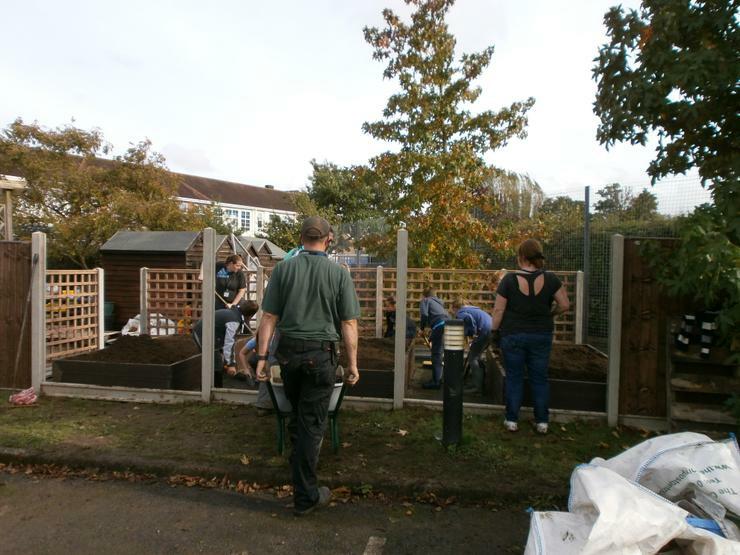 Among many other things, we created the beginnings of a bog garden, which will hopefully encourage lots more wildlife into the garden when we plant it up in the Spring; dug over, edged and planted up a border which should also be welcoming for some colourful visitors and we took out a large section of the hedge to make the garden more accessible to visitors and those just wanting to see what wild and wonderful things are going on in there – take a look next time you’re passing! 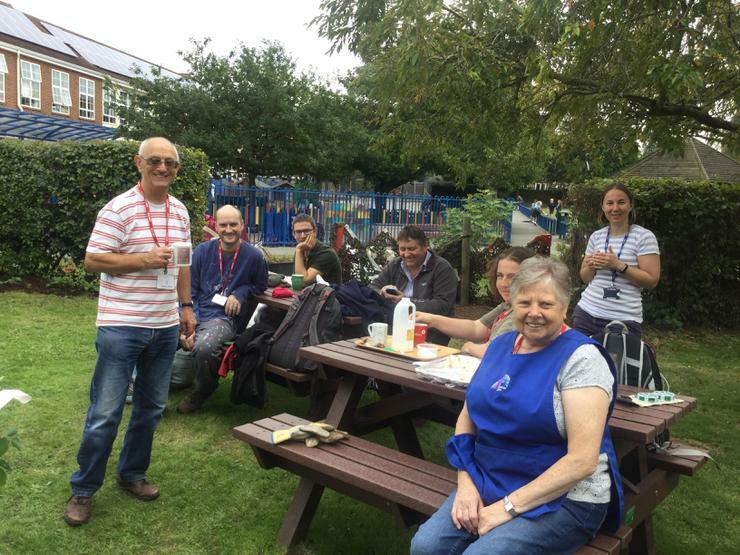 All in all we had a wonderful day and especially enjoyed the delicious platter of sandwiches and cakes that our fantastic kitchen staff provided! 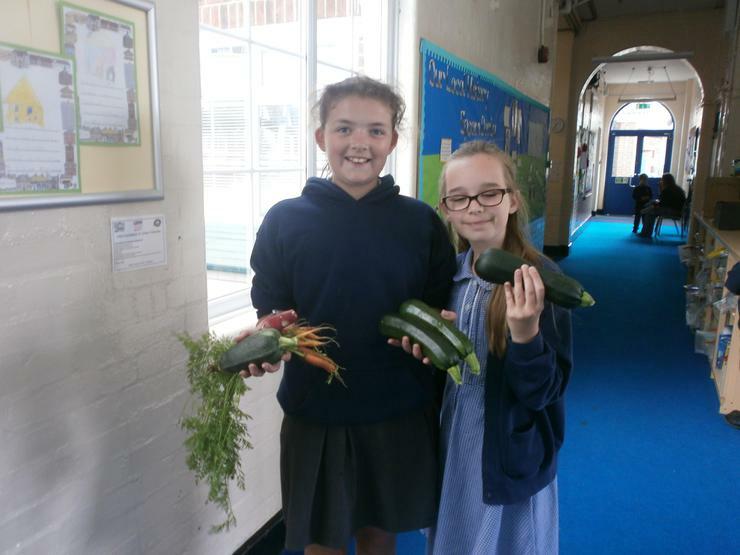 Wow - look at some of the fantastic produce we've picked today! 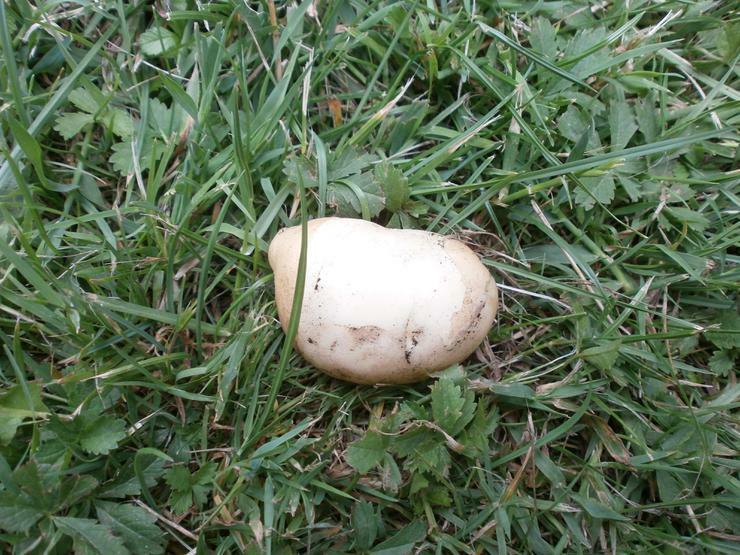 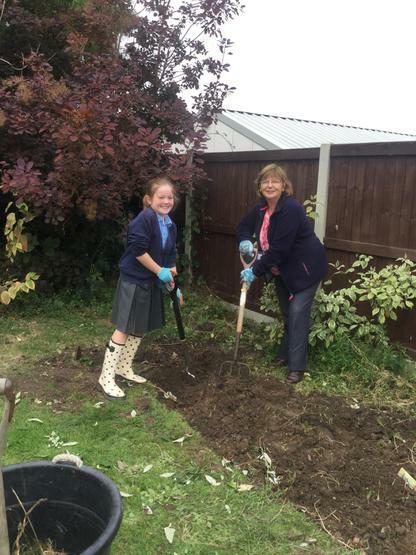 Had such fun in the garden harvesting our potato crops! 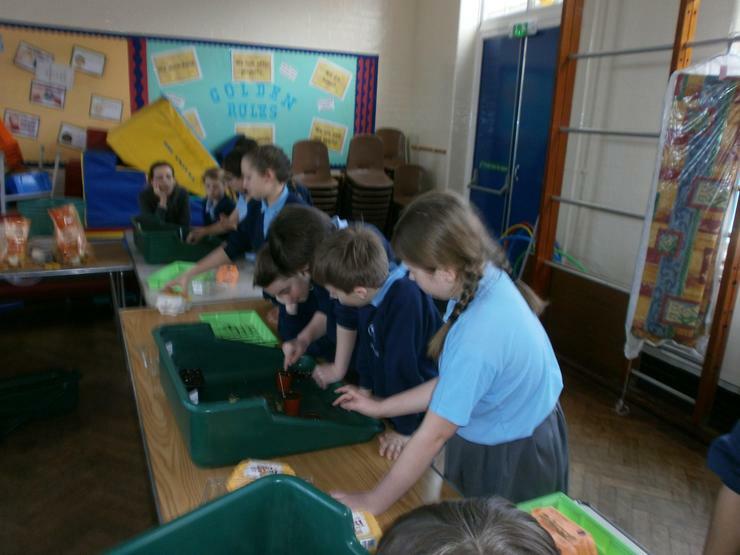 Every class has picked, counted and weighed their crop. 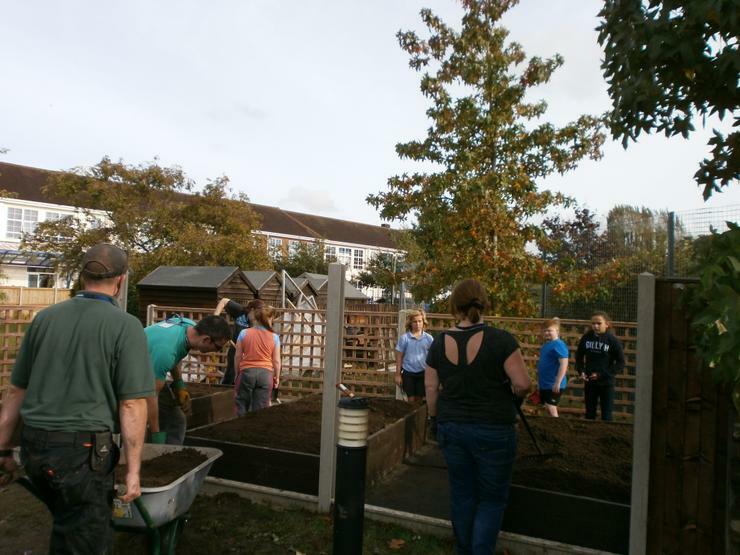 Not quite as successful as last year as the frost got to them early on - however we're really proud of everybody for a great job done and lots of children (and staff!) 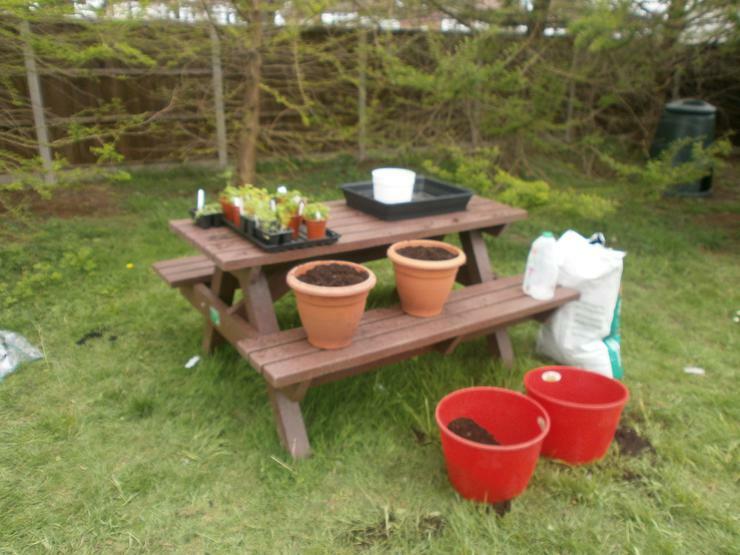 have been inspired to have a go at home themselves. 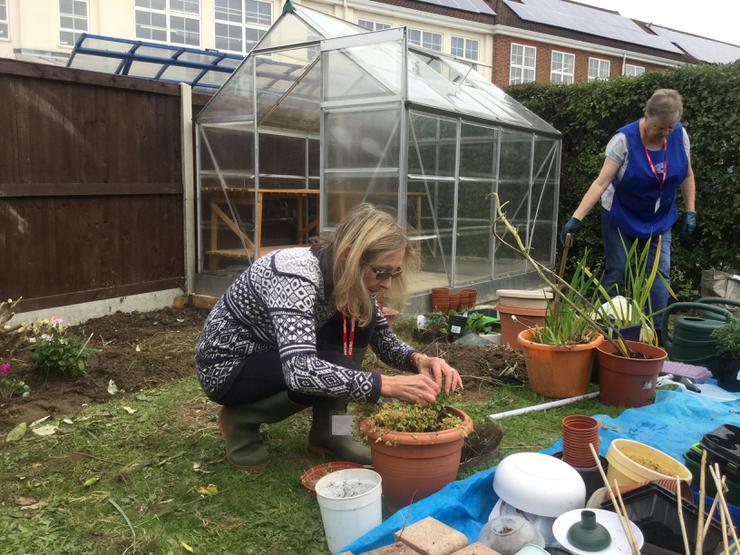 We are really looking forward to our Summer Fayre on Sunday and have been busy tidying the garden - we hope that lots of people will come and take a look at all the fantastic vegetables, fruit and flowers that we've been growing and maybe even get the chance to have a taste! 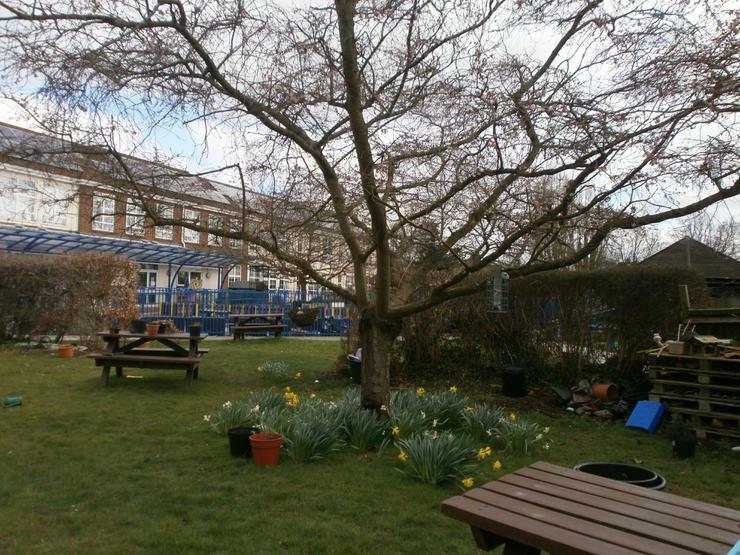 So come and join us for a cup of tea, slice of cake and maybe more in our garden on Sunday! 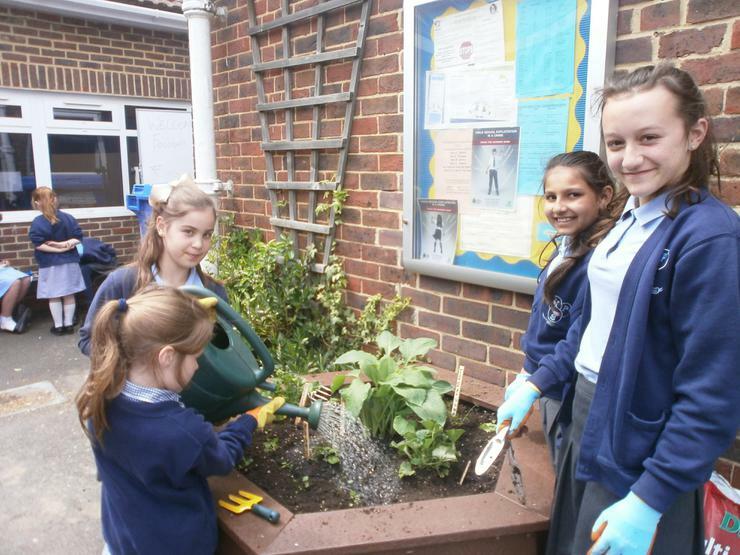 Another busy day for Gardening Club today. 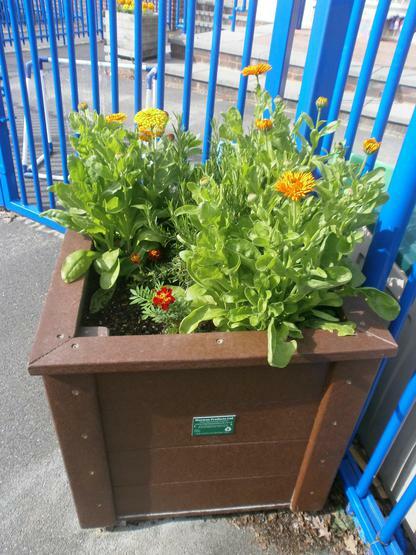 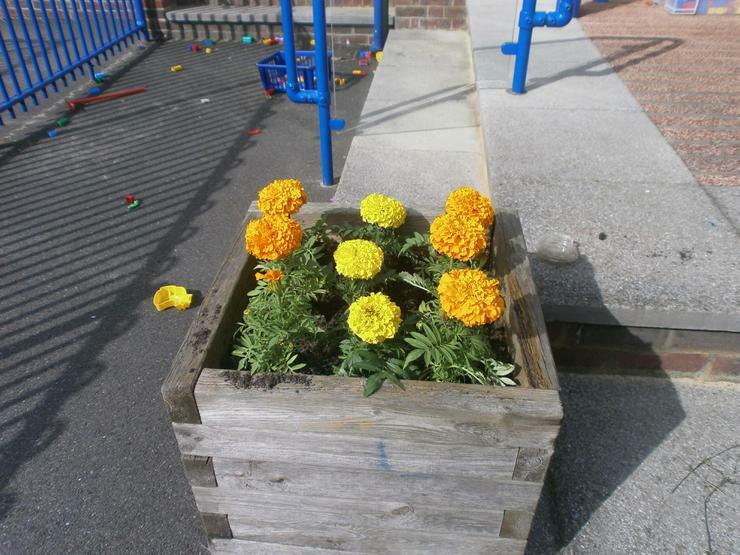 As well as lots of jobs in the garden, they've also put some beautiful looking marigolds in Reception's outside area and as you can see, the various tubs and pots around school are starting to look wonderful thanks to their hard work. 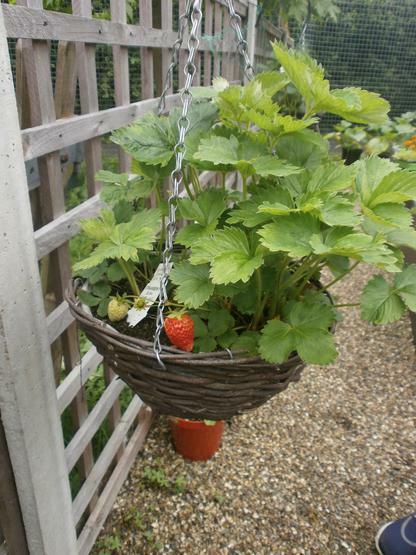 The mix of sunshine and rain continues to do wonders for our garden and as you can see we have some wonderful looking crops from fantastic courgettes to delicious looking strawberries and lots in between! 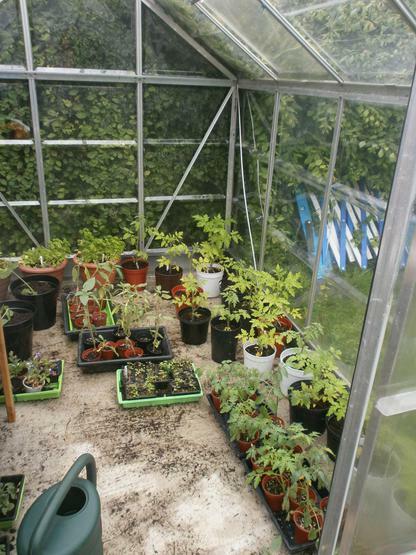 Our new greenhouse has proved invaluable and as you can see is full of great looking tomato plants at the moment. 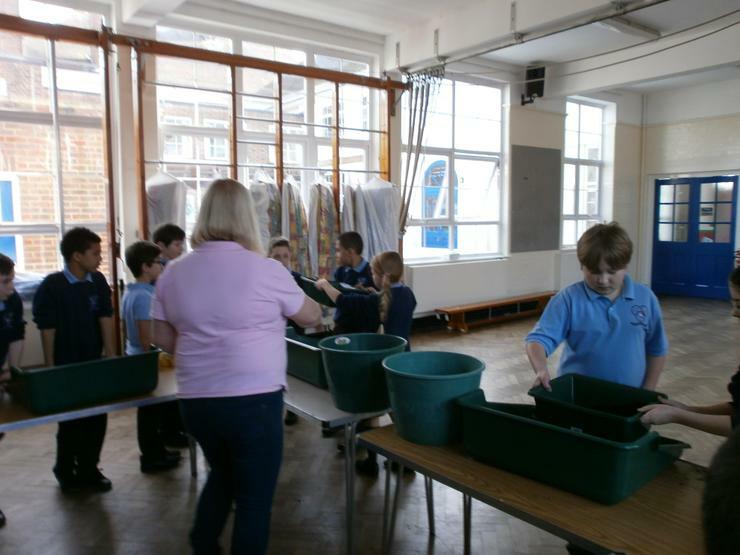 we're just waiting on delivery of some more shelving, paid for by generous contributions to our School Trust Fund. 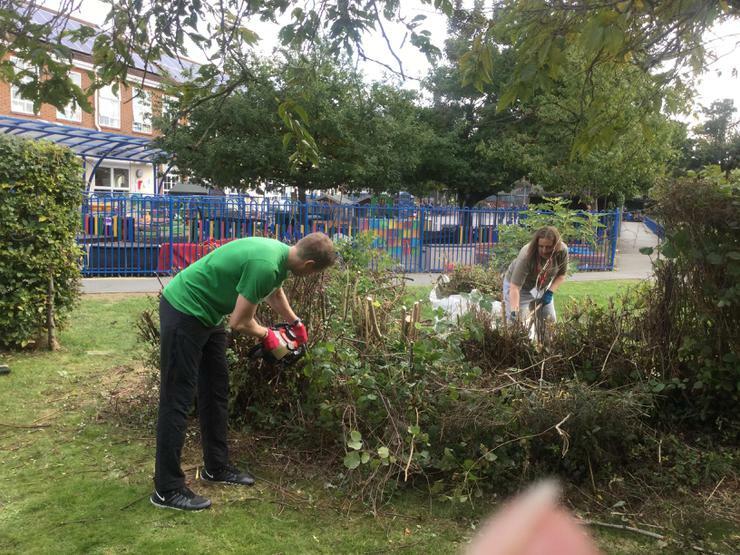 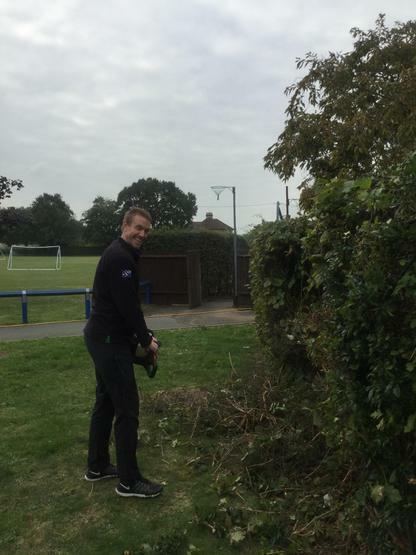 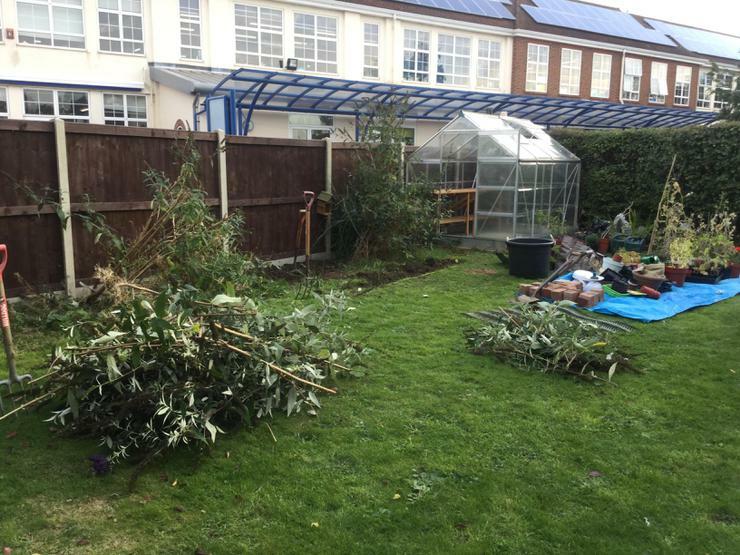 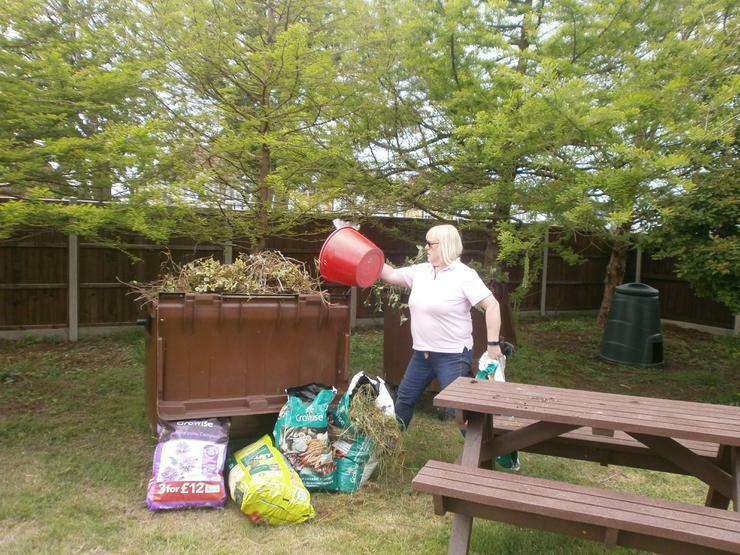 We are really grateful to the staff and children from the Holiday Play scheme and Mrs Smith for looking after the garden during half term - they've done a great job! 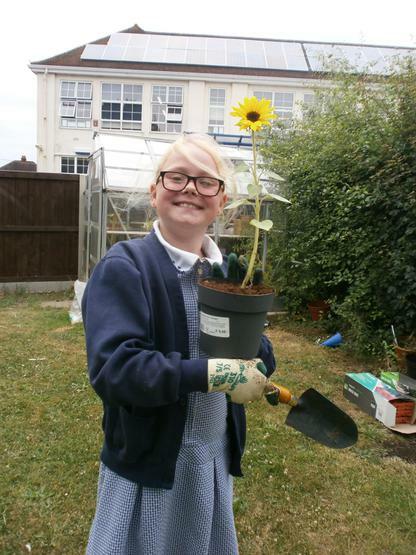 Gardening Club are raring to go as they have missed the last 2 weeks due to half term and the Inset day yesterday, but there's plenty for them to do in the garden and around school when they meet next Tuesday. 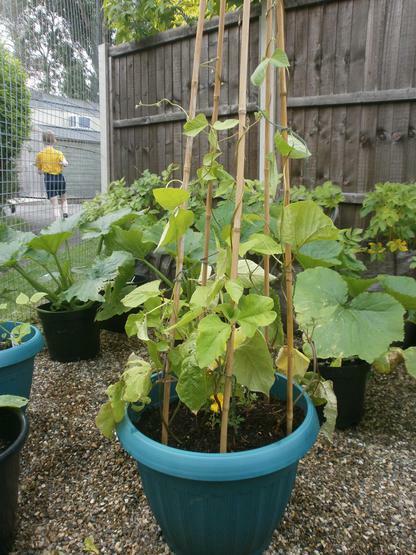 As you can see everything is thriving and we're particularly pleased that all 3 types of bean that we've planted (runner, broad and French) are coming on well. 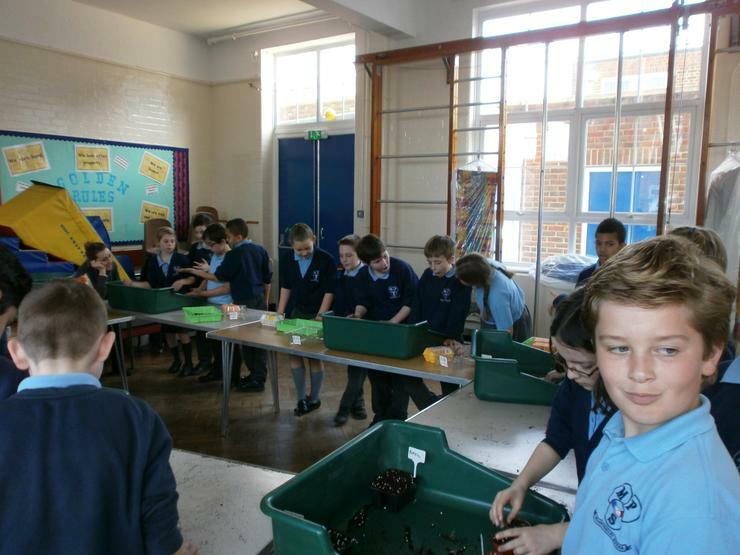 We've even started to make our first harvests! 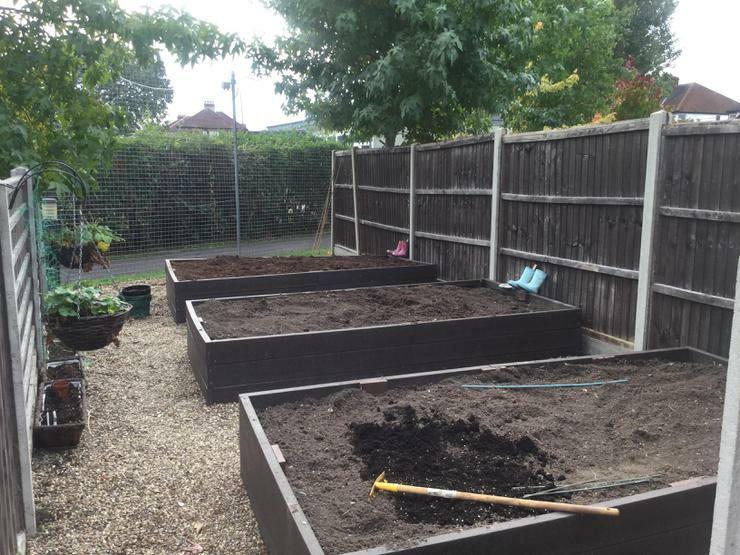 The rain last night has given the garden another good watering and although some of us got a little muddy, we've had a fantastic day in the garden today and got so many jobs done! 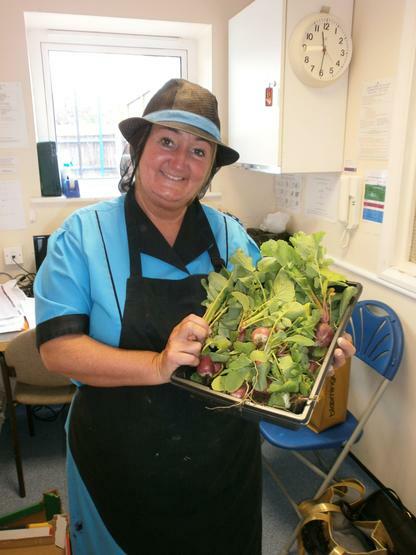 Mrs Flower was back for her last session with us this year which is really sad, but we hope we will do her proud again like last year with another bumper crop of fruit and vegetables - she has told us that she is very impressed with what we've achieved so far and that we should be very proud of ourselves, which we are. 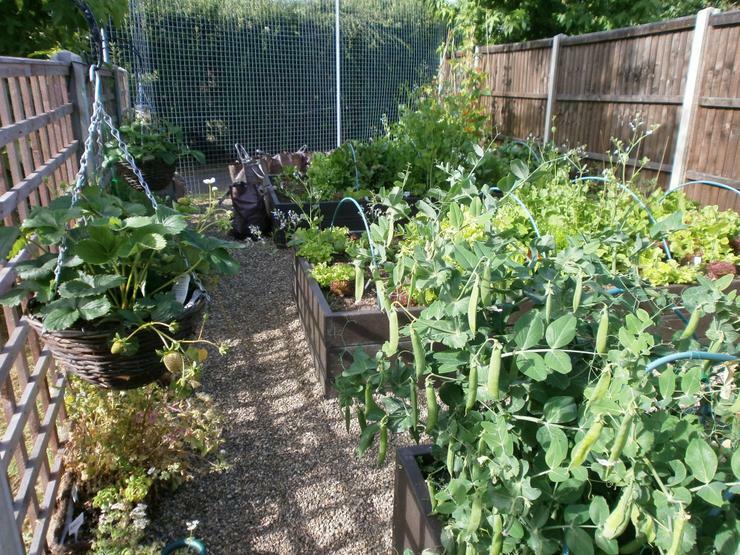 As you can see, we have so much going on in the veg beds and greenhouses: lettuces, radishes, courgettes, peppers, tomatoes, spring onions, runner beans and marrows to name but a few. 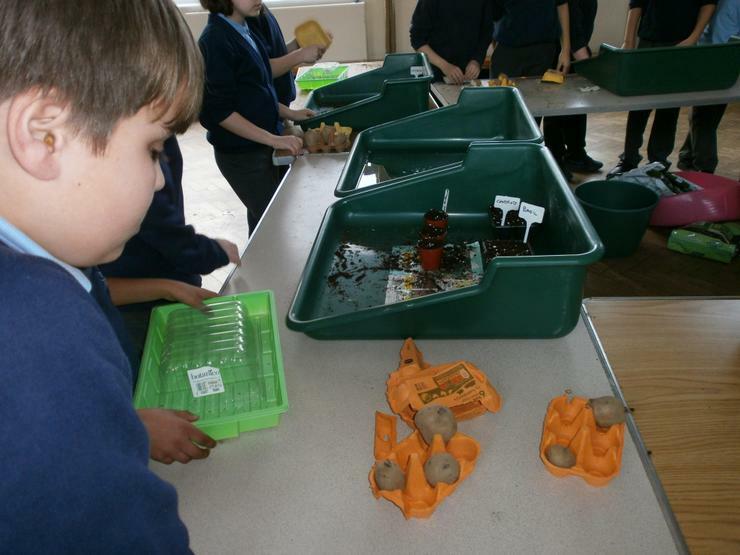 Each class has it's own 'sack' of potato plants that it has nurtured from tubers and we hope these will be ready soon after half term - we can't wait to harvest them and see which class has produced the best crop and hopefully Mrs Morgan and her team in the school kitchen will turn them into delicious potato wedges again for us! 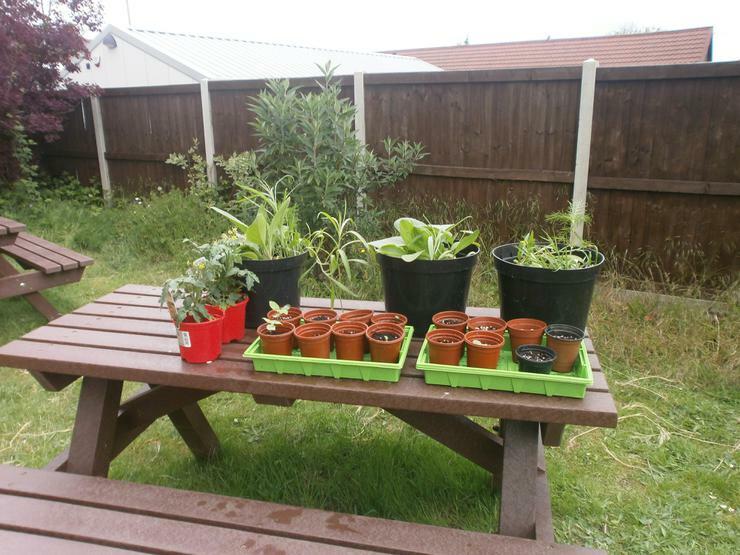 We've also planted sweet peas, marigolds and lots of other plants to attract some beautiful butterflies and we now have a resident robin who we often see hopping around the garden. 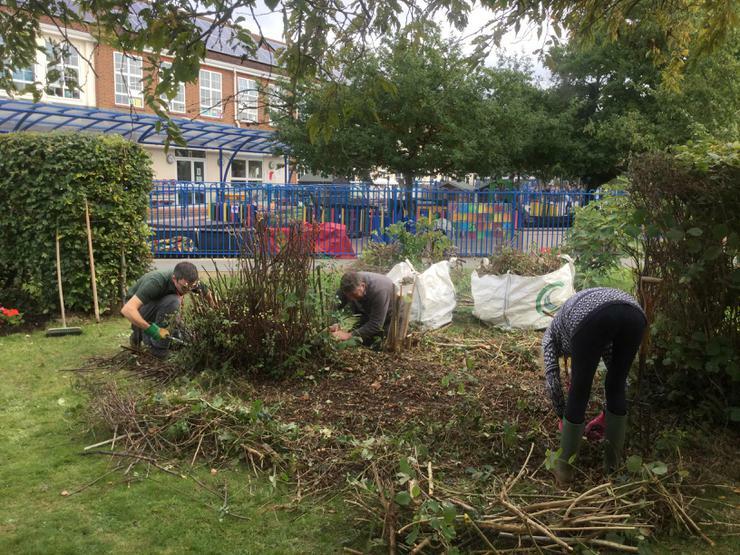 We've had a good tidy up today and managed to clear lots of weeds from one of the borders in preparation for planting out our wonderful sunflowers - make sure you take a peep regularly to see how these are getting on! 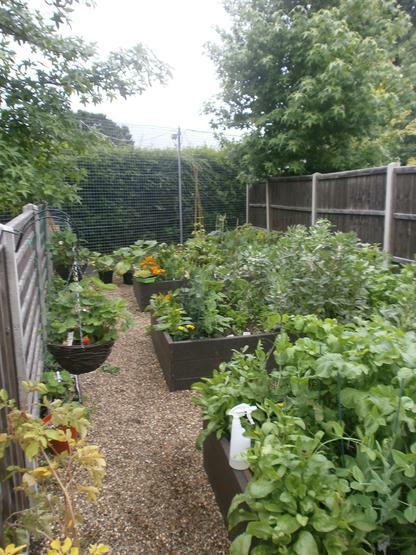 All the wonderful rain recently has given our plants and vegetables a lovely watering and they are looking really healthy and sturdy! 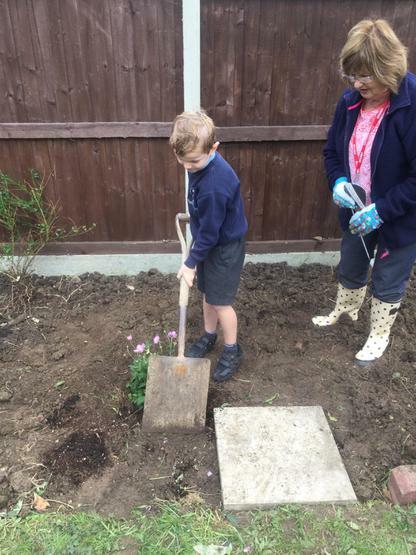 Mrs Flower has been in today and we have been busy in the allotment - we missed her visit last week due to the rain but have been working hard today to make up for it. 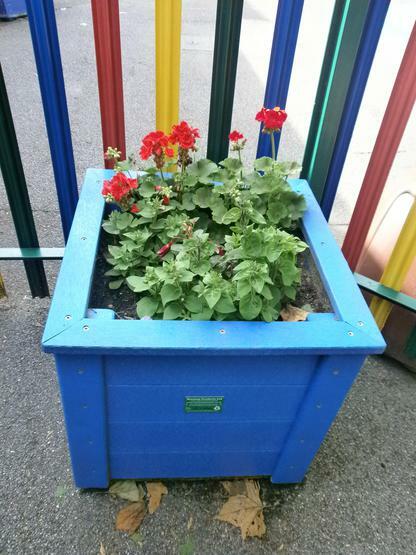 Gardening Club spent lunchtime planting up some of the tubs at our 'linkway' entrance and we hope to have a lovely display for the summer - we've used the colourful plant labels that we made ourselves so that everyone can see what we've planted, have look next time you're passing! 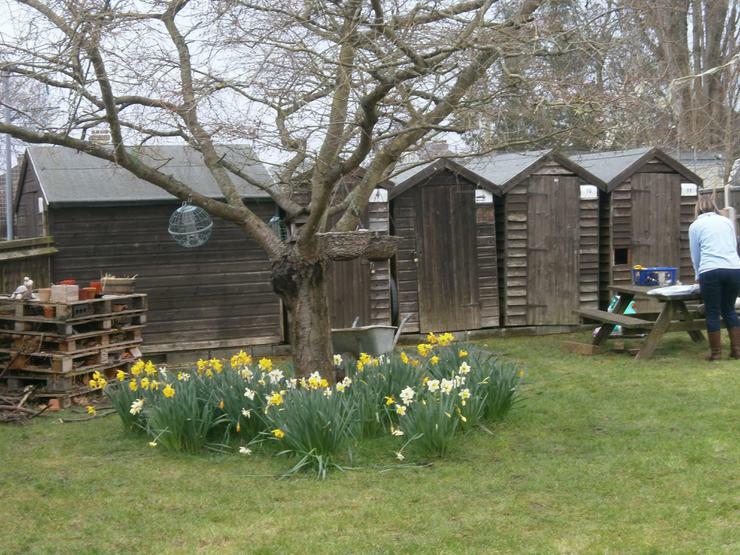 After all the lovely sunshine at the weekend, it's been raining all day! 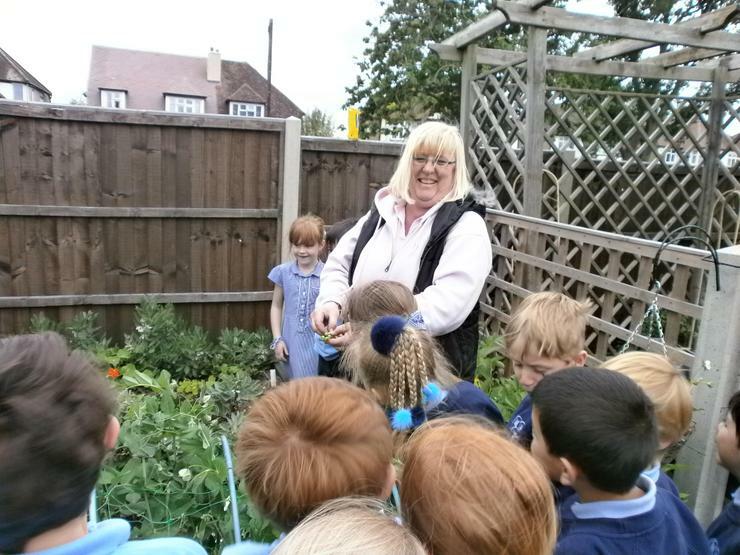 We're really sorry that we've therefore had to cancel Mrs Flower's session today, but look forward to her visit next week. 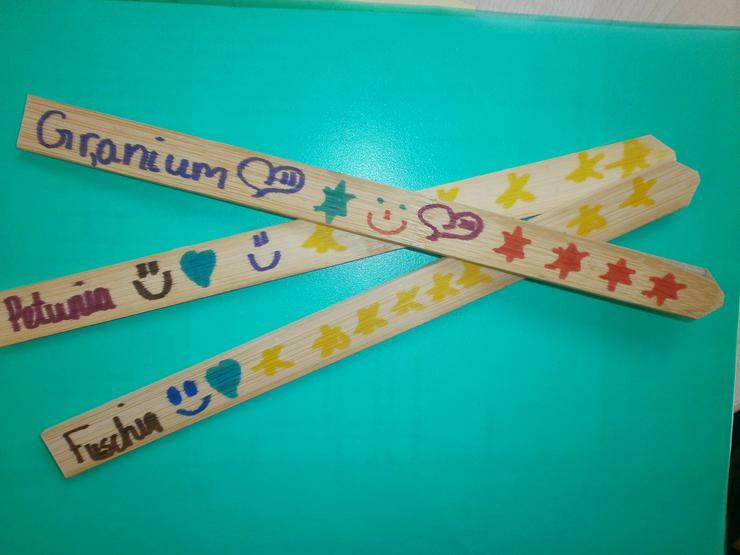 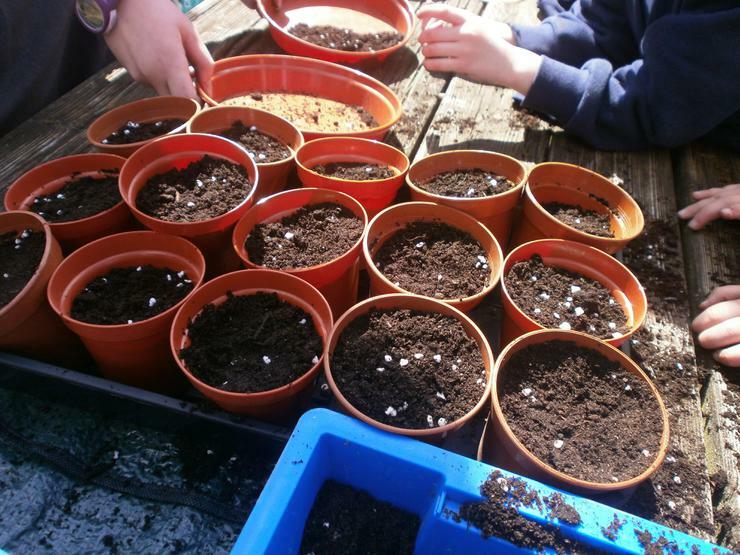 Some of the gardening club have been inside making some fantastic colourful plant labels that you'll see round and about school in the pots and tubs shortly - they look wonderful! 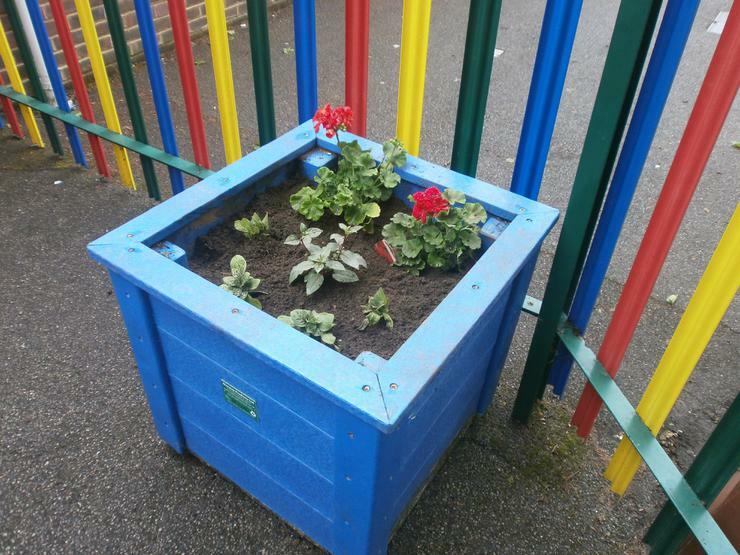 Others braved the drizzle and planted some lovely geraniums and other plants in the tub outside the main door - our visitors will soon have a bright, cheerful welcome as they arrive! 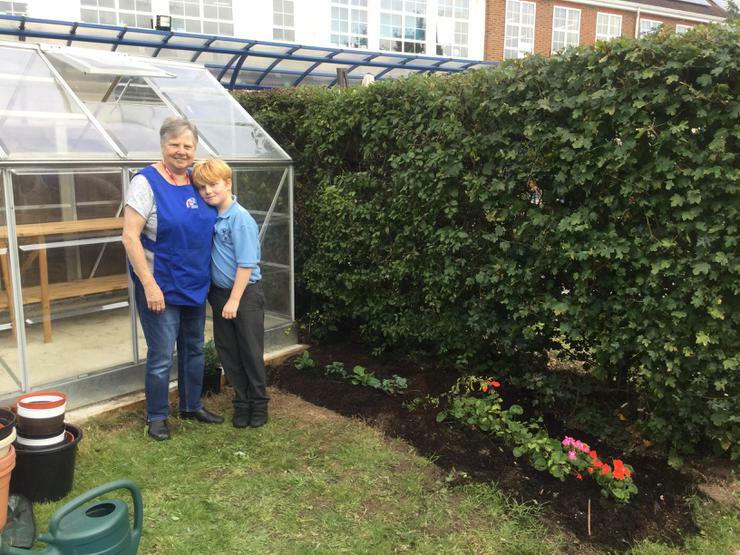 Gardening club have been busy again this week looking after all the seedlings in the new greenhouse, the new plants in the planters around school and keeping the garden area looking good. 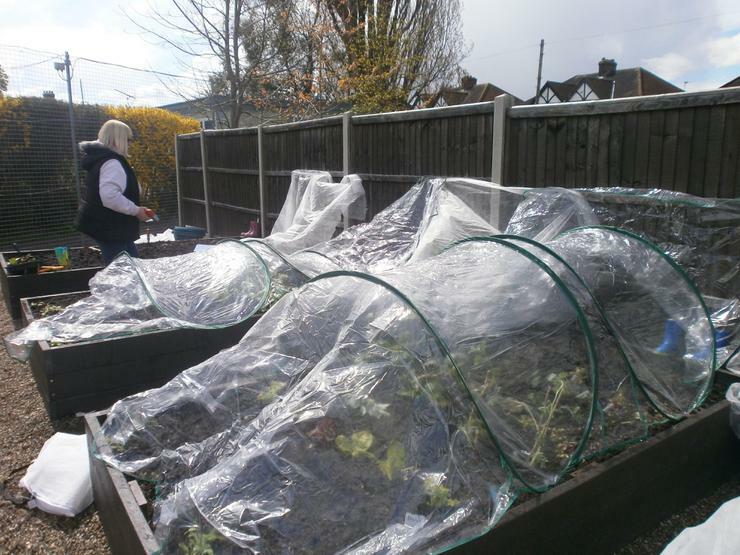 We love our new greenhouse and are really making good use of it. 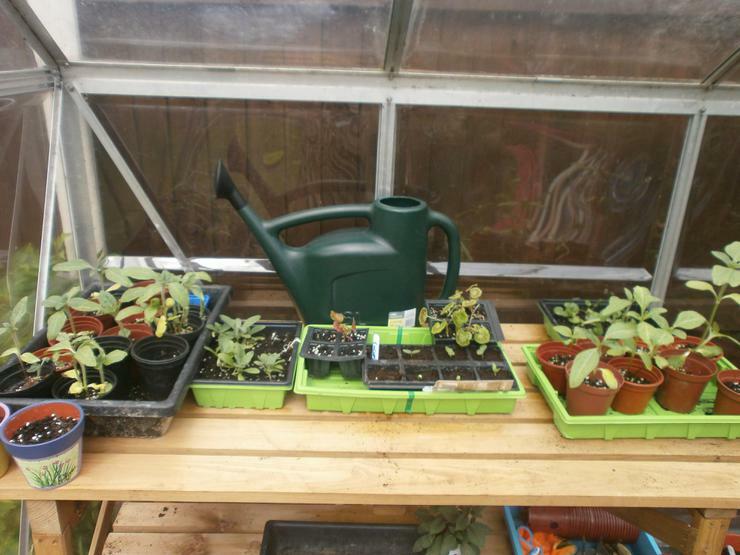 Mr Roy has built us some shelves in our gardening shed and it's now looking very neat and tidy! 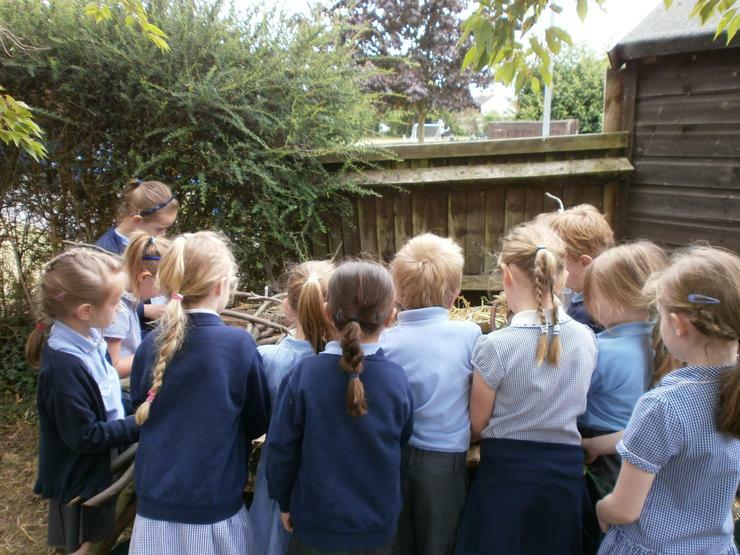 At last we've been able to enjoy our first session outside in the garden with Mrs Flower. 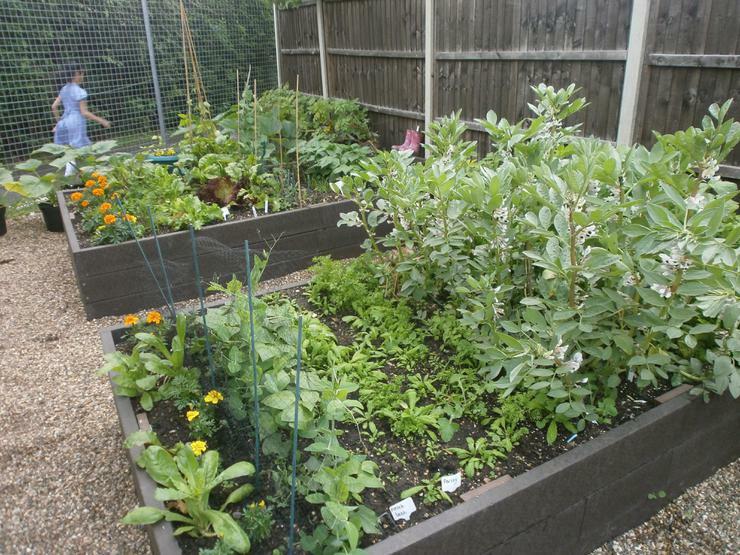 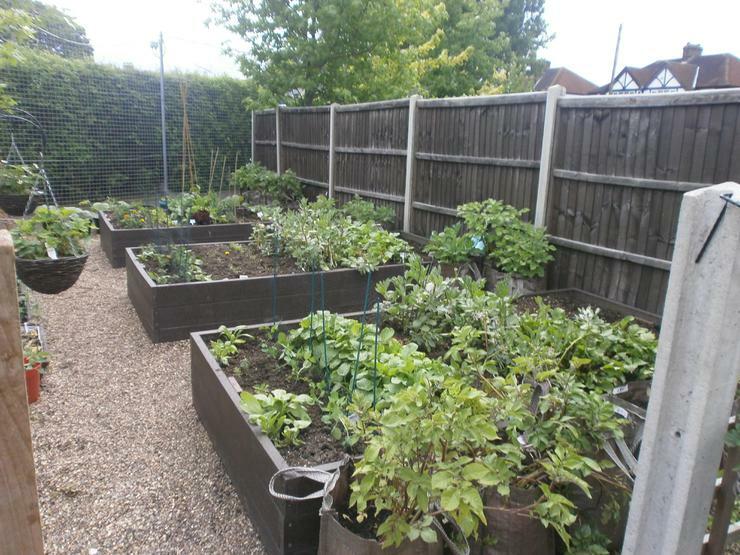 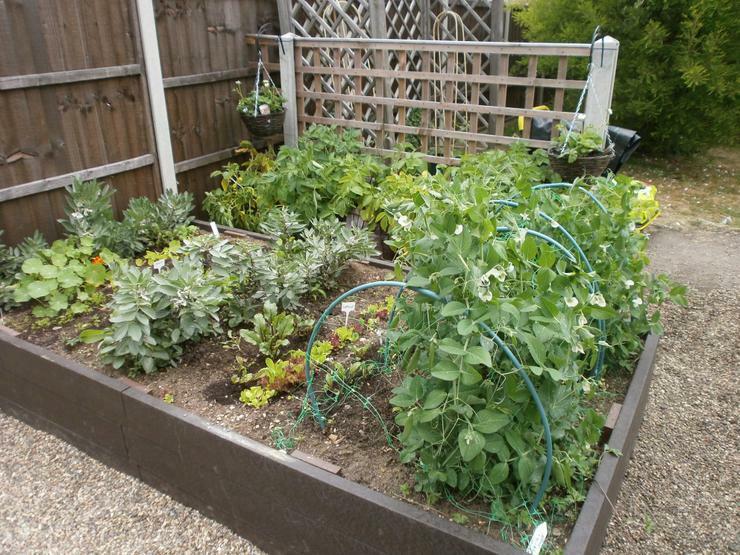 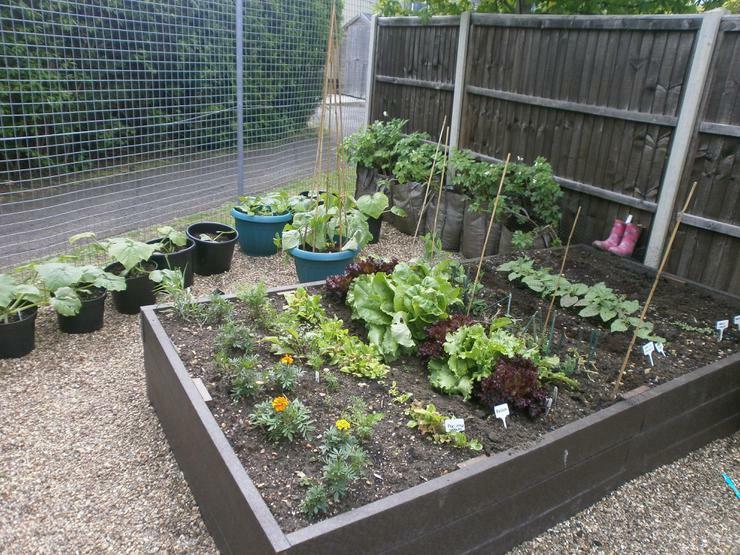 As you can see from the 'before and after' pictures below, some of the salad and vegetables we have grown are now ready to be planted outside as the risk of frost has passed and the beds are starting to fill - don't they look great! 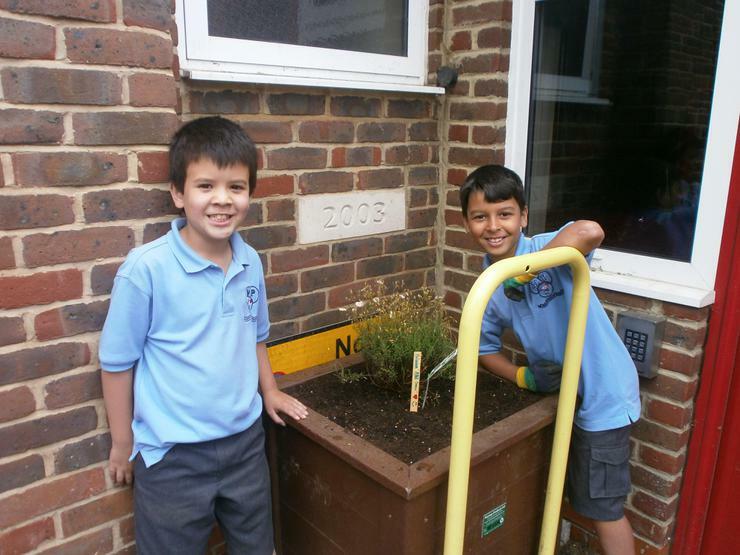 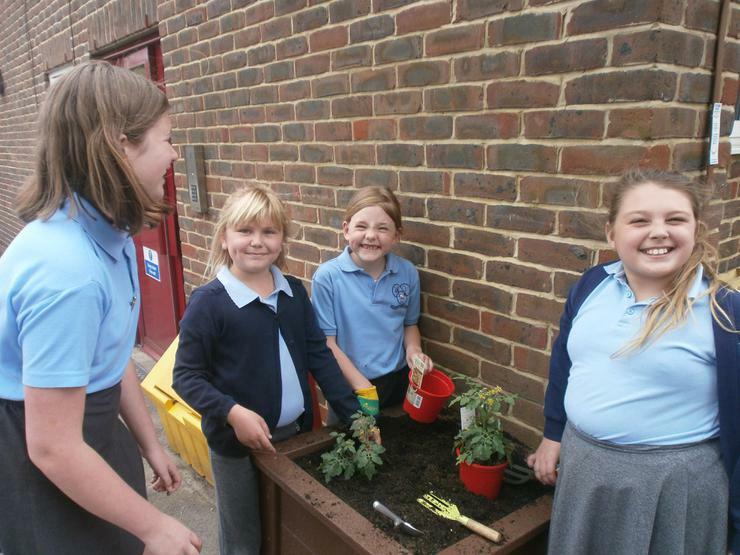 The gardening club have been busy this week planting nasturtiums and herbs, including some fragrant Rosemary in one of the pots outside the Reception classes outside area - we hope they enjoy the lovely smell ! 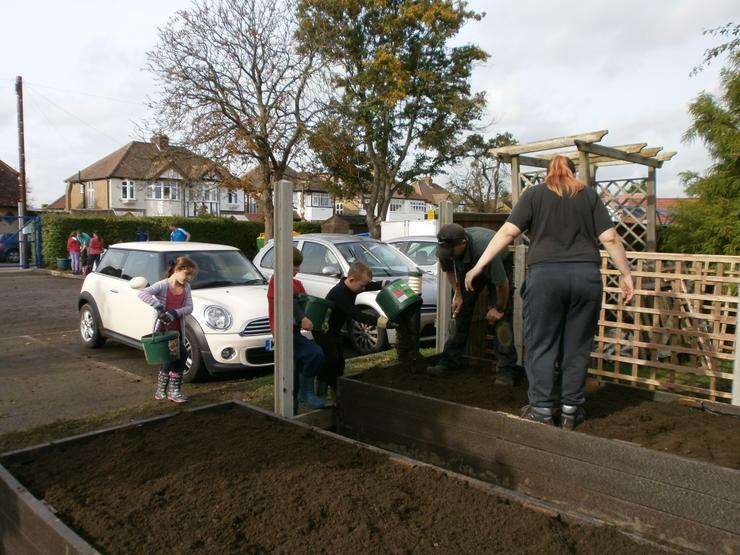 We've also tidied up the vegetable area and started to prepare the beds ready for planting out some vegetable and salad seedlings with Mrs Flower next week. 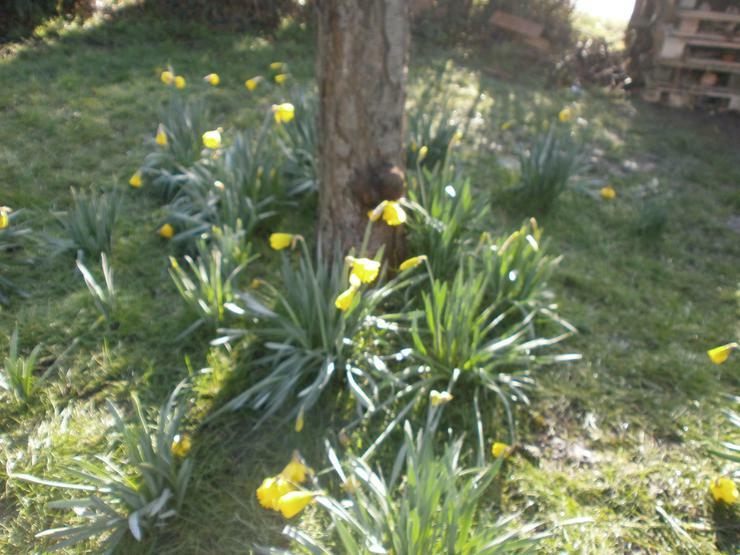 The daffodils have now finished after providing us with a lovely display this spring and we've been dead-heading these - but as you can see we still have lots of lovely colour with beautiful bluebells, cherry blossom and lots more. 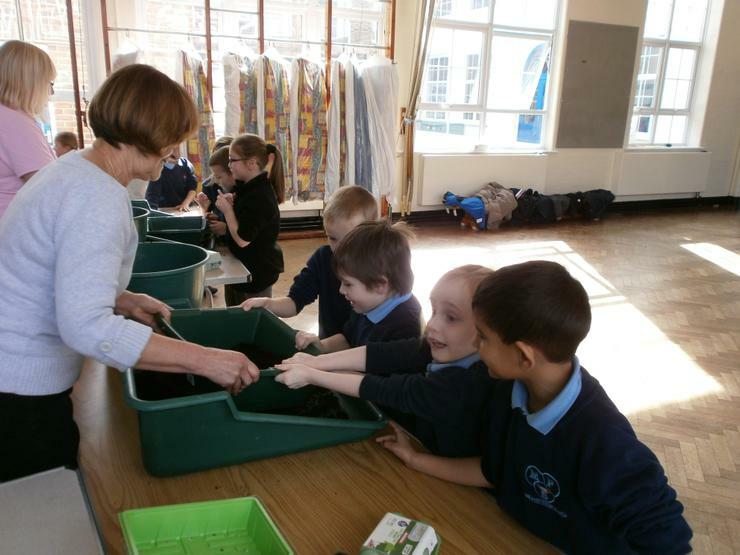 We've enjoyed Mrs Flower's third visit of the year today - she was very impressed with the good job we have made of looking after the seeds and potato chits we prepared during her last sessions! 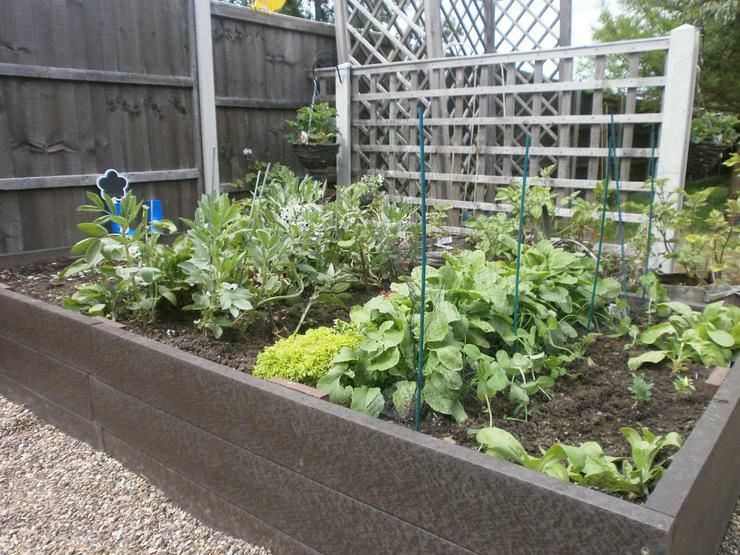 We are looking forward to the warmer weather when we will be able to get outside into the garden and plant everything out into the vegetable beds. 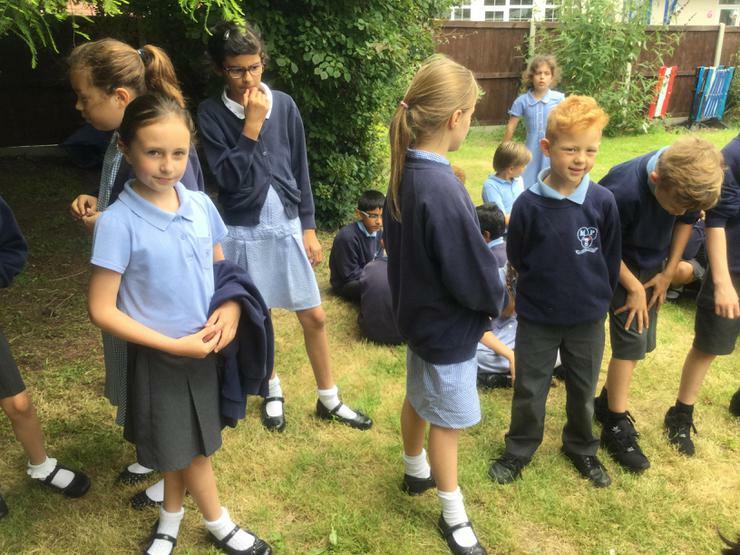 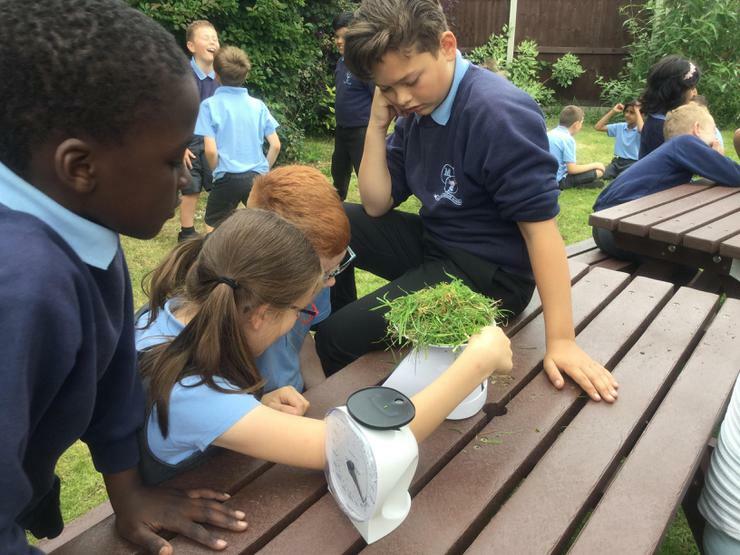 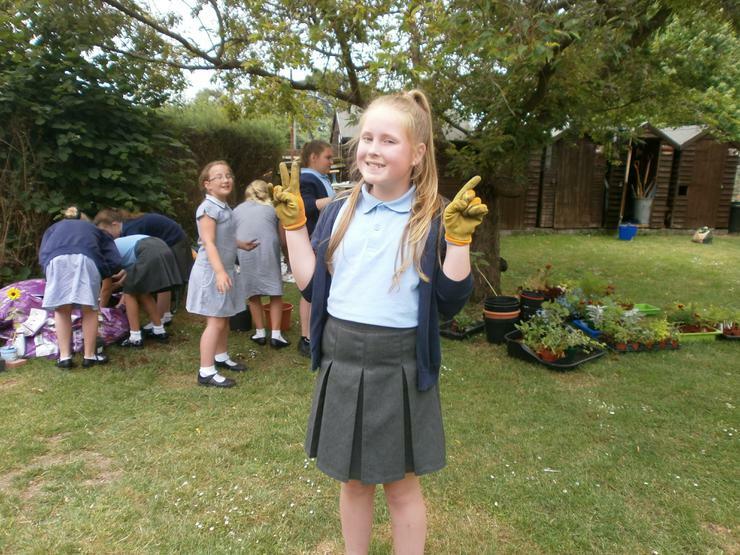 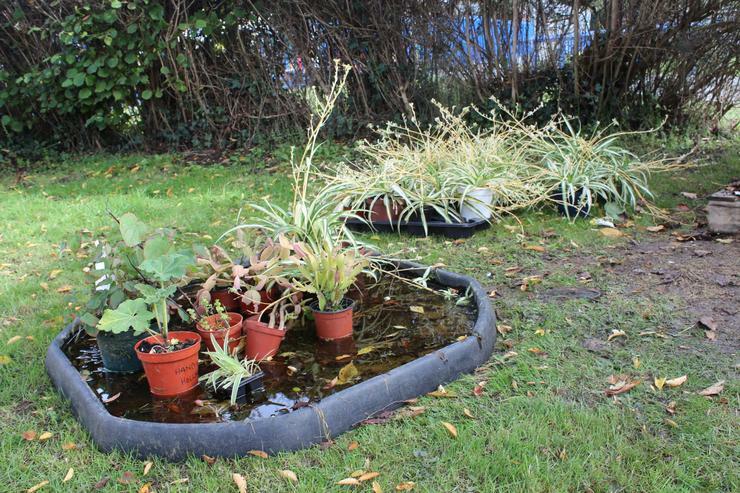 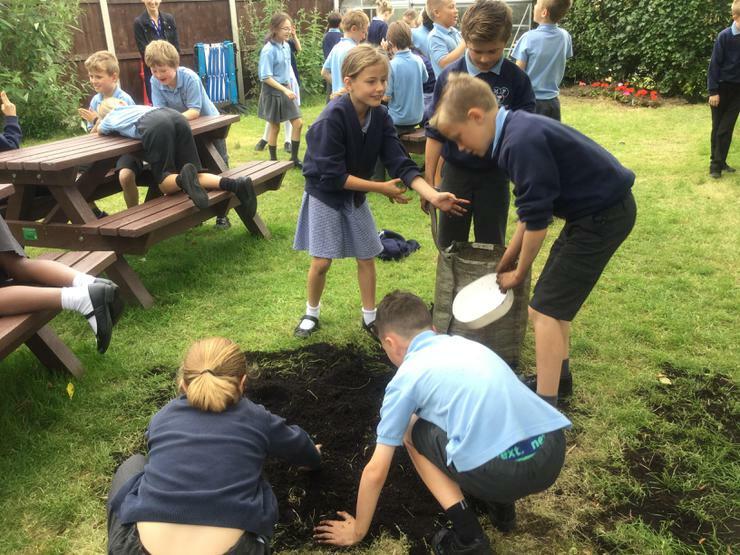 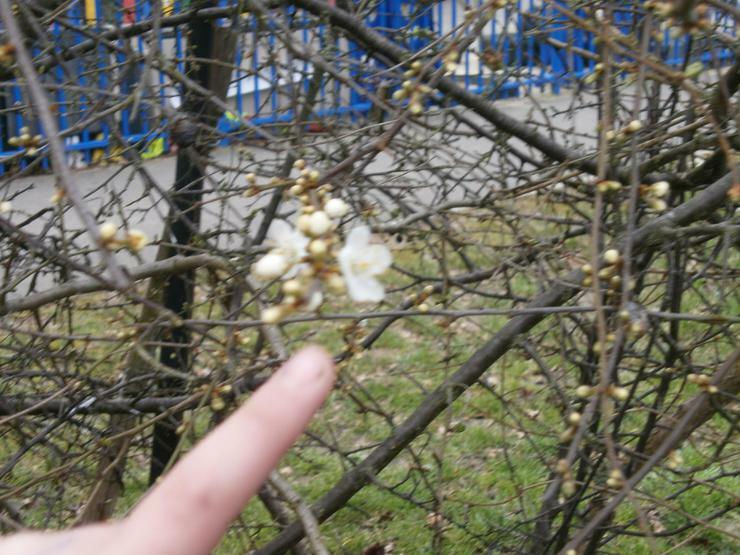 Our Gardening Club is up and running again this year under the enthusiastic guidance of Mrs Smith, our new gardening coordinator, and we are really enjoying spending time in the garden and around school getting ideas for what we can do to make things bright, interesting and colourful for everybody to enjoy. 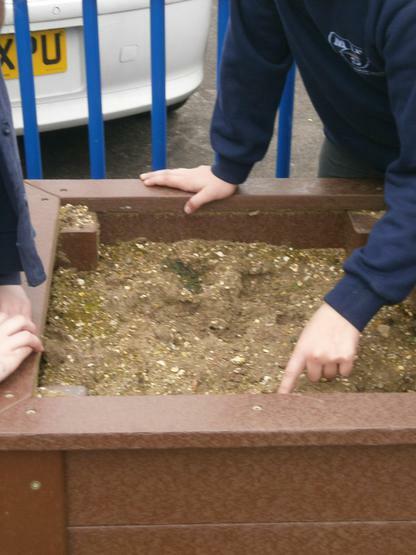 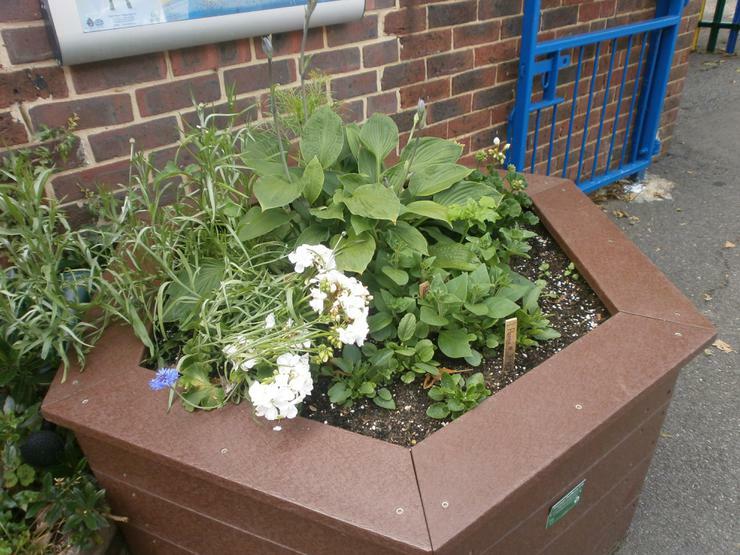 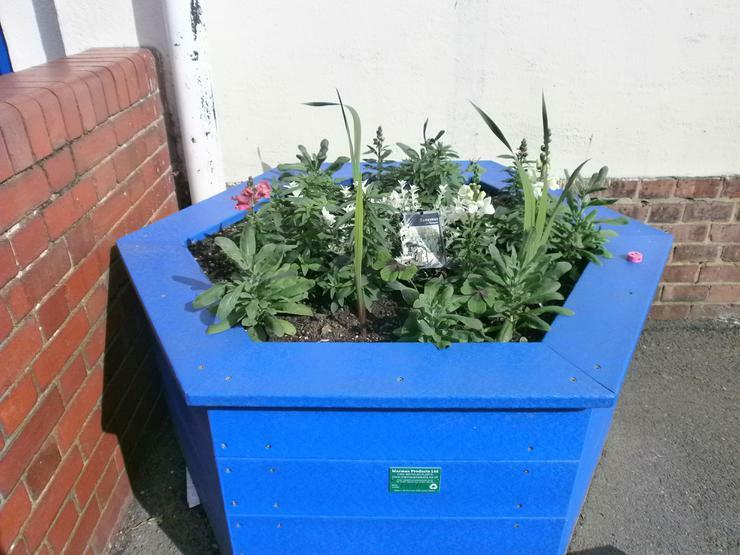 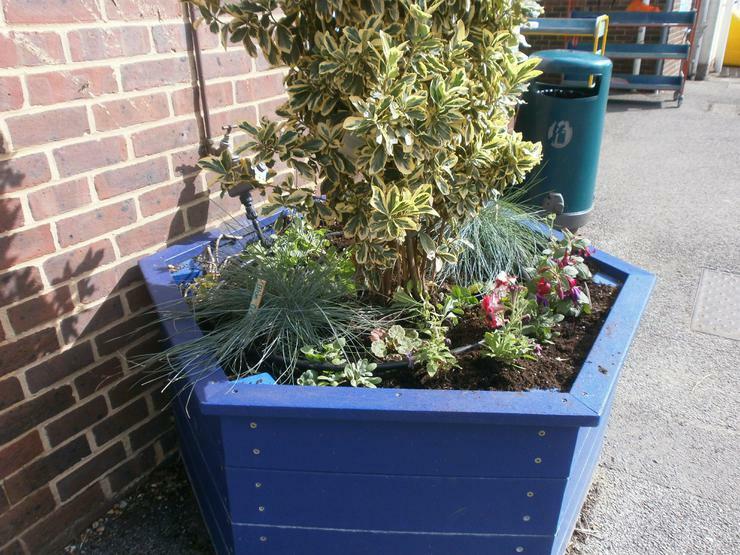 We plan to fill the planters around school soon and have been looking at what kind of things we can plant to attract some wonderful wildlife. 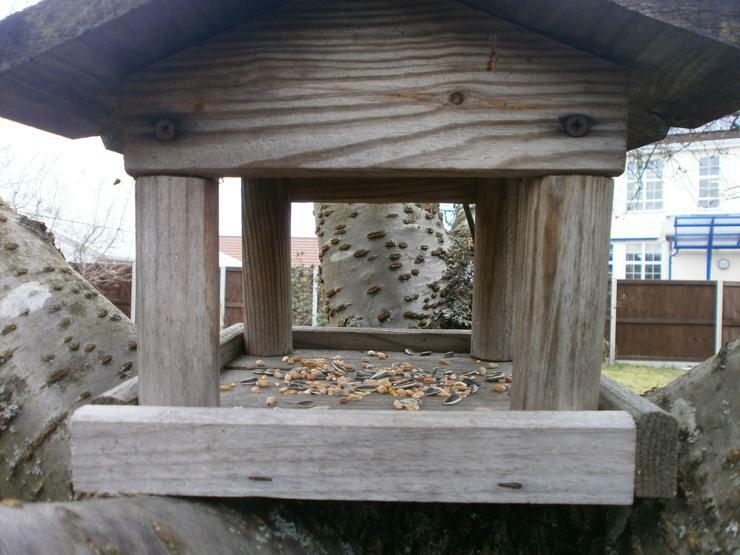 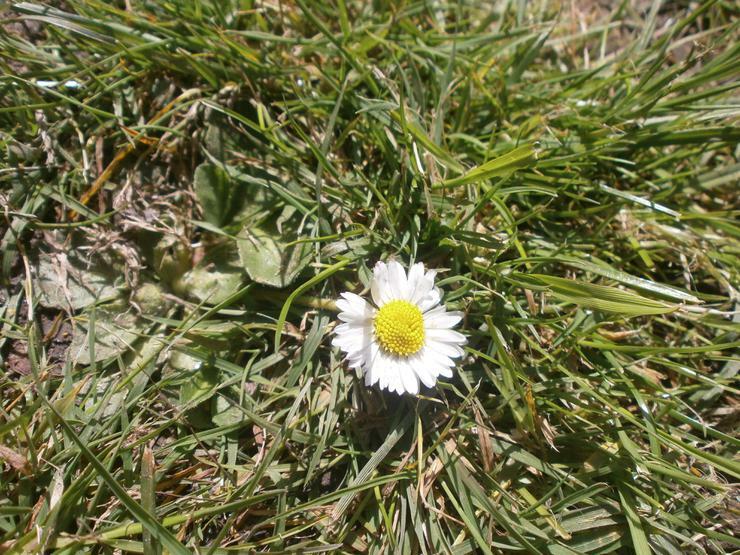 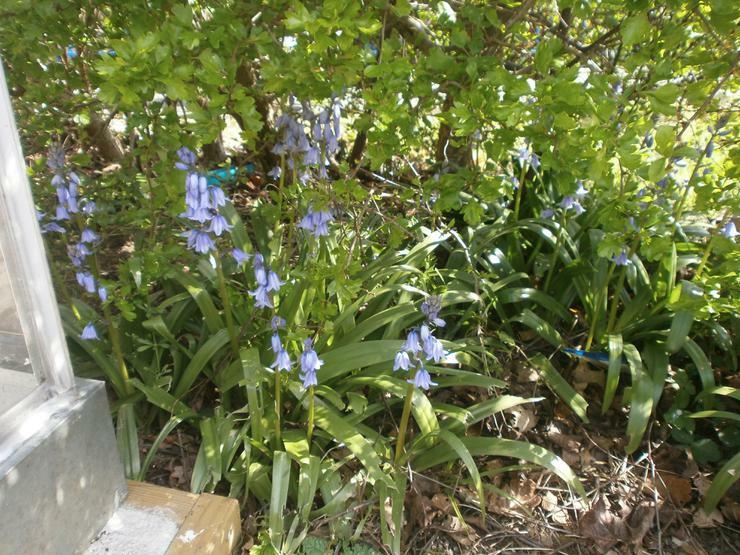 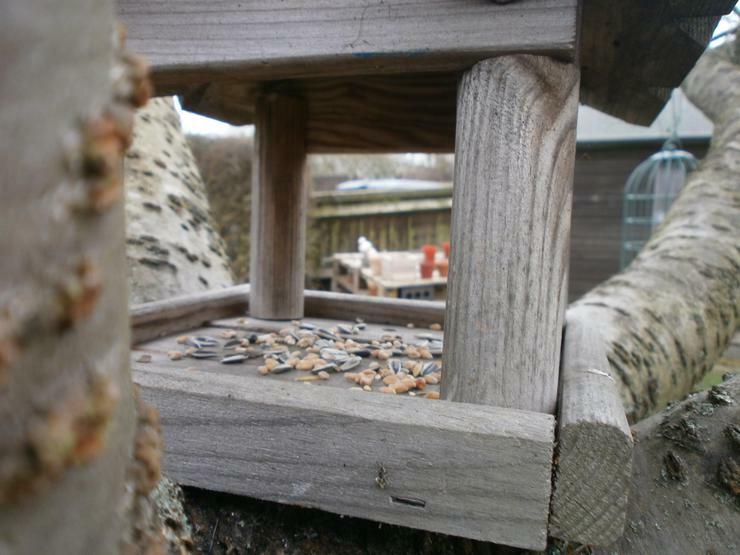 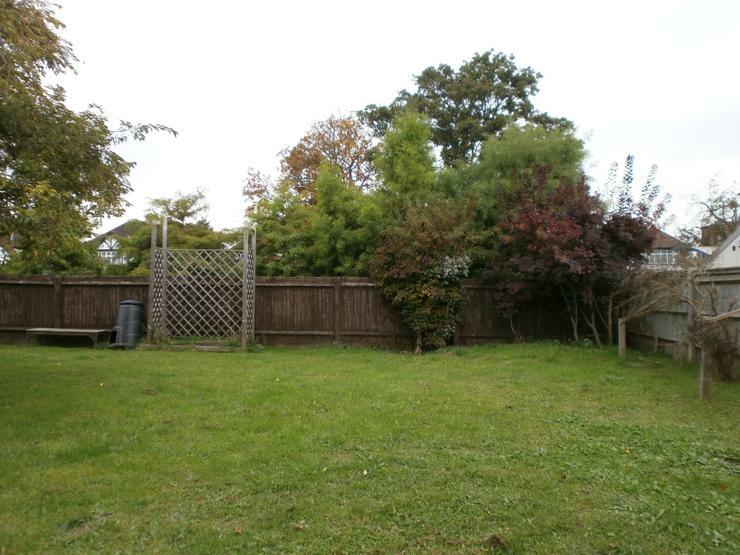 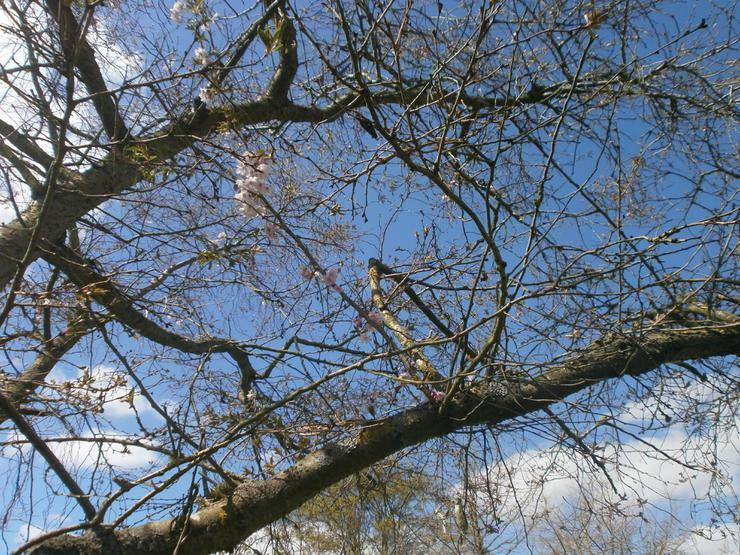 As you can see, we have also been practicing our photography skills with some artful shots of the garden! 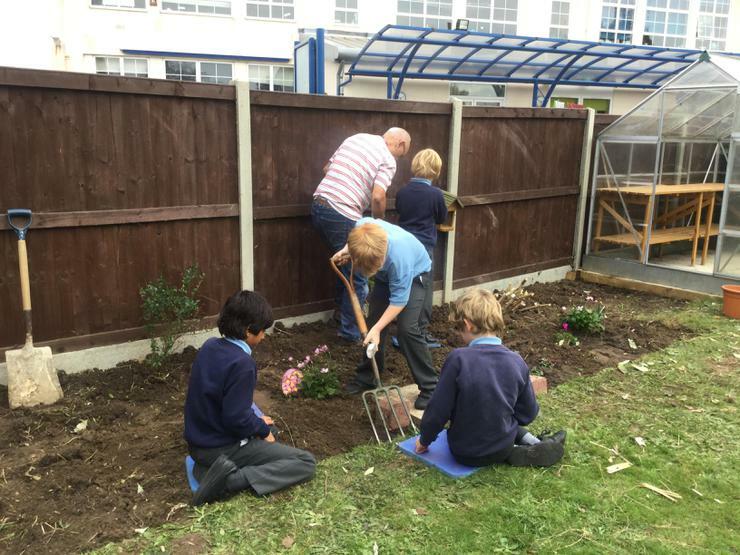 Our gardening club will be working hard over the next few weeks to get everything tidy and prepared for Mrs Flower's visits. 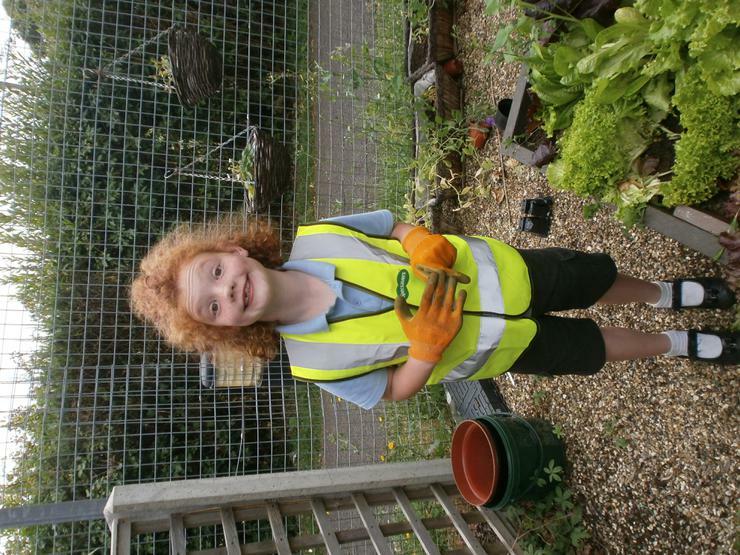 We're really looking forward to working with her again and hope that our fruit and vegetables are going to be as fantastic as last year. 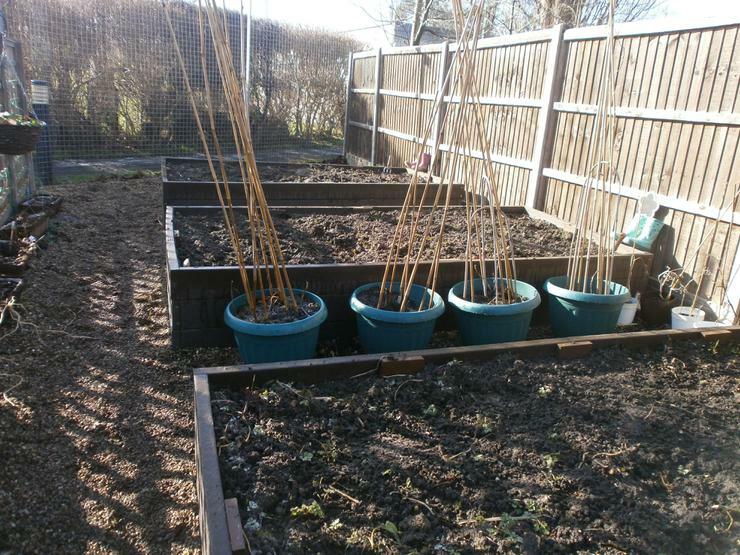 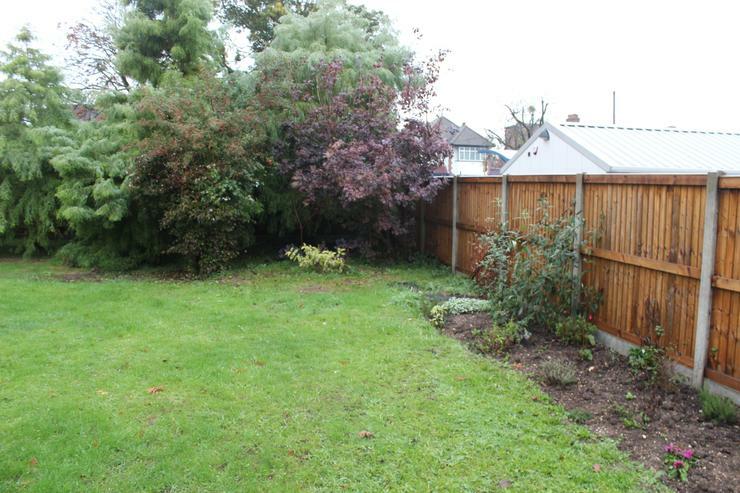 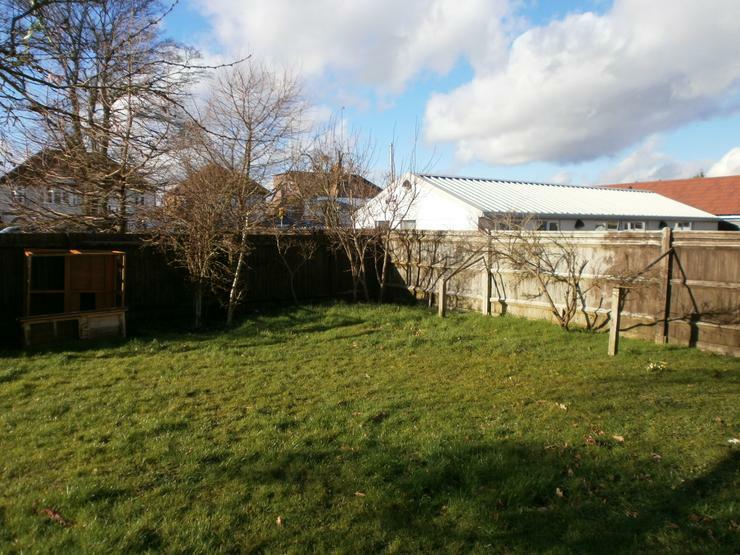 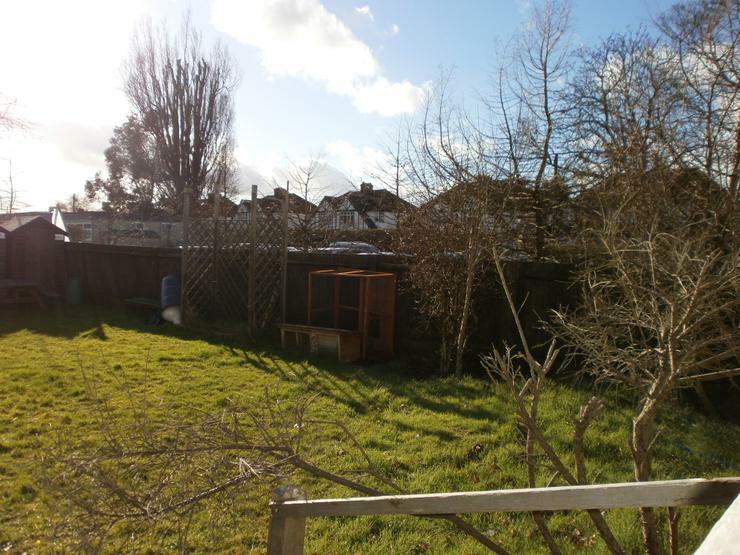 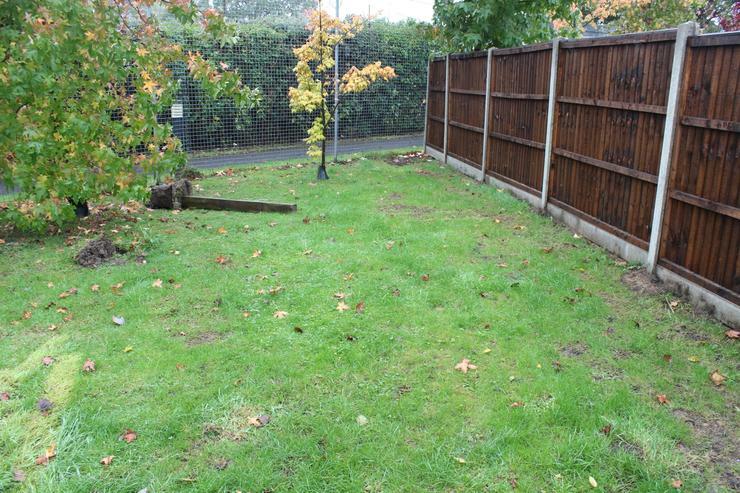 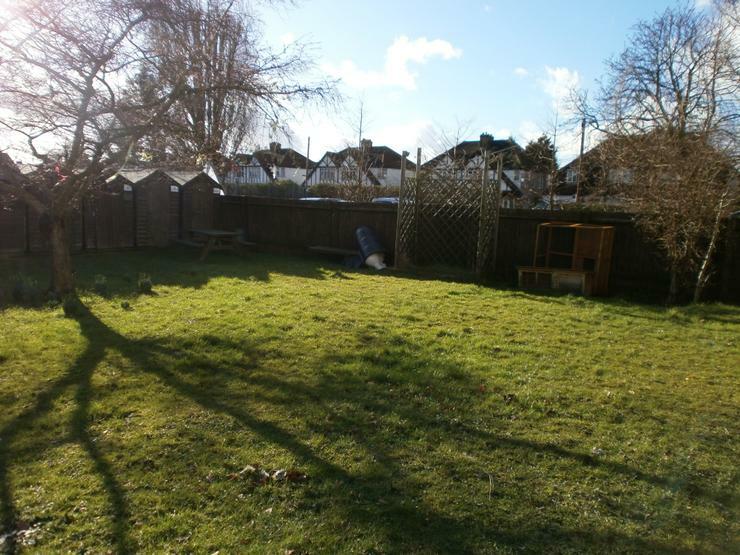 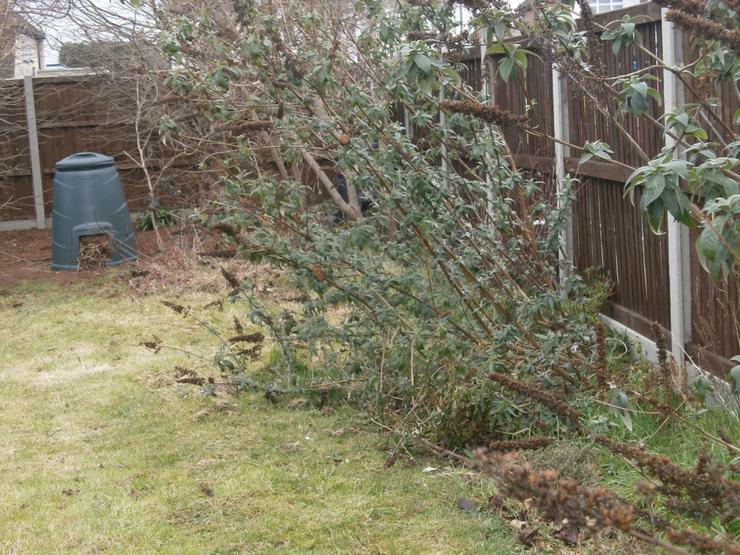 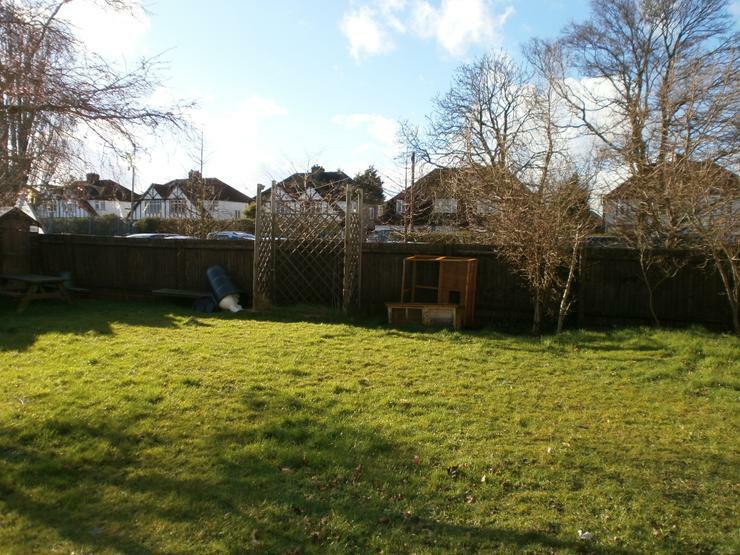 This is our garden in winter, when it is asleep, we have been weeding and are planning to plant some plants in spring. 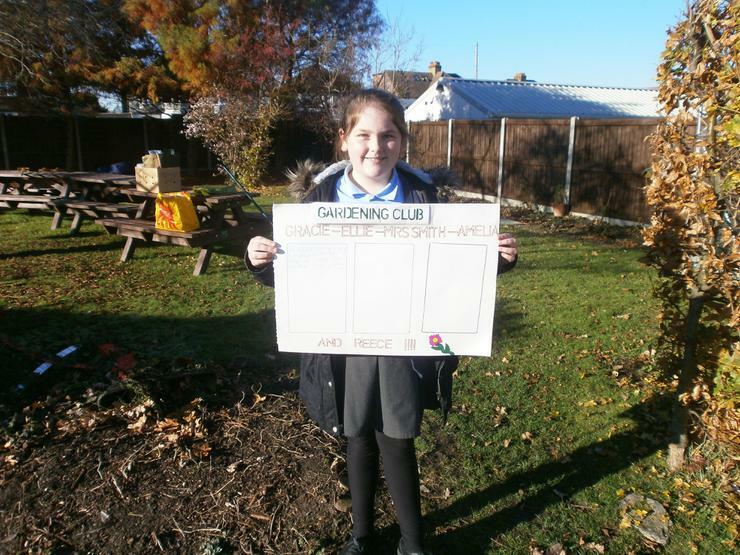 We are working with Team Captains Rachel and Maddie to make our garden better and neater. 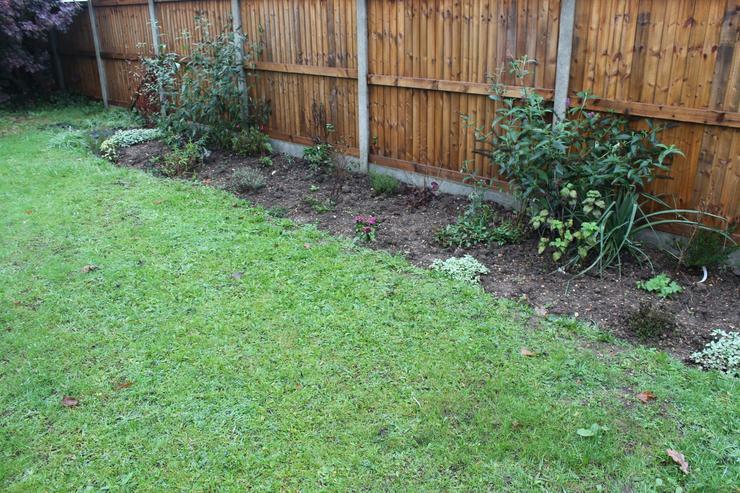 We hope that soon all the weeds will be gone. 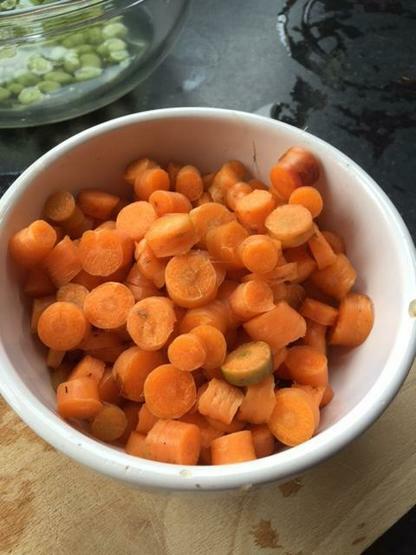 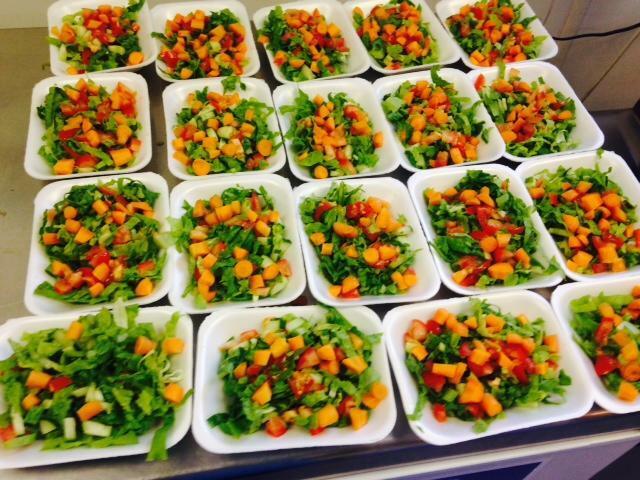 Wow - doesn't this all look so healthy and delicious! 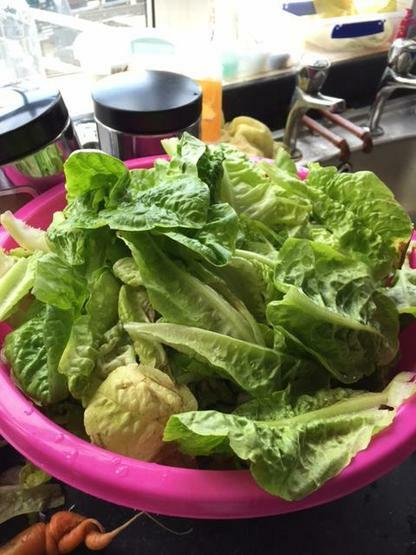 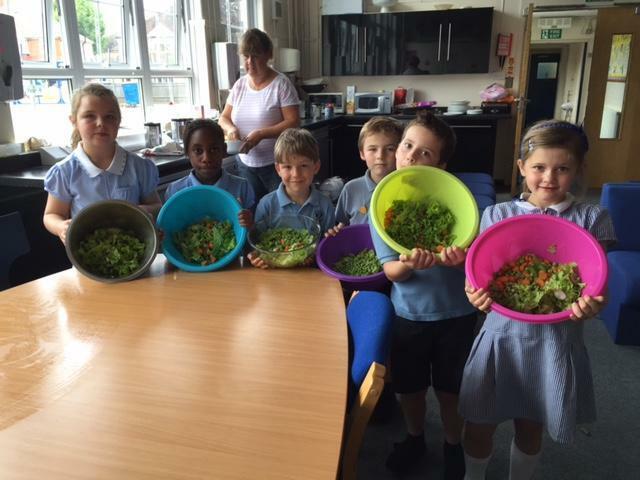 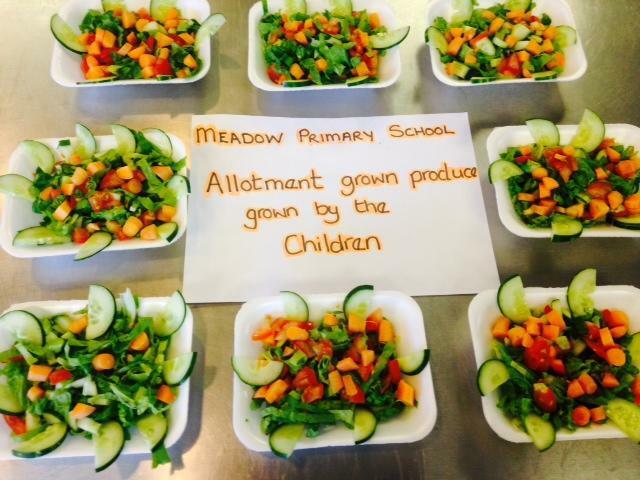 The children have loved having side salads with their lunch today - prepared fresh from our garden by our wonderful cook Mrs Morgan and her team in the school kitchen. 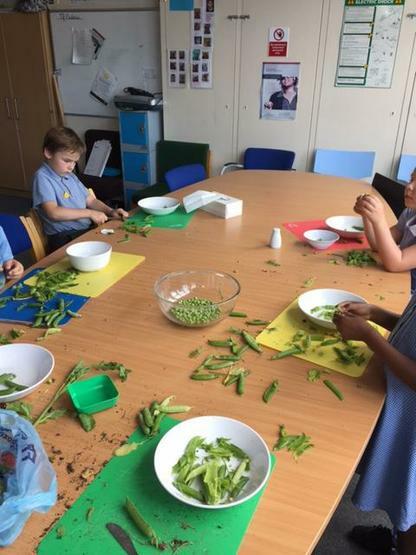 They thoroughly enjoyed them and many were asking for second helpings - at this rate we'll have to double the size of the allotment to keep up with demand! 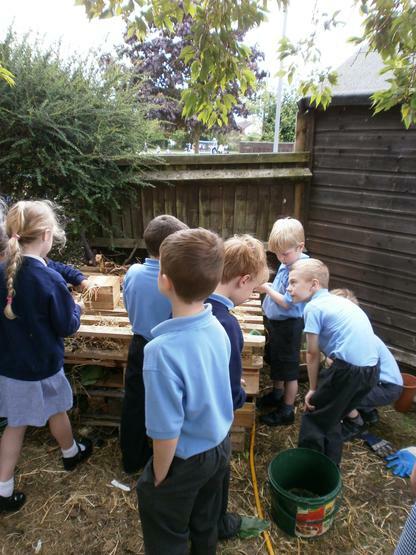 More fun in the sun for the gardening club at lunchtime putting the final 2 storeys to Meadow's Bug Hotel - it looks so inviting and they have taken great care to make it as cosy as they can for all creatures, great and small. 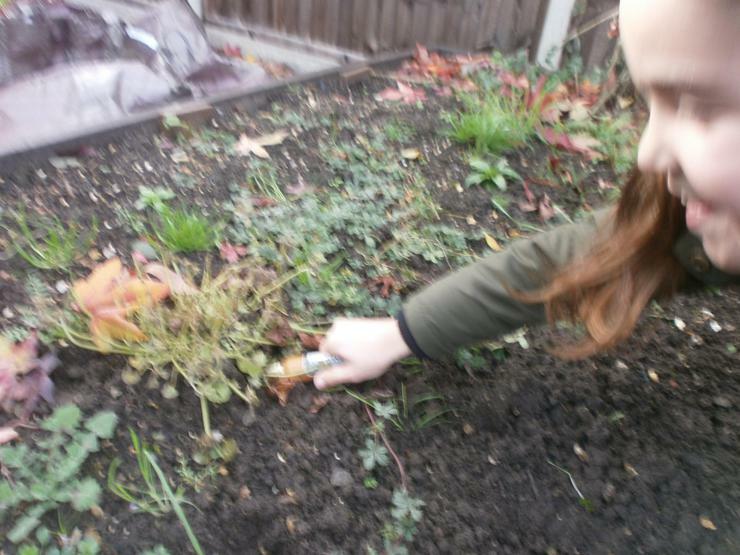 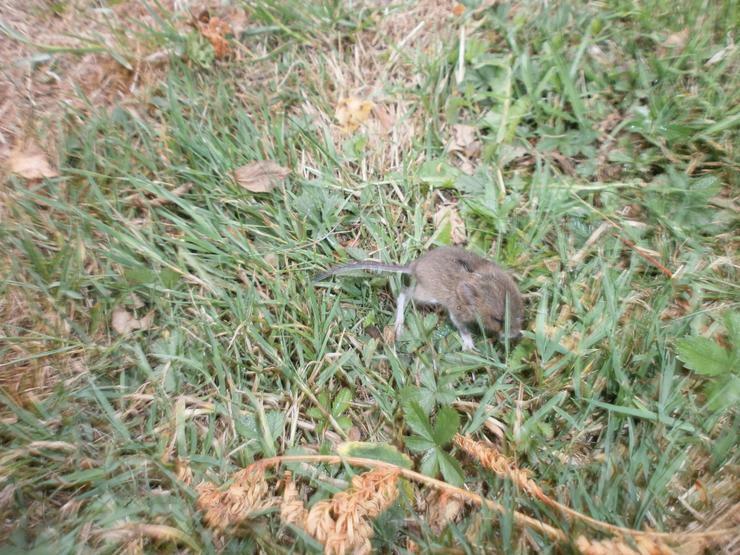 We were delighted to welcome a very special visitor to the garden whilst we were hard at work - a baby field mouse! 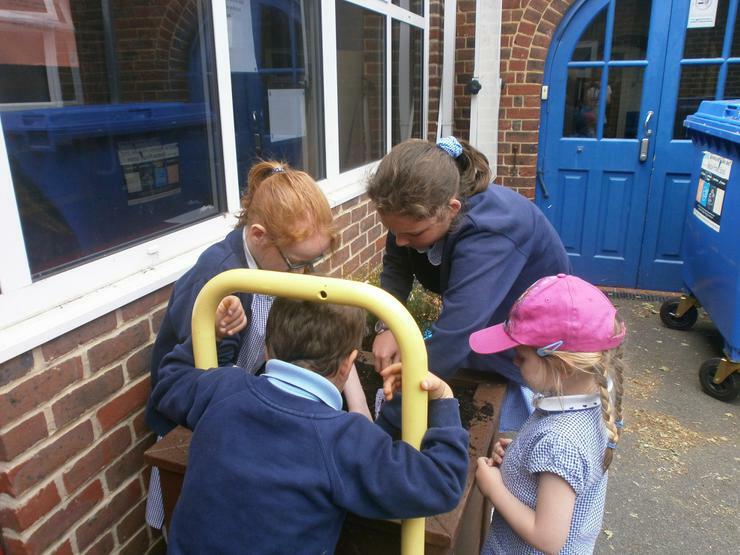 The children are very much hoping that he will take up residence and can't wait to come out and check regularly for sightings of him. 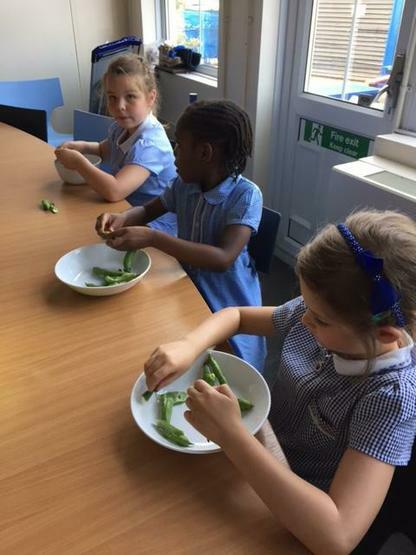 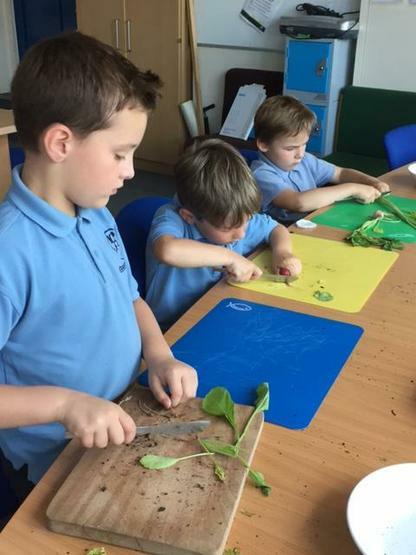 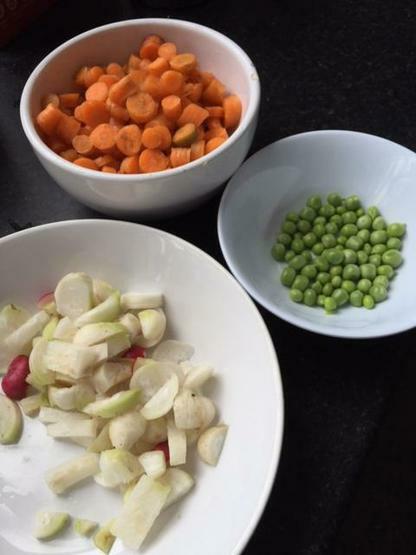 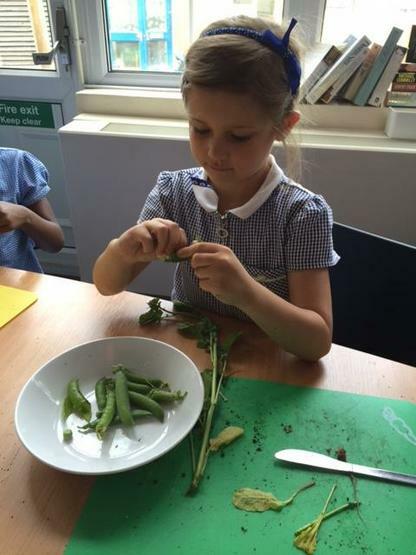 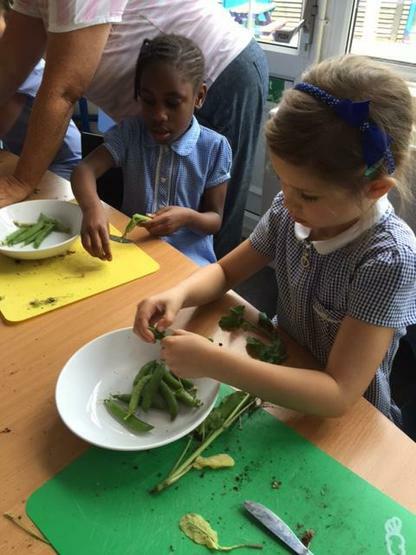 Year 2 have had a really productive afternoon preparing veg and salad from the school garden - it all looks so delicious and they're really looking forward to eating their home grown produce at their picnic this week! 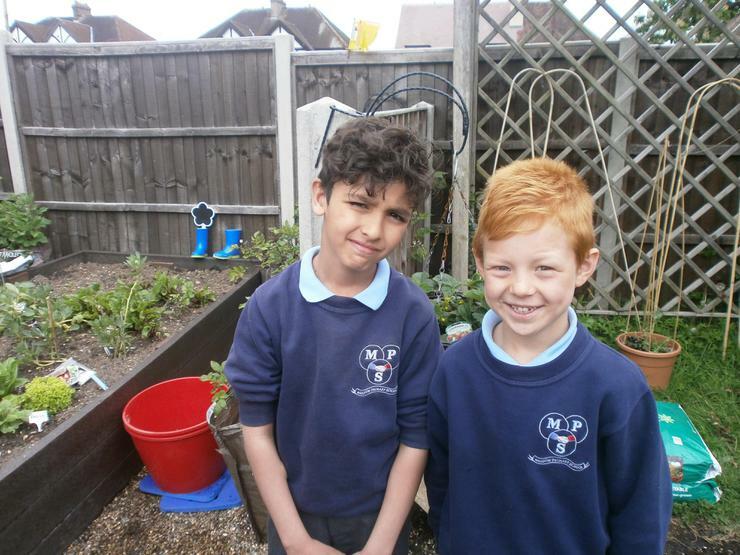 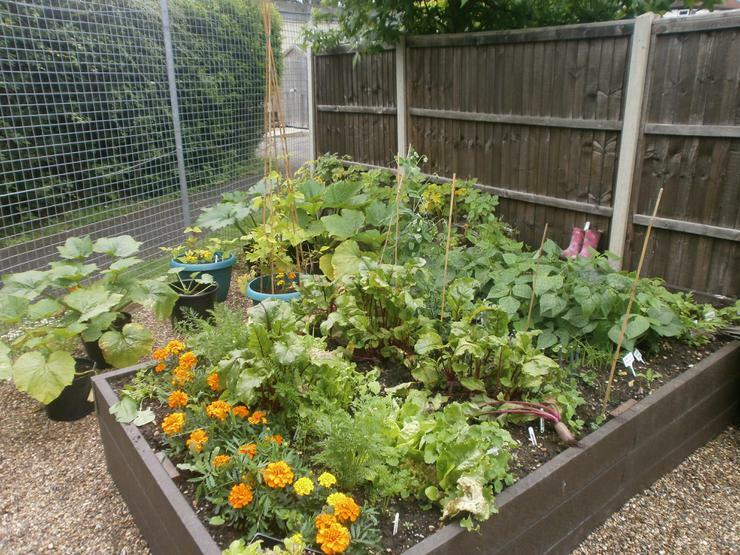 We are all amazed at our fantastic crops of salad, fruit and veg - Mrs Flower says she cannot believe how well they have grown and has commended all the children on doing such a good job! 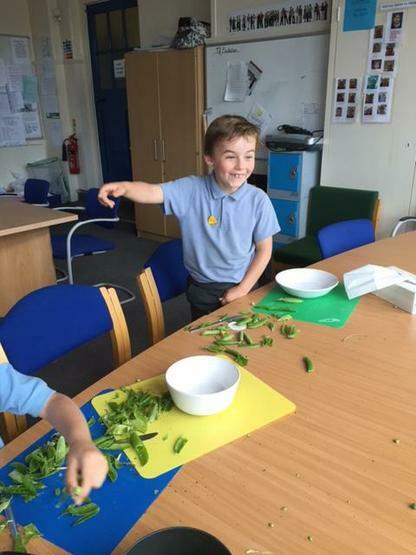 We are so proud and everybody has got so much out of the whole experience - from sowing the very first seeds to actually harvesting crops and tasting the fruits of our labours! 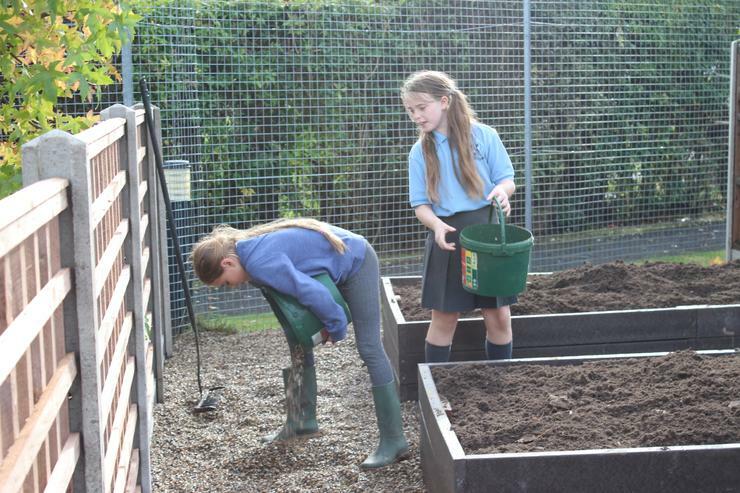 Over the last week every class has gone down to the garden to harvest their potato crop.They have tended these from 'chitting' (encouraging to sprout before planting) the seed potatoes in egg boxes, through to planting in hessian bags which they have regularly topped up with soil and looked after in their classrooms, eventually transferring them outside once the weather warmed up. 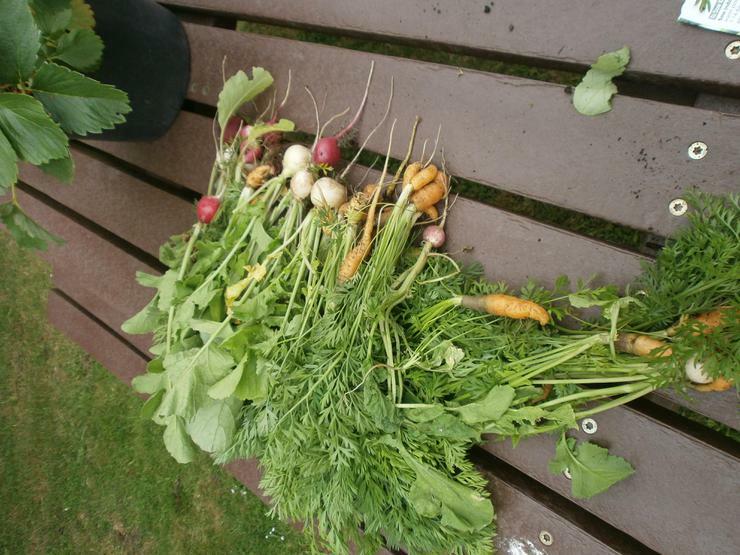 Having become so responsible for them, there was everything to play for when it came to finding out who had produced the biggest crop (not least amongst the staff!). 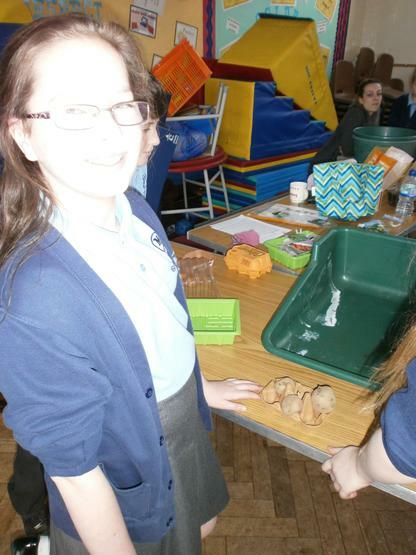 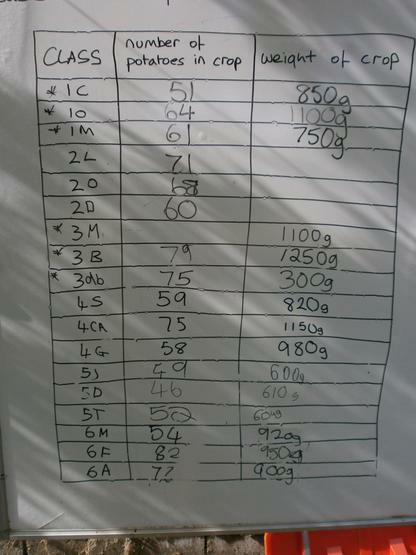 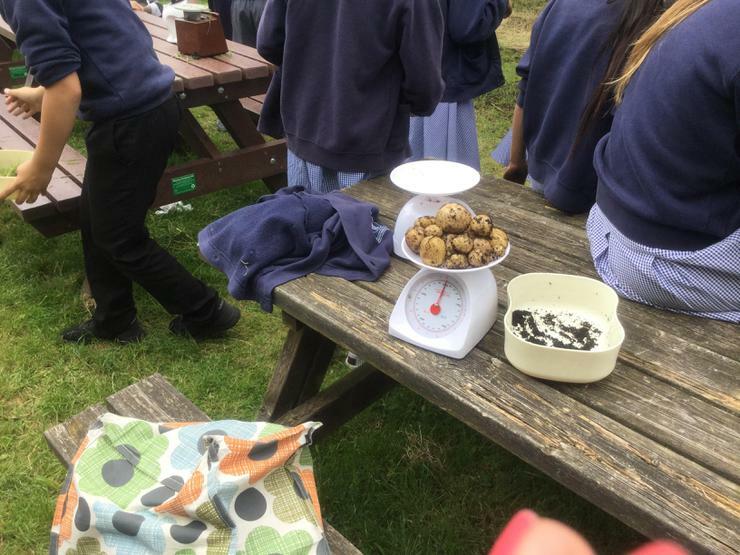 As you can see from the table in the picture, every class did really well, but the overall winners were 6F for the biggest number of potatoes with a huge crop of 82 and 3B for the heaviest crop - a massive 1250g! 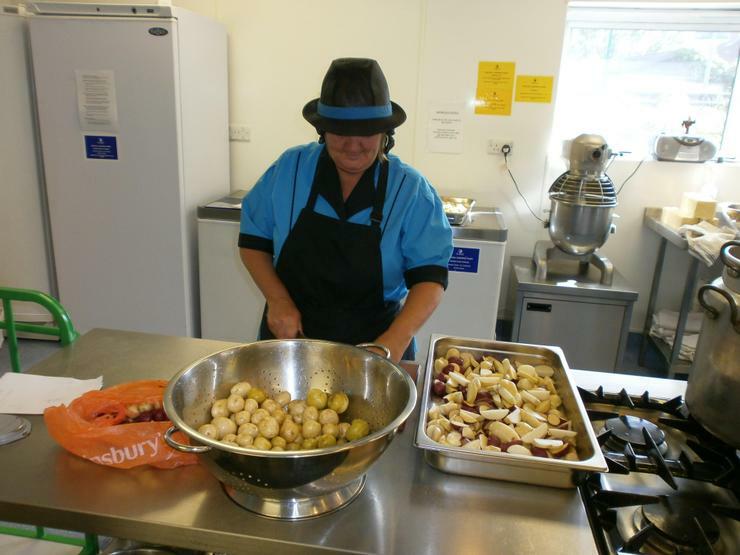 Our wonderful kitchen staff, Mrs Morgan and her team, helped us to celebrate by turning most of the crop into delicious potato wedges which we all enjoyed in our classrooms after break - comments ranged from 'lush', 'absolutely yummy', 'better than my mum makes' and 'I can't believe these are really what we grew'. 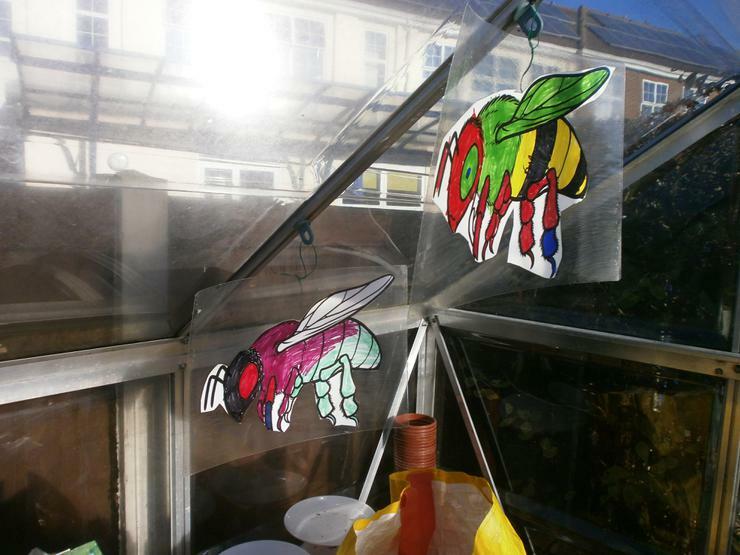 Amber and Jessica from 1O produced the wonderful pieces below to record the event for us. 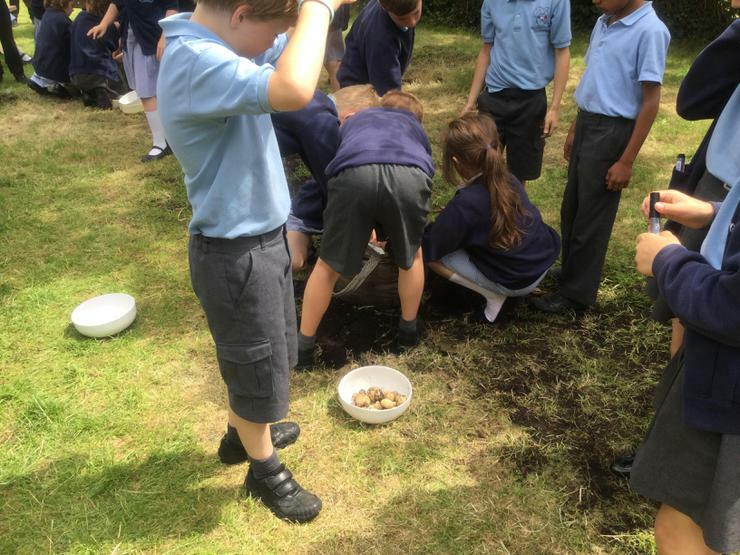 Year 2 are going to enjoy the rest of the crop with their picnic next week - all in all a fitting end for our first 'grow your own' potato endeavour! 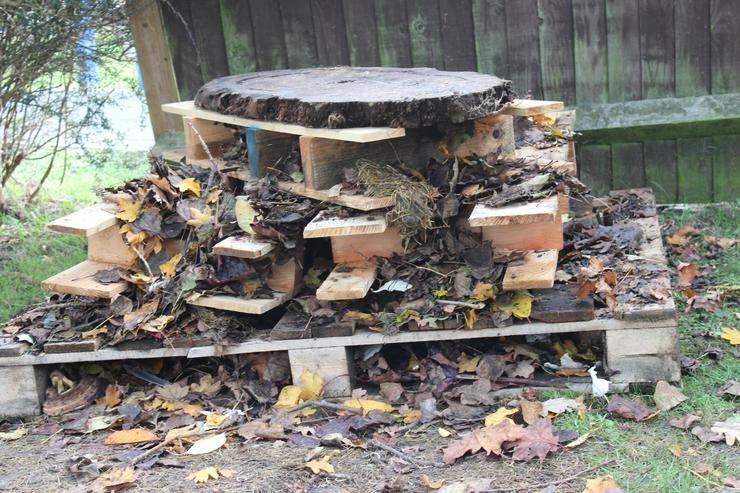 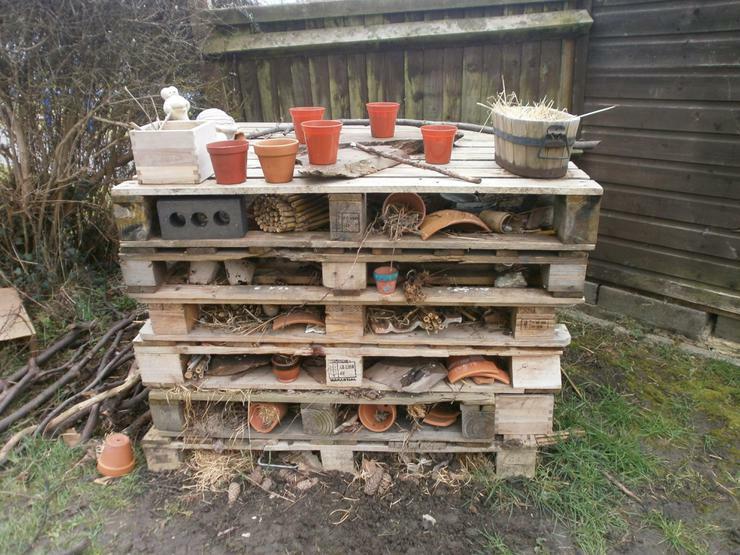 Much fun was had adding the next 2 storeys to our Bug Hotel in the garden today. 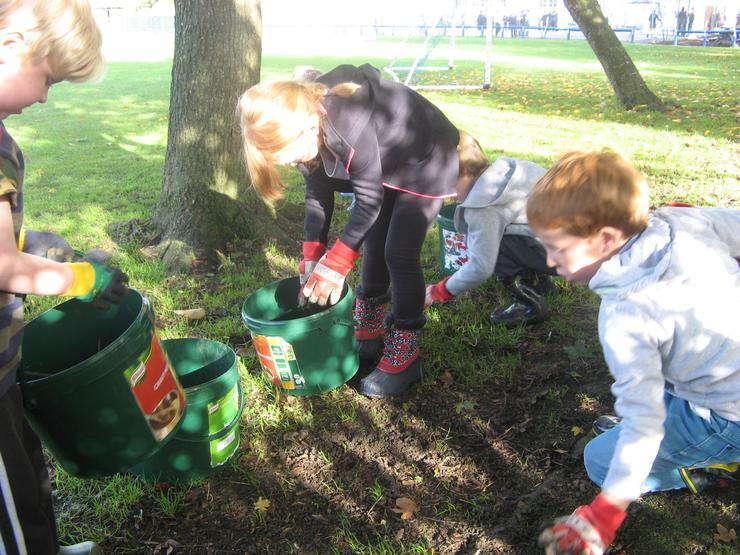 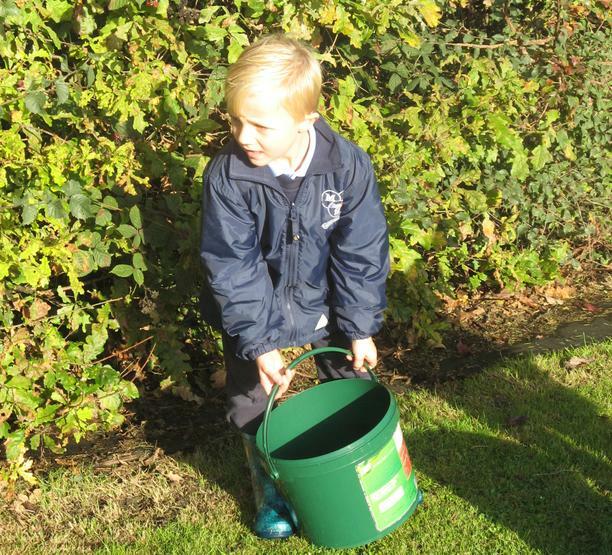 The children enjoyed a walk around the school field with buckets collecting twigs, leaves and lots of other items they thought might make a cosy home for a bug! 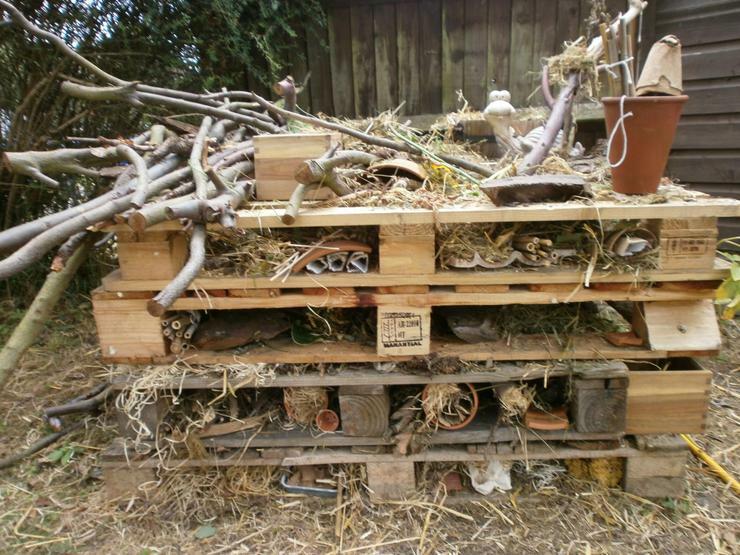 They spent a lot of time carefully arranging these and other items (including an old gardening glove which made a fantastic sleeping bag!) 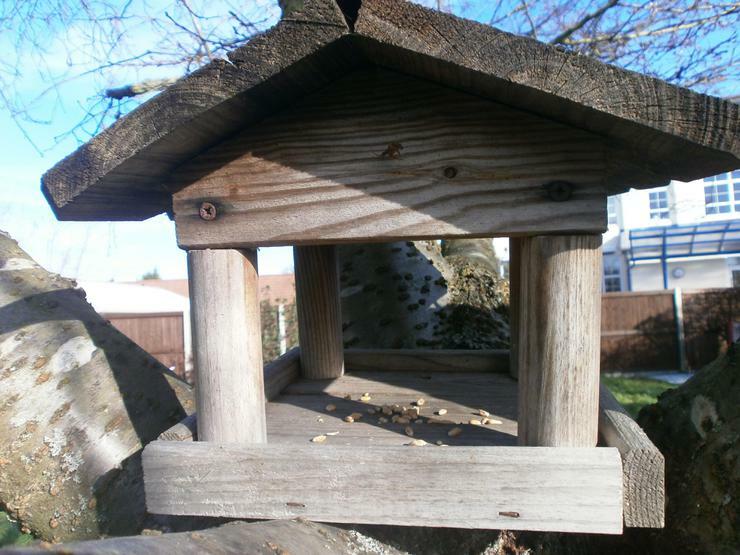 in the Hotel, ready for the next visitors. 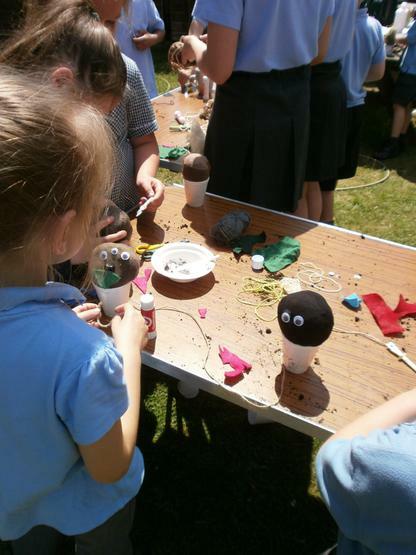 Y1 & 2 gardening club have had a fabulous time making 'grass heads' today. 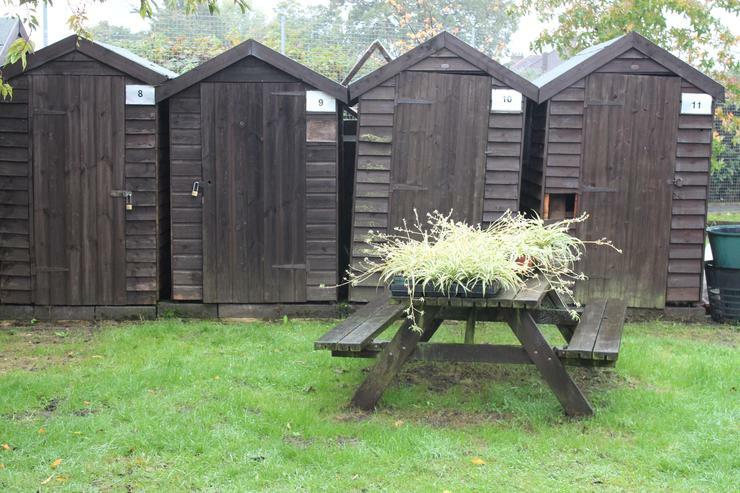 They are all going to give them a daily 'shower' at home and look forward to watching their grass 'hair' grow! 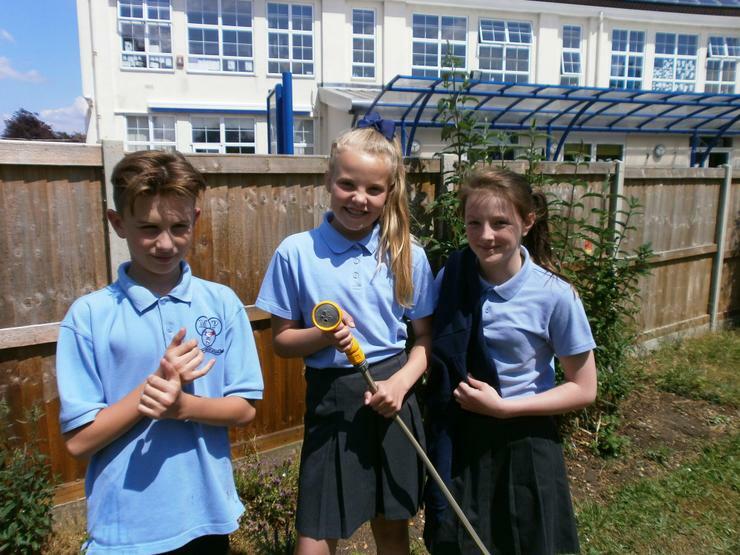 As always, they were helped and encouraged by some of our Y6 gardeners, who also worked hard tending the vegetables and watering flower beds - they are all doing a fantastic job in the garden and we are looking forward to tasting the next crops harvested! 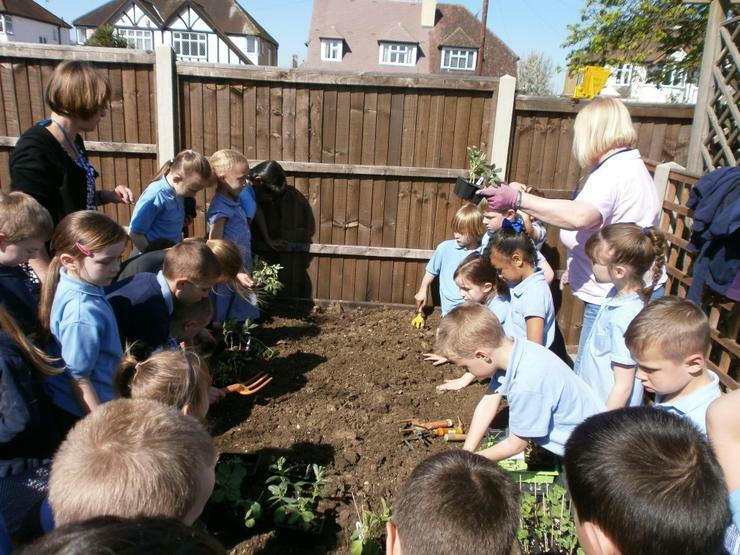 Years 1 to 6 had a great time in the sunshine yesterday tending to our vegetables and flowers. 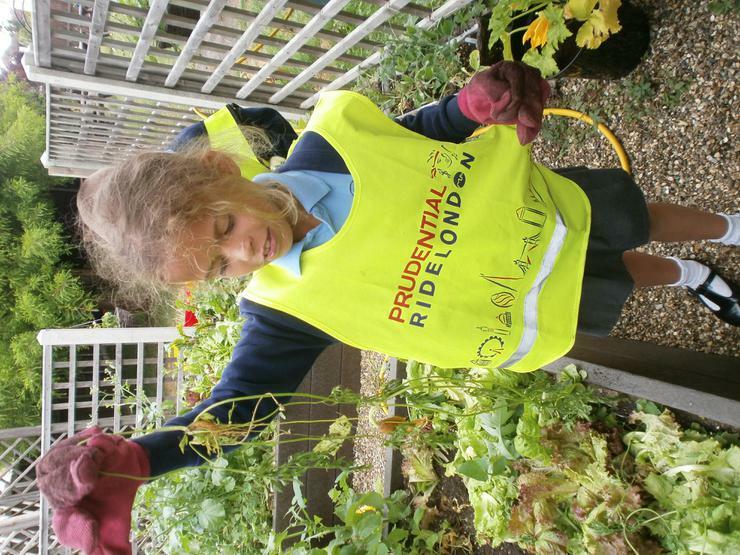 The radishes and peas were ready to dig up and pick, with some of the crops going to the classrooms and some making their way to the school kitchen. 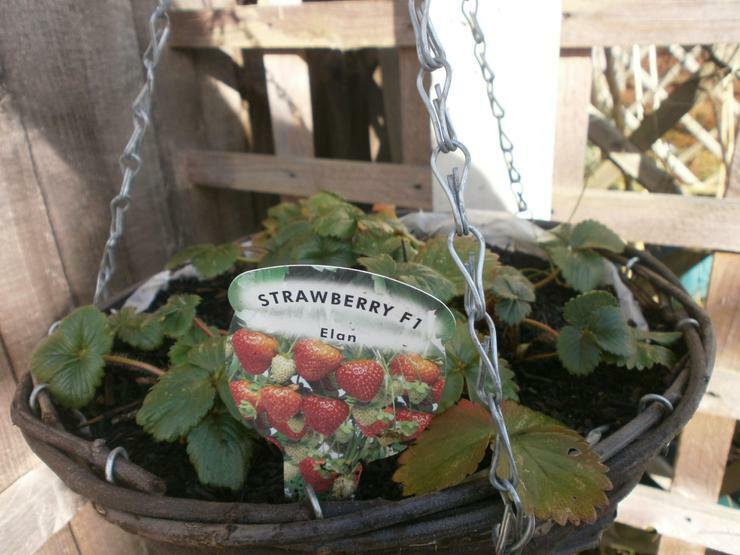 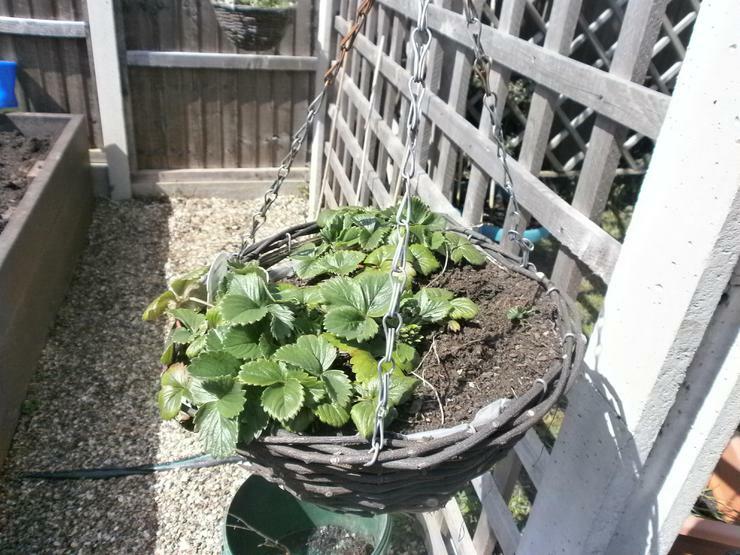 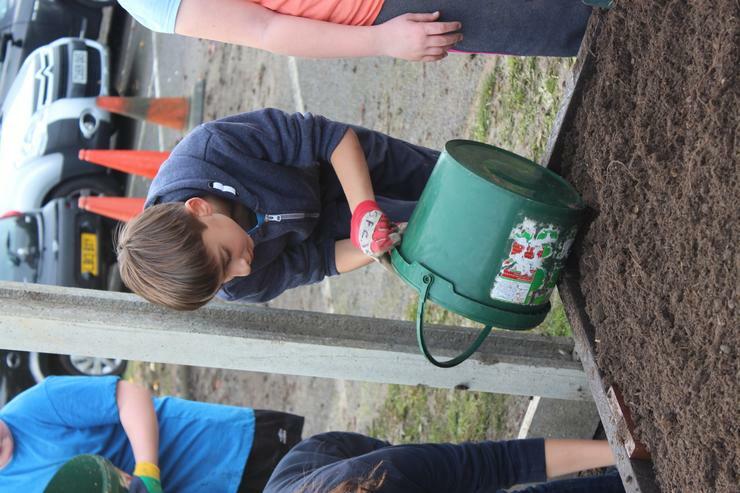 The children set to work planting strawberry baskets which were hung around the allotment area. 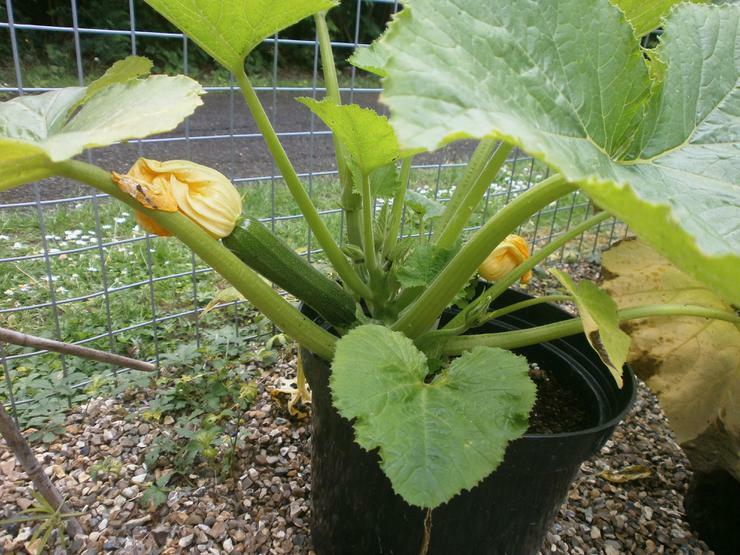 These will need watering daily and should yield some delicious fruit. 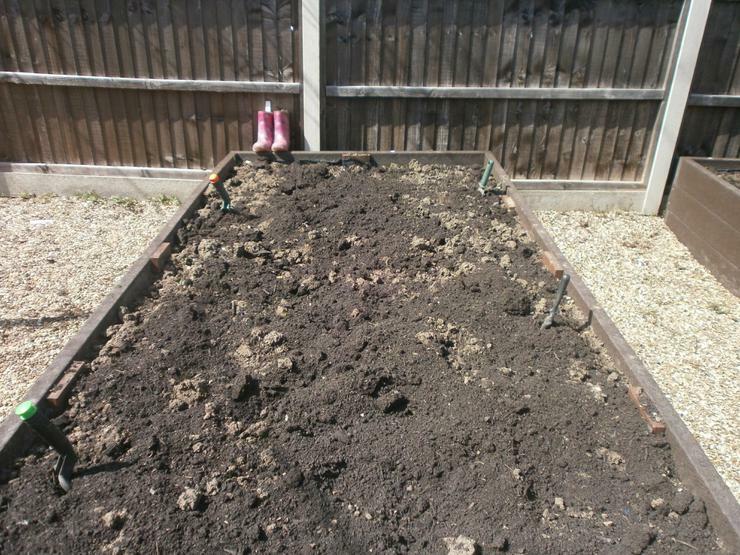 Some peppers were planted in the beds and the whole area was weeded. 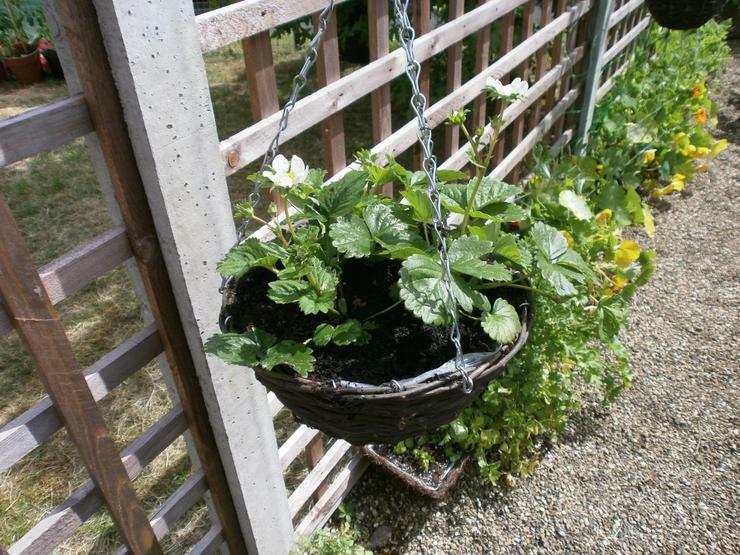 One little blight on proceedings was the black fly infestation which needed tackling with our organic powder! 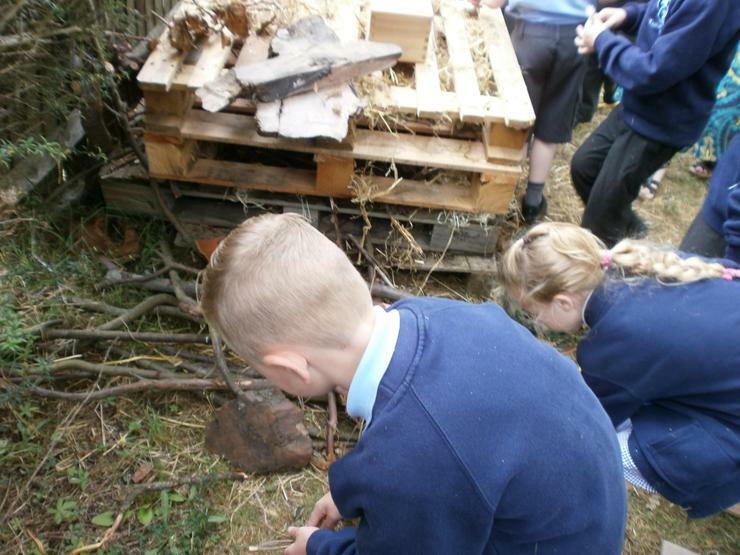 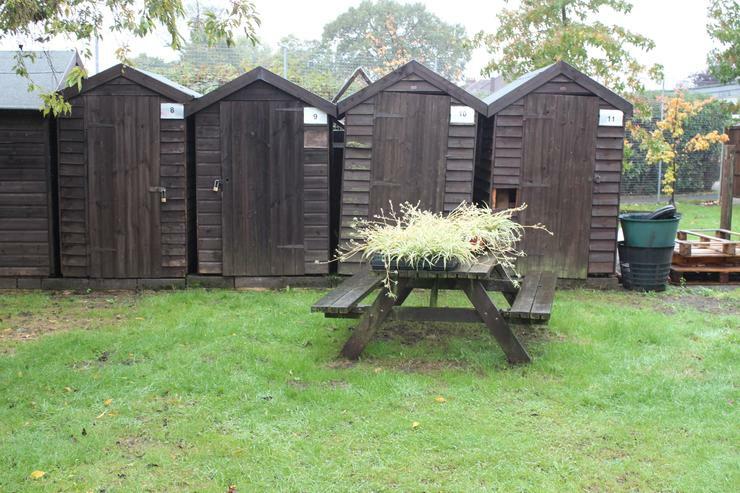 The Gardening Club also added to the bug hotel with donated pots and bamboo sticks alongside straw, grass and organic matter. 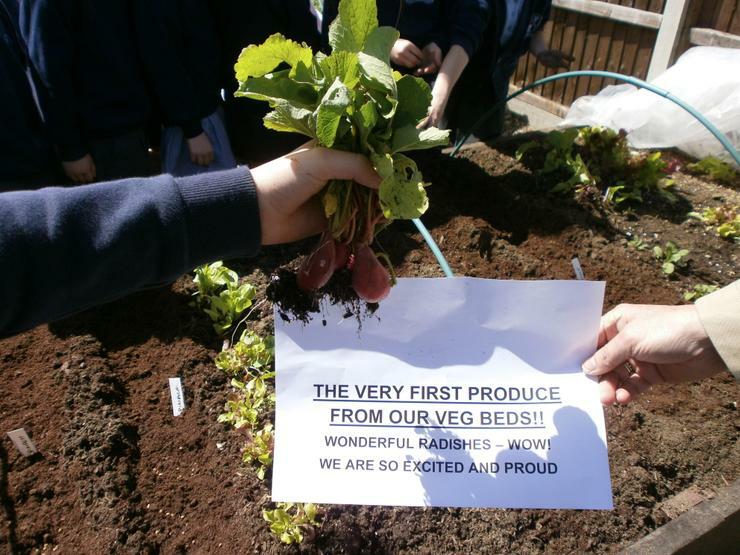 We were back in the school garden today and we are delighted to report that we harvested our first produce – 5 radishes! 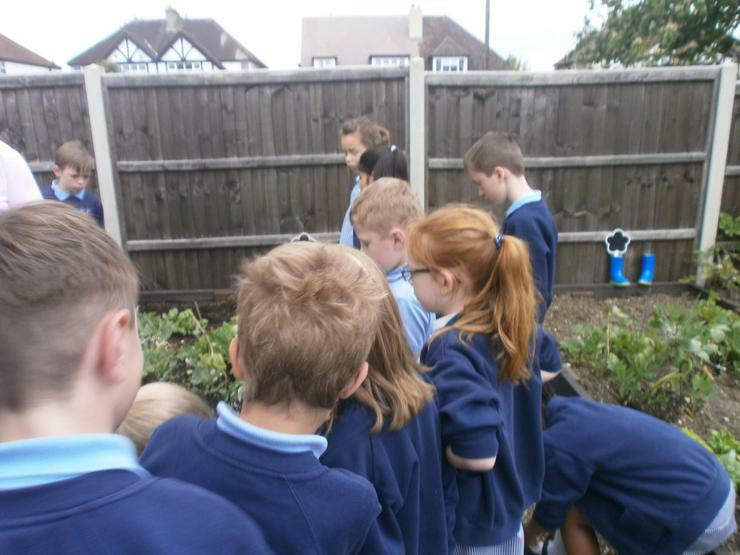 Year 3 and 4 are all going to have a taste and give us their feedback. 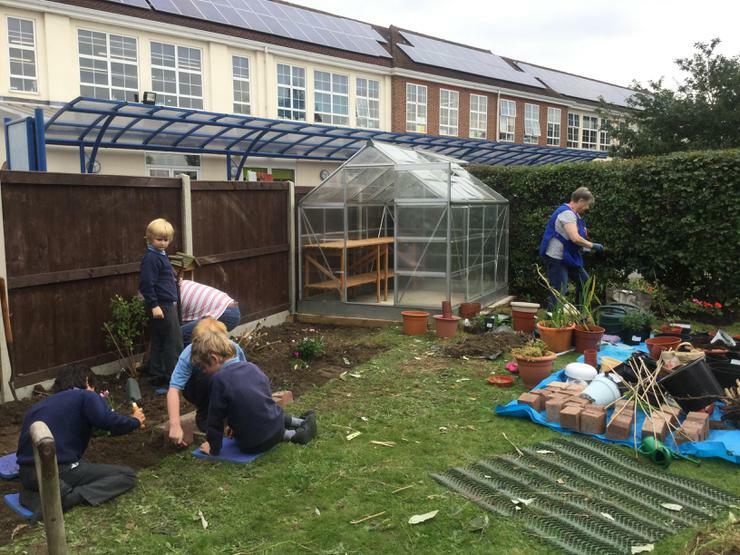 It was a busy day all round, we planted tomatoes and cucumbers into the mini greenhouse alongside more carrots, broad beans, lettuces, beetroot, peas, radishes and basil. 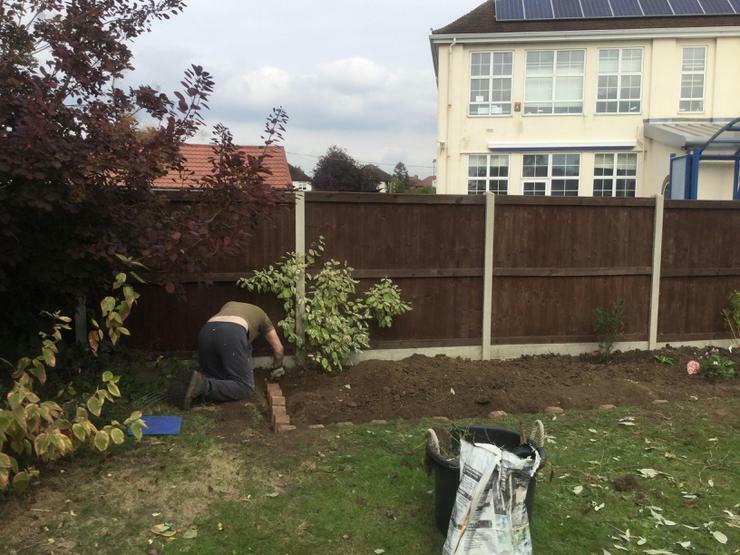 We also decided to give the garden a splash of colour and we planted beautiful flowers, which have the added benefit of attracting wildlife. 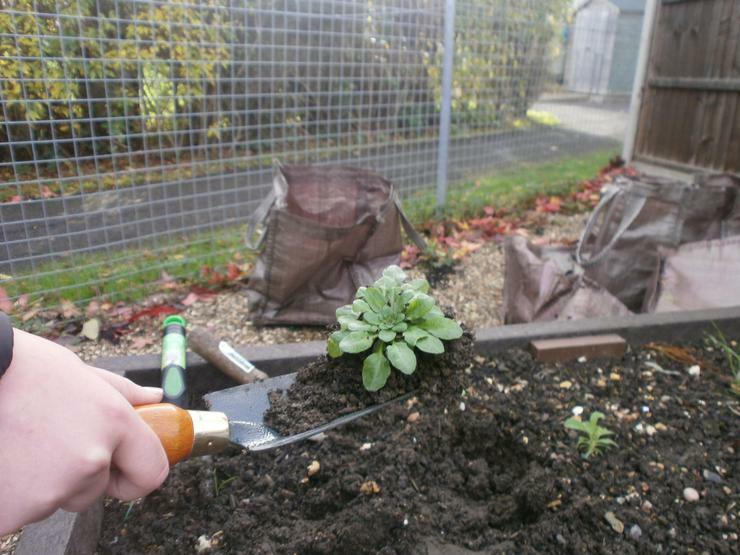 Finally we topped up the soil on our potatoes, which are growing exceptionally well in their bags. 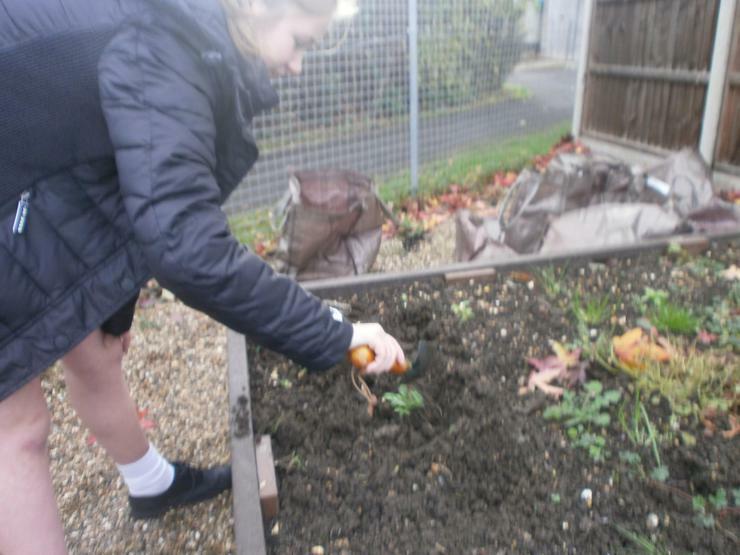 We headed outside today to top up the soil on the potatoes, which have now transferred to the garden. 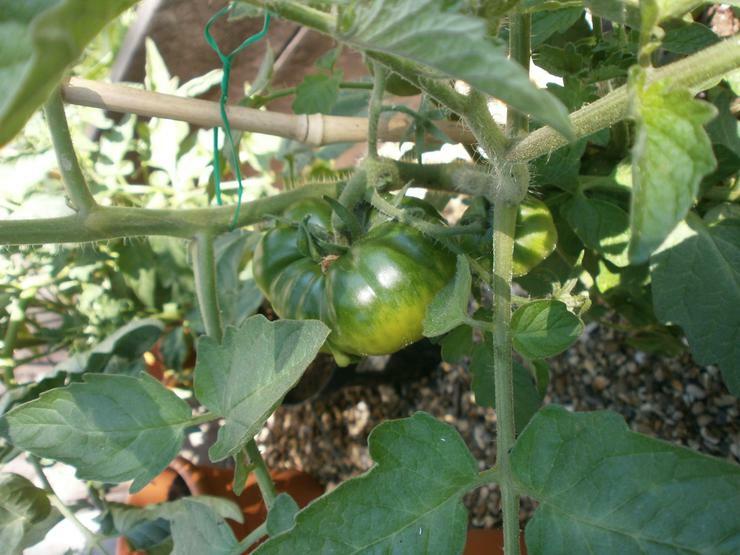 We’re pleased to report that they are doing really well and should be ready for harvesting in late June, early July. 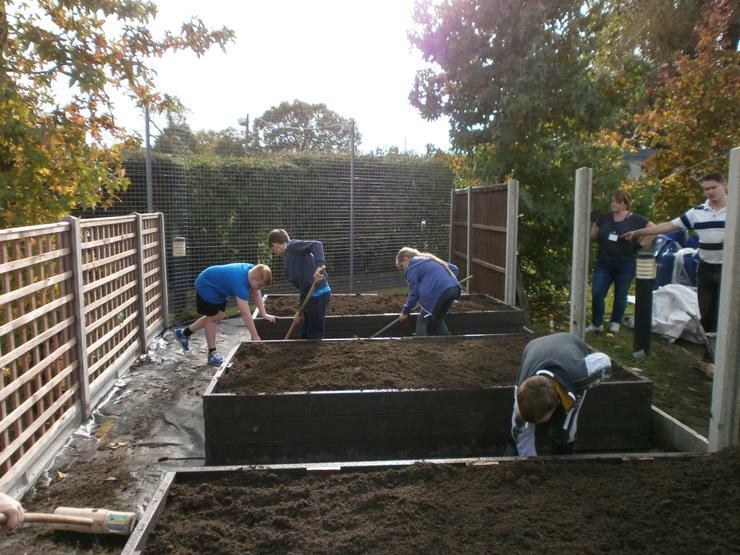 We went full steam ahead on the vegetable beds, weeding and adding fertiliser to ensure a bumper crop. 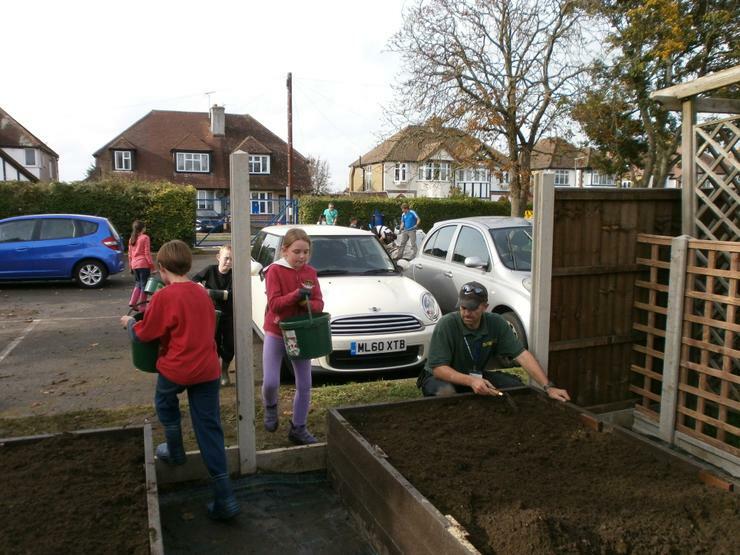 Then carrots, lettuces, radishes, broad beans, peas and beetroot were planted. 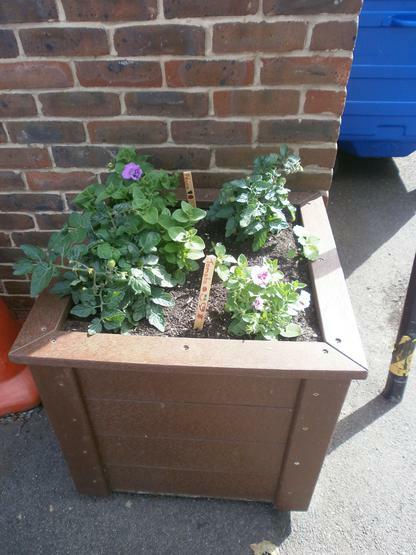 Basil & coriander now take pride of place in our herb baskets and sweet peas & Black-Eyed Susan’s are now enjoying the sun in our lovely troughs. 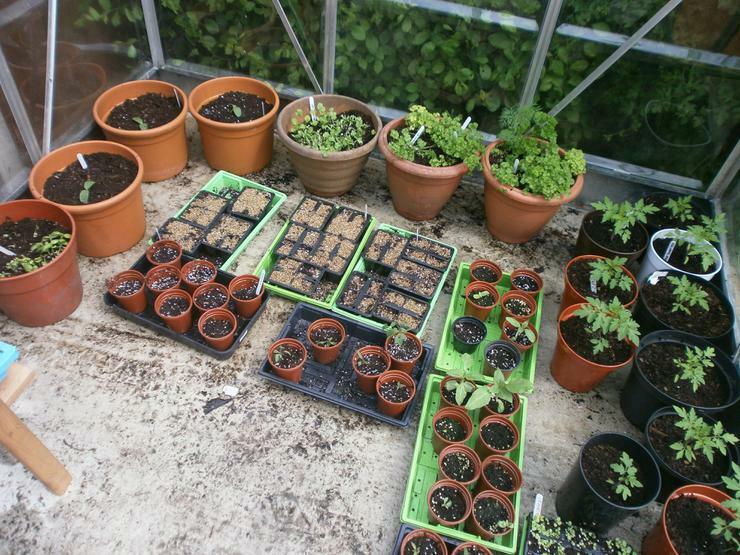 Add to that potting tomatoes and cucumbers and I think you’ll agree that a great job was done by all! 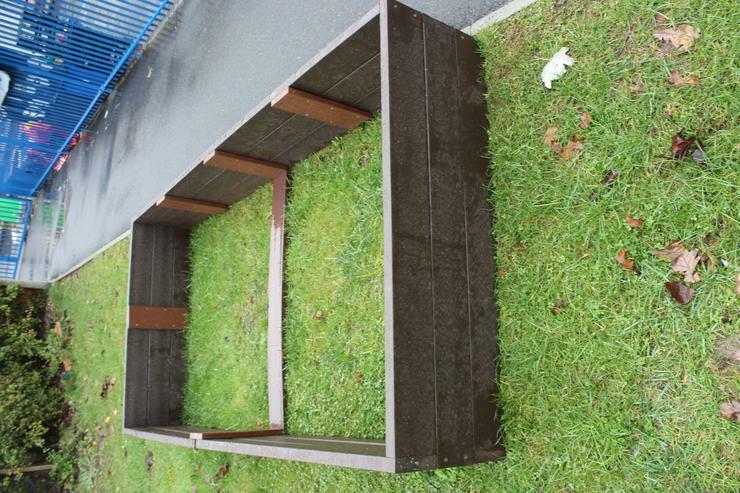 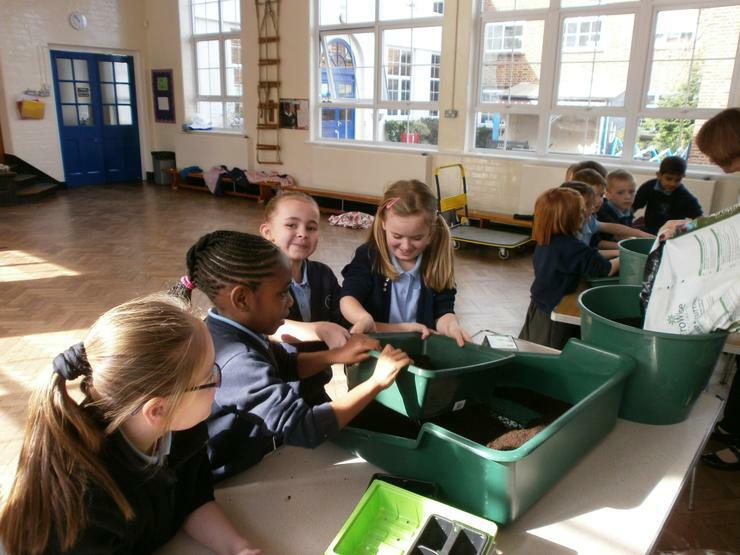 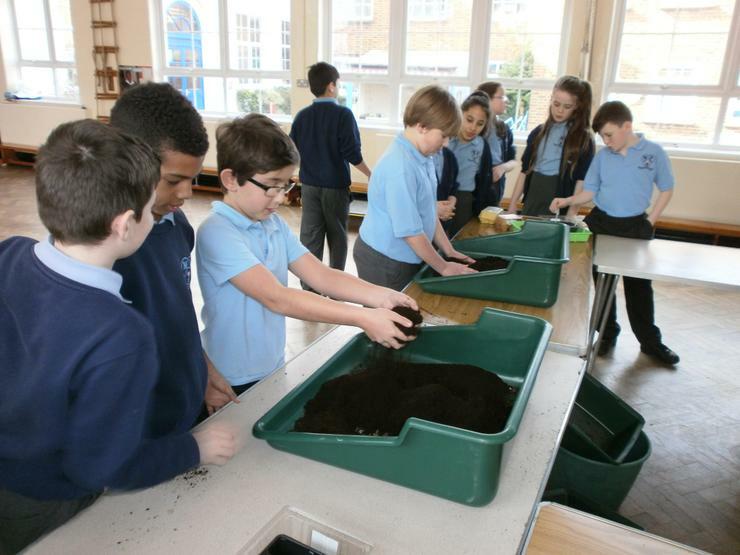 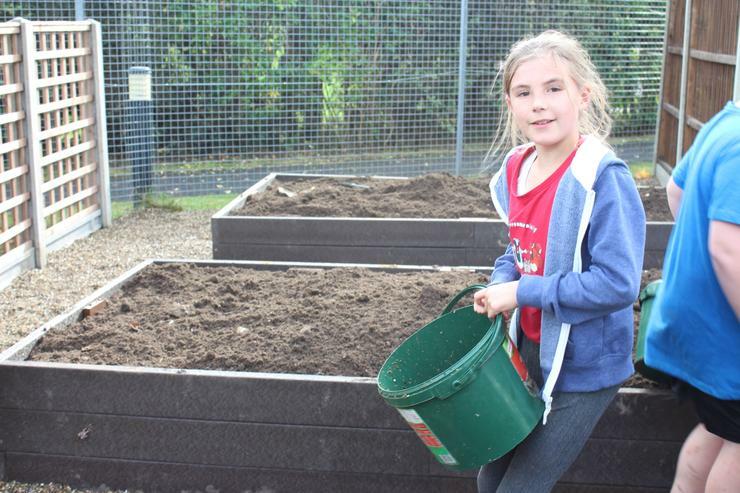 Our pupils are continuing to ensure that the flower and vegetable beds are watered well every day and the seedlings that were taken home to be looked after during the Easter holidays are now sturdy and strong and ready to plant. 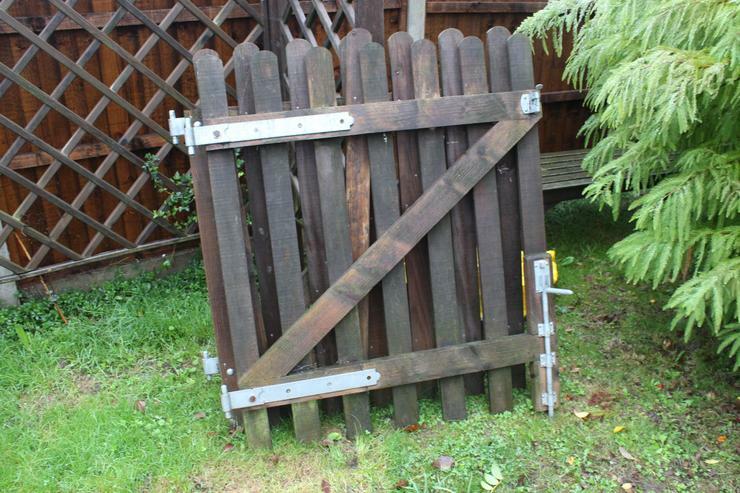 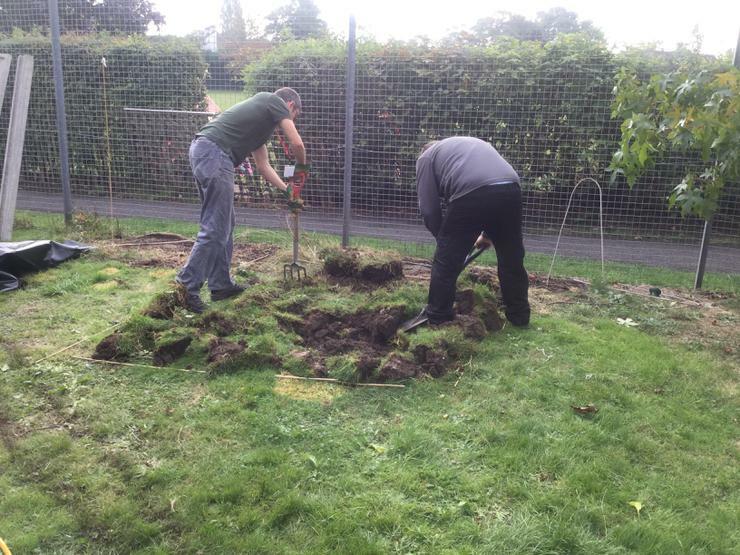 In our next session our gardening team will be helping Mr Roy to build a mini greenhouse for the tomatoes and cucumbers to thrive in. 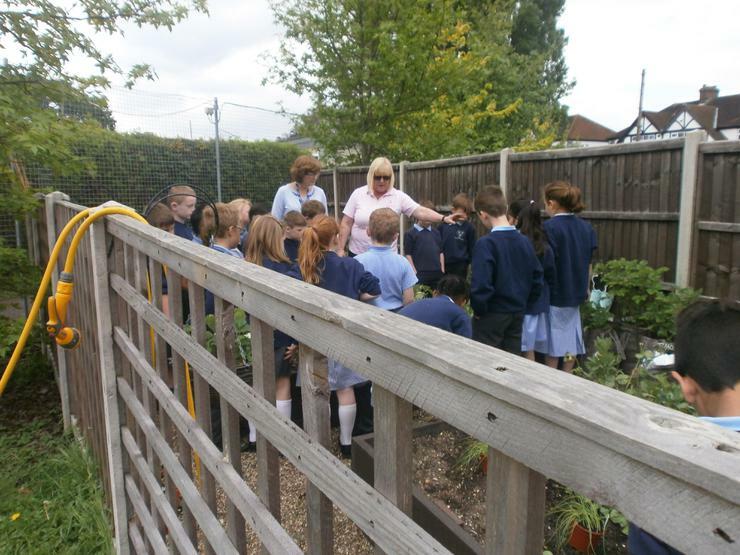 Mrs Flower was so impressed with how well the children looked after the seedlings and how well everything has grown that she emailed the school after the last session to congratulate everyone! 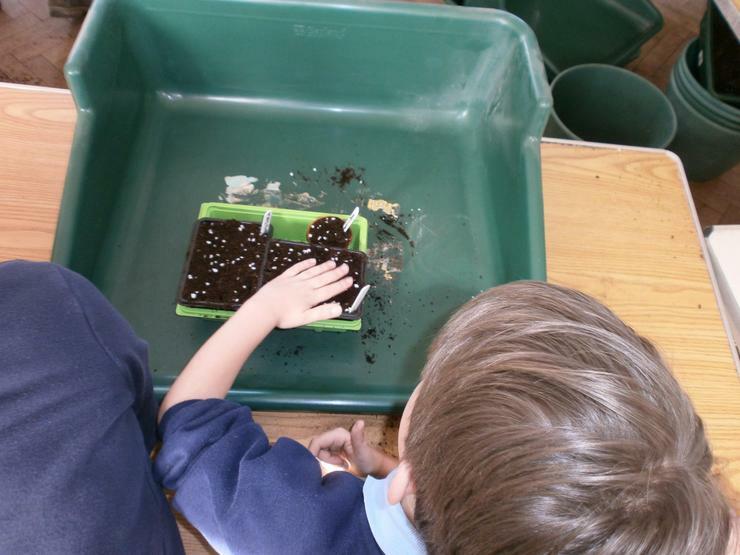 Today the children worked very hard indoors to prepare our seedlings for the next step of their growth. 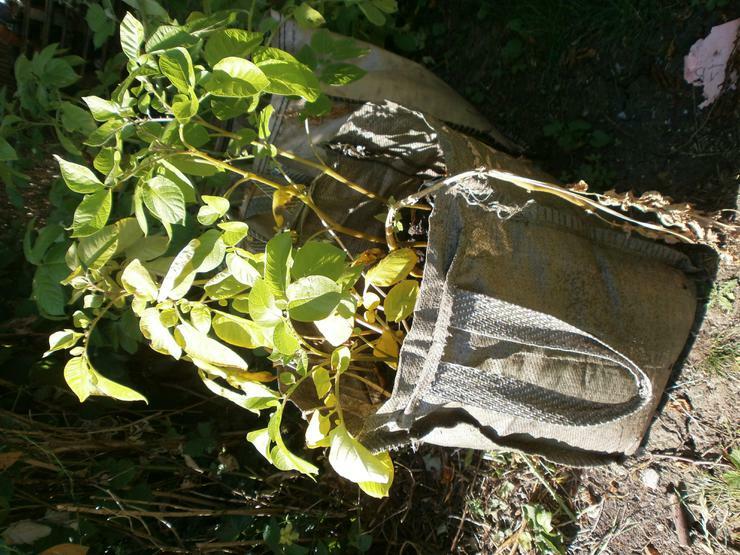 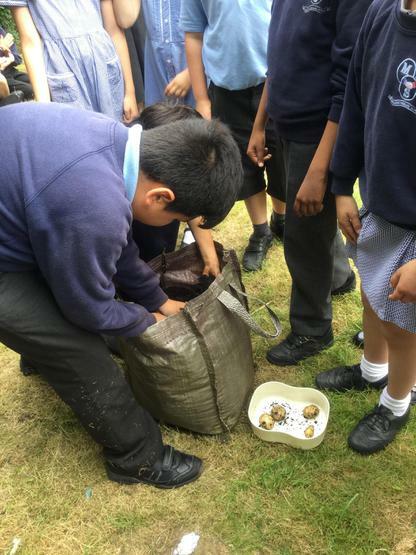 Potatoes were transferred from their egg boxes to bags and they now take pride of place in our classrooms until they are ready to be planted outside. 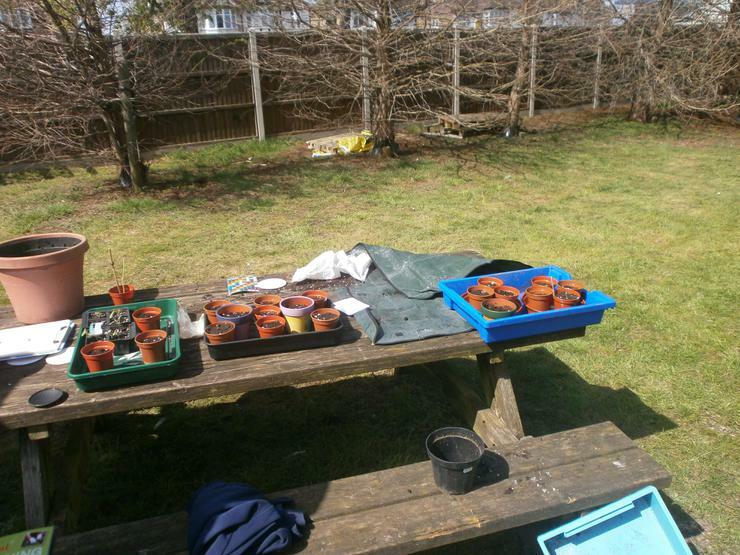 Tomato and cucumber seeds were also planted. 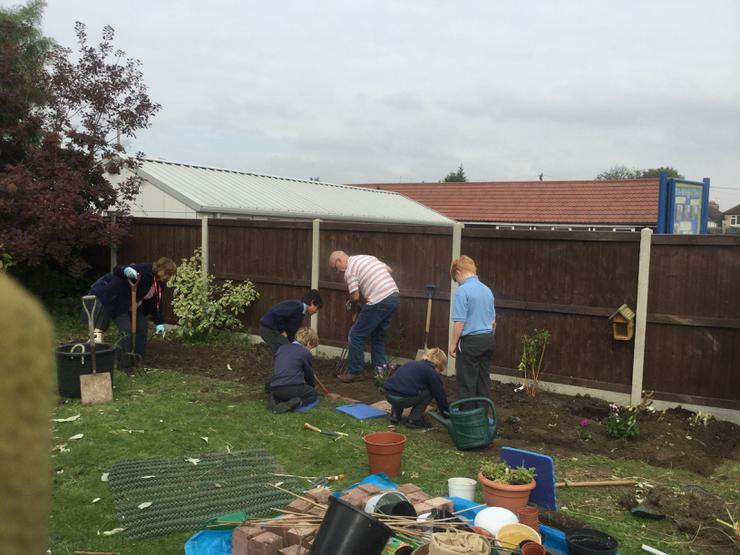 The gardening team worked really hard today and we look forward to seeing their efforts rewarded with lots of fresh shoots soon. 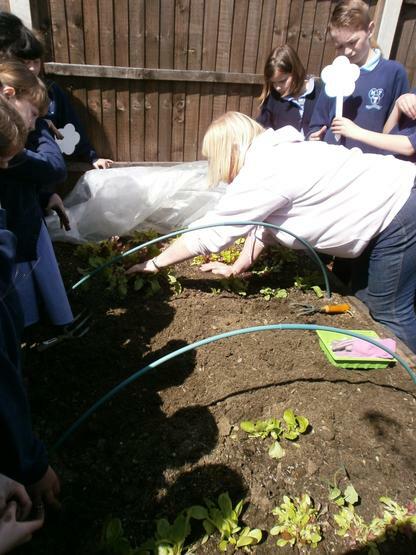 Today we welcomed the aptly named Mrs Flower from Flittons Nursery who worked alongside pupils from Y1-Y6 helping them to plant broad beans, beetroot, lettuce, radish, carrots, basil, potatoes and sweet peas. 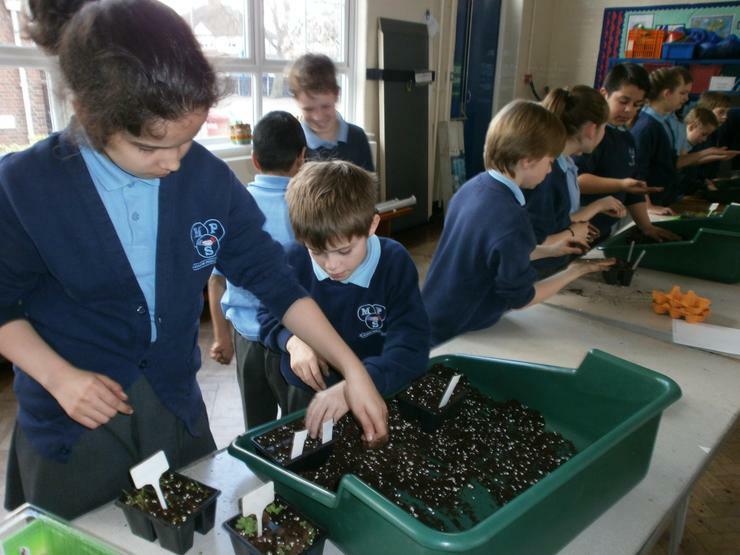 All of our classes now have a little ‘growing station’ and will be caring for them in their classrooms until they are ready to be planted outside. 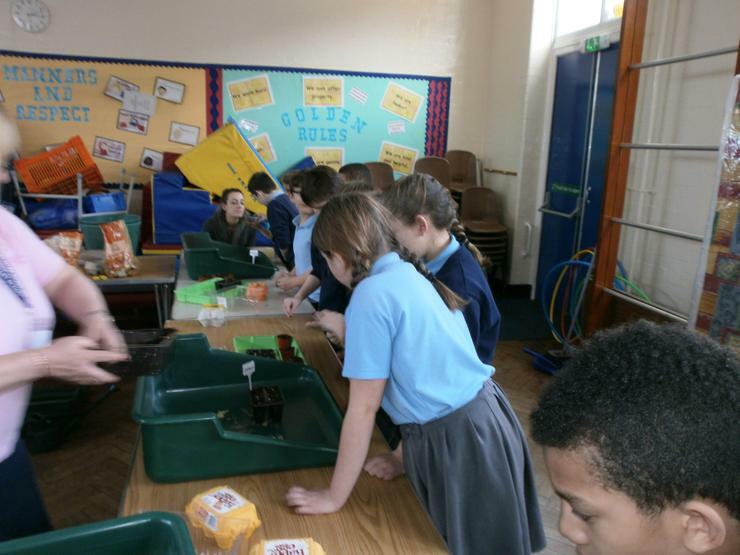 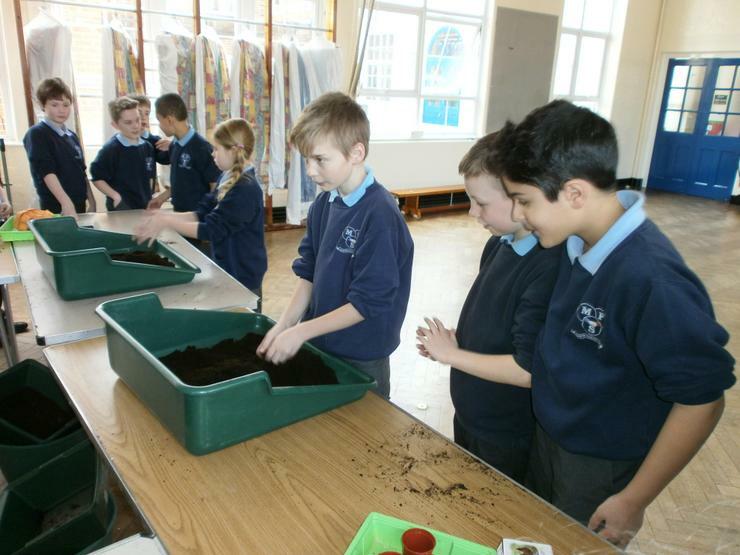 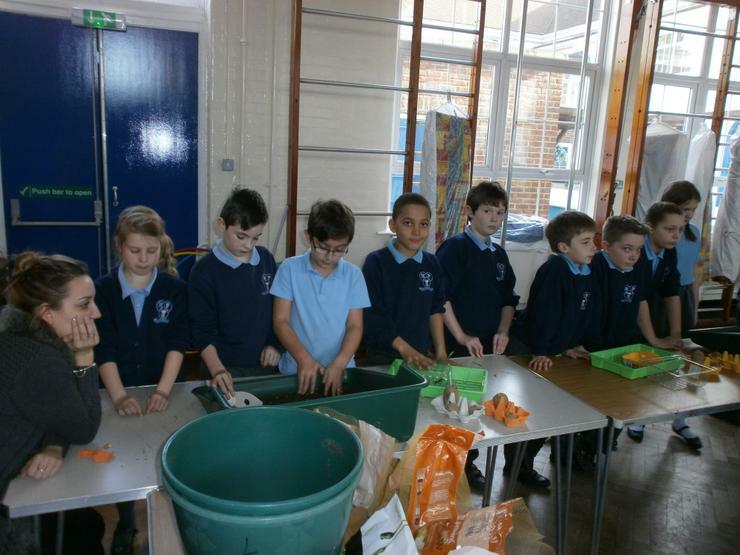 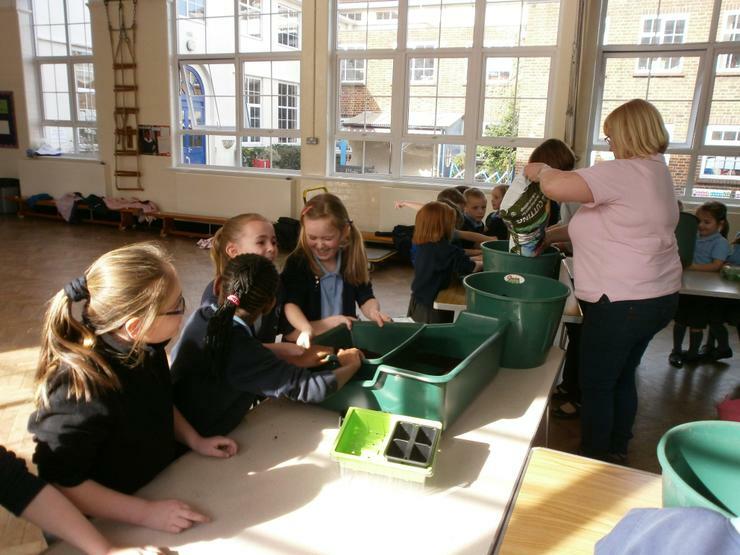 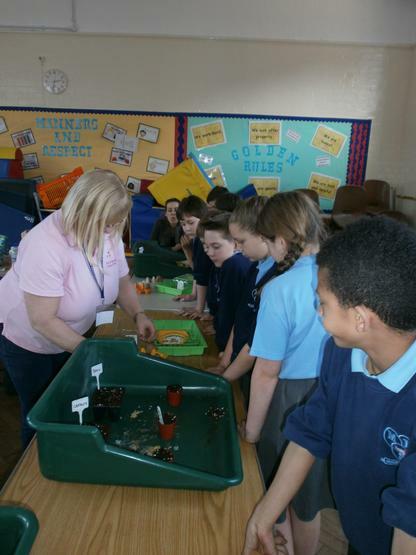 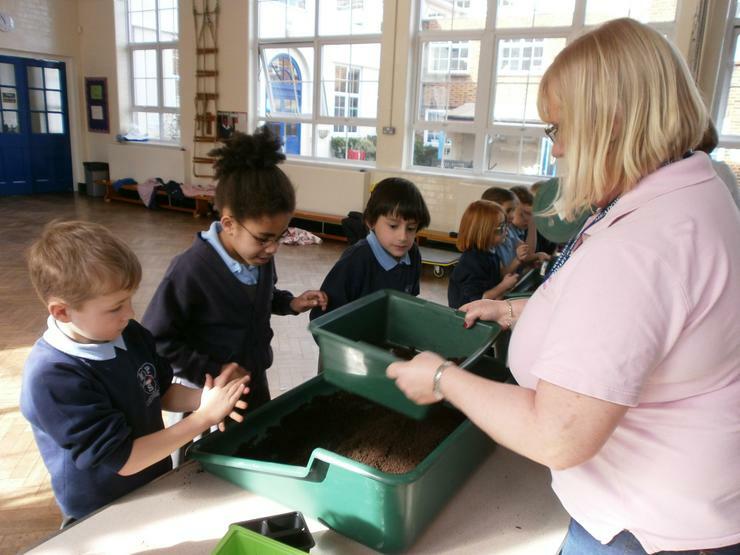 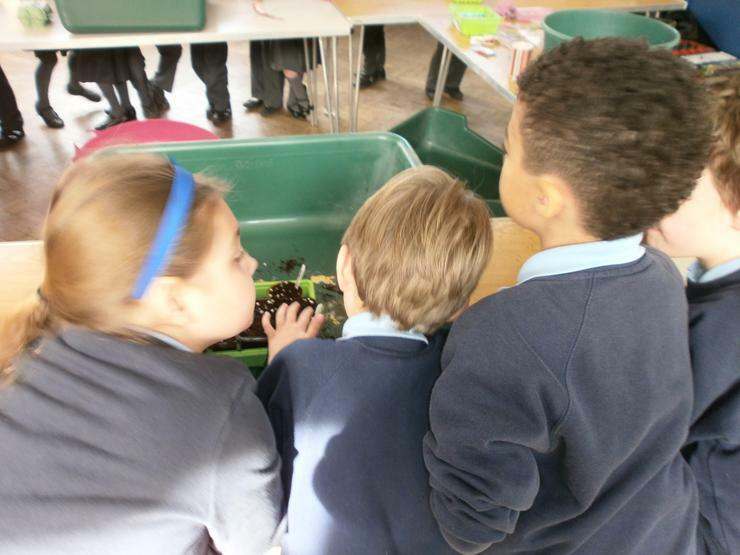 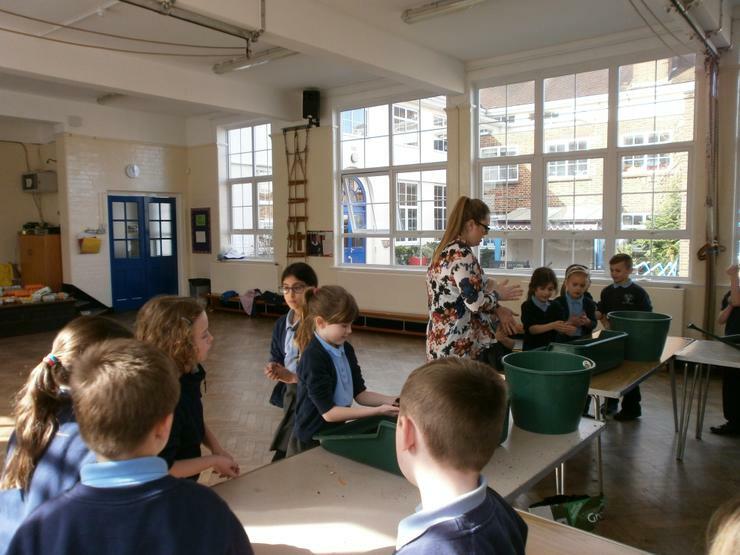 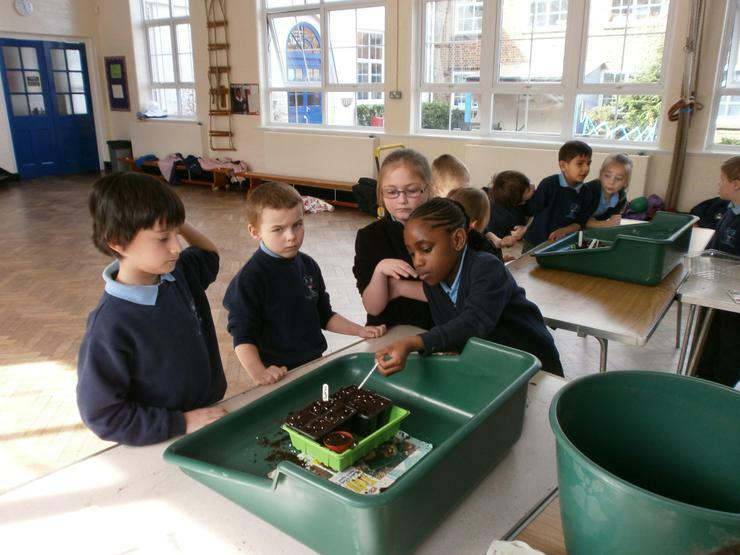 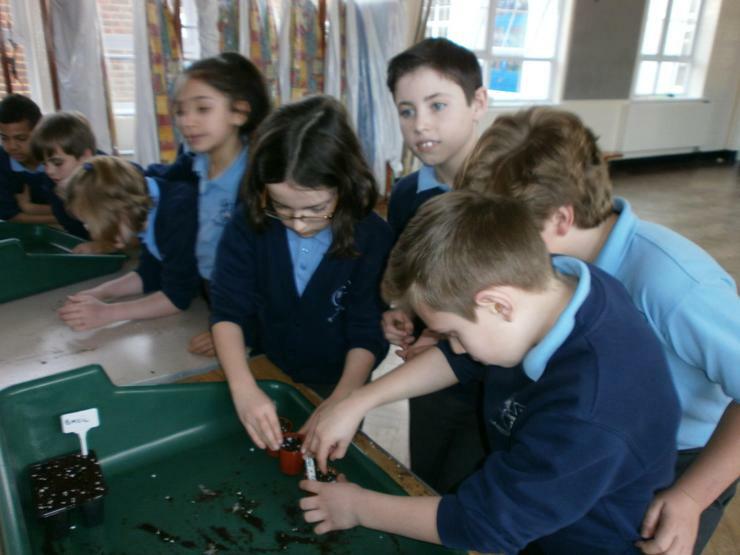 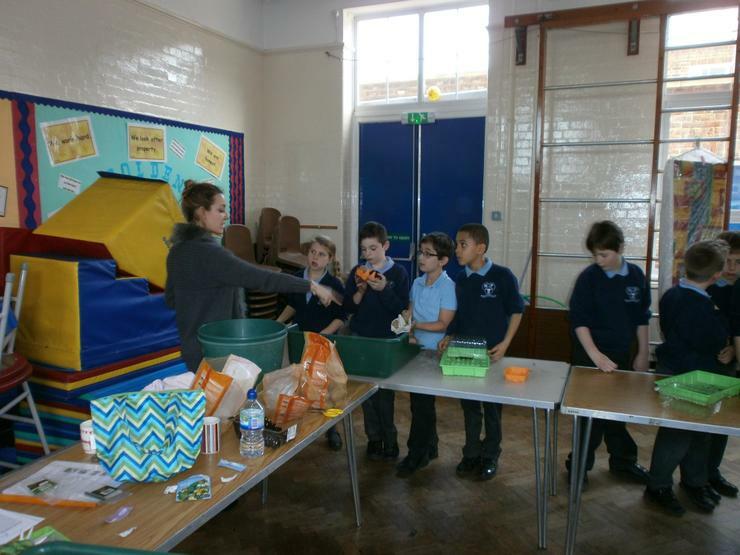 The children also learnt about different types of soil and how to plant and care for seeds. 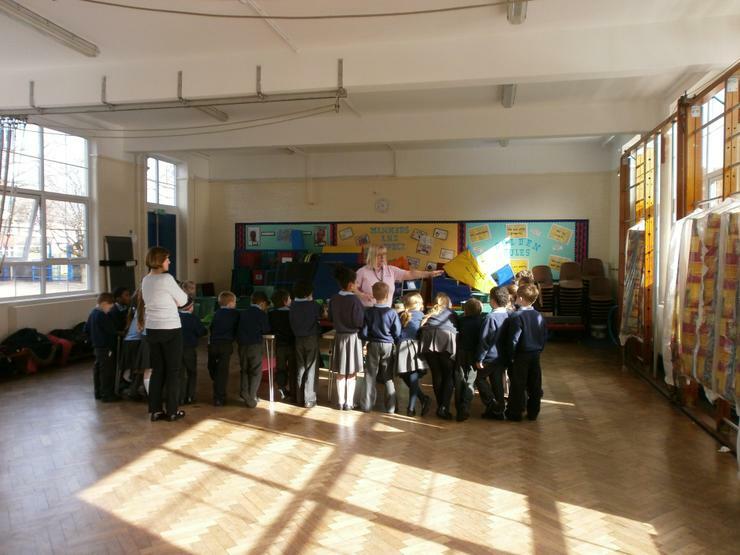 The children loved it! 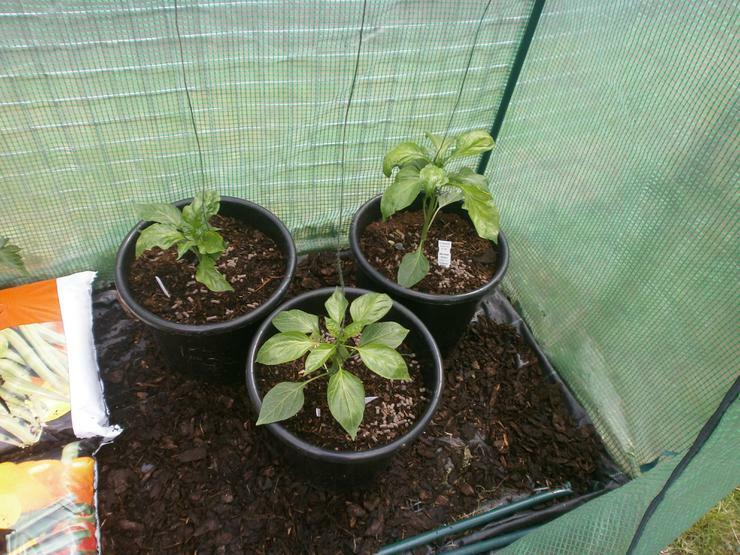 basil and lots more like potatoes and we have to wait until they get a stalk! 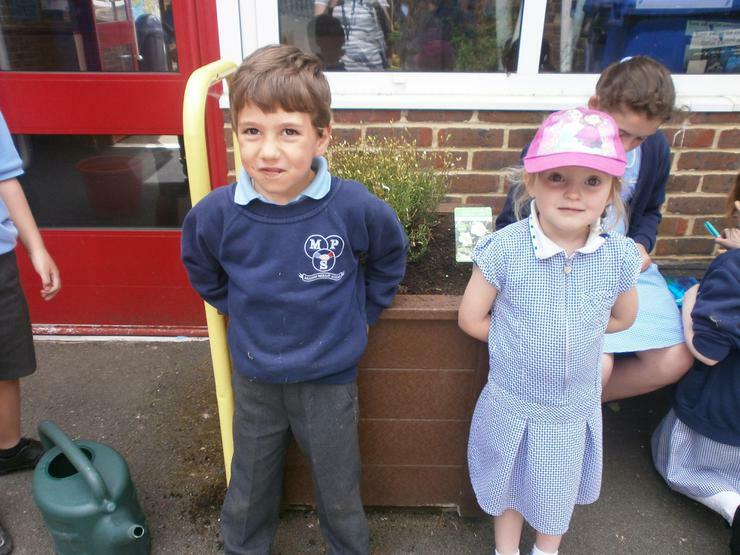 Mrs Flower was a really good teacher and she was very patient!" 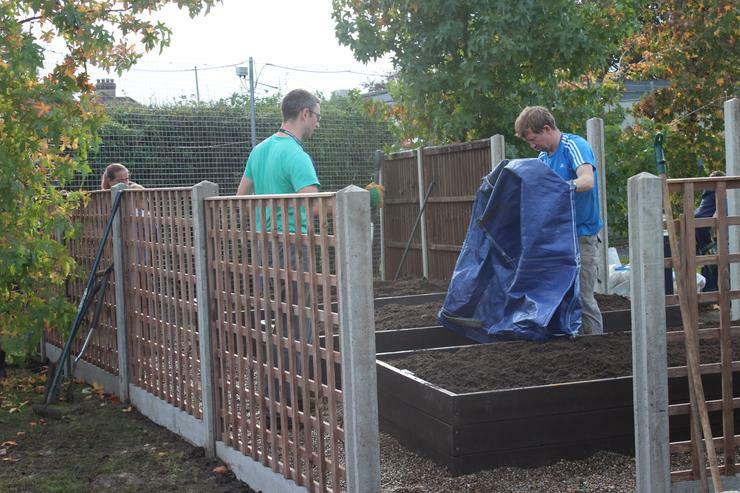 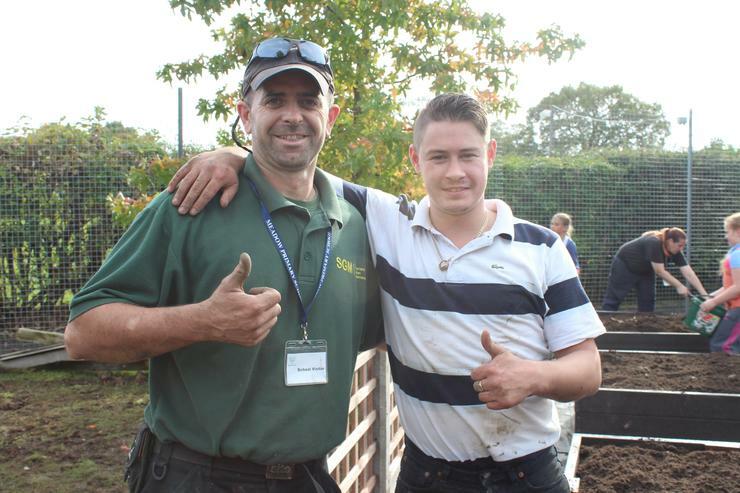 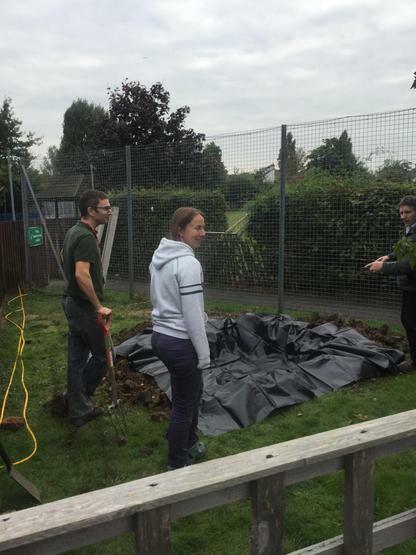 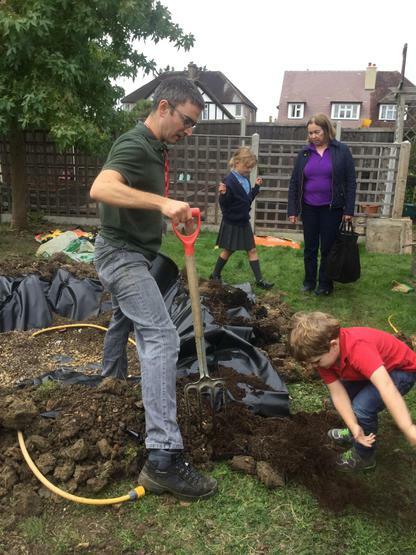 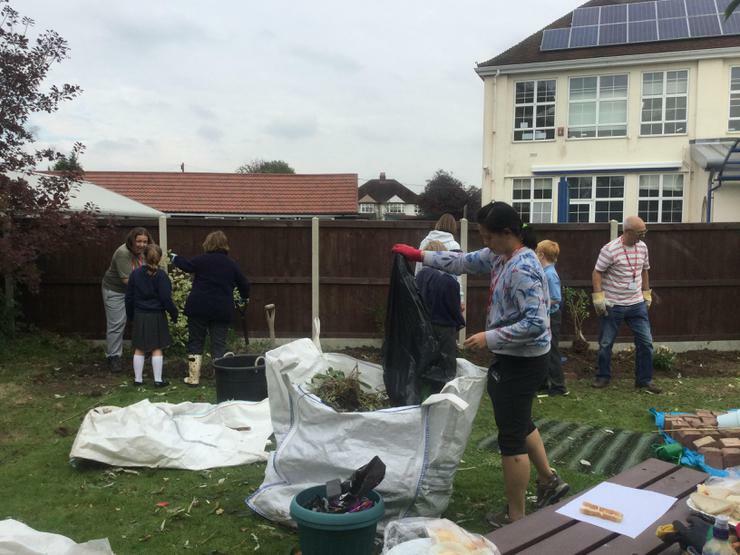 We're delighted to announce that work on our school garden is gathering pace and on Friday 17th October we were delighted to welcome our parents for the 'Get Your Grown Ups Growing' Day. 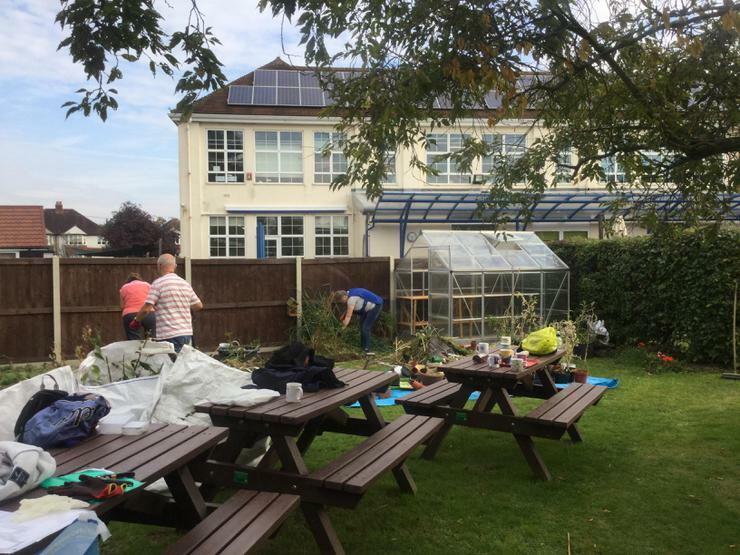 We were extremely lucky to have Stewart Sutherland from Sutherland Garden Maintenance and our own Mr Roy on board to help guide us on the day as we put together flower beds, plant seeds, gave the area a general tidy up and even built a bug hotel! 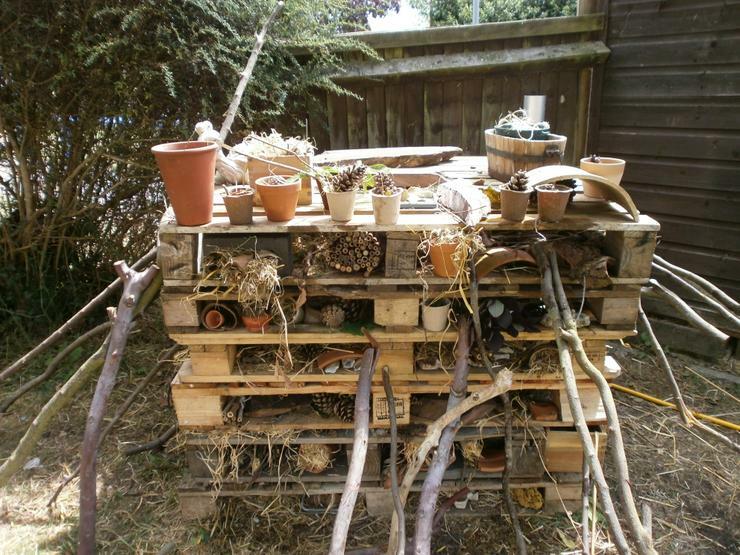 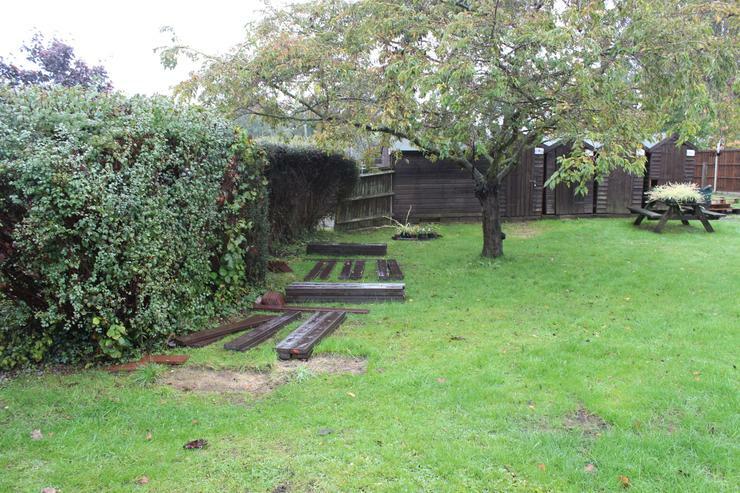 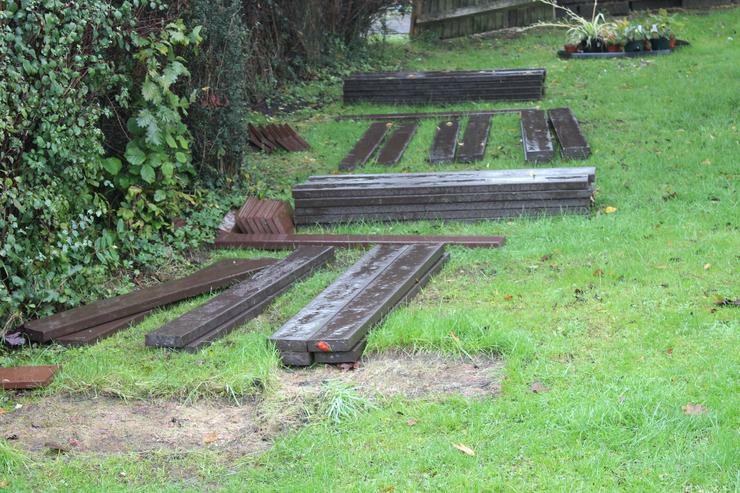 Our new garden area will be a combination of an allotment to grow vegetables and a wildlife area where the children can come and see butterflies, bees and insects in our 'Bug Hotel'. 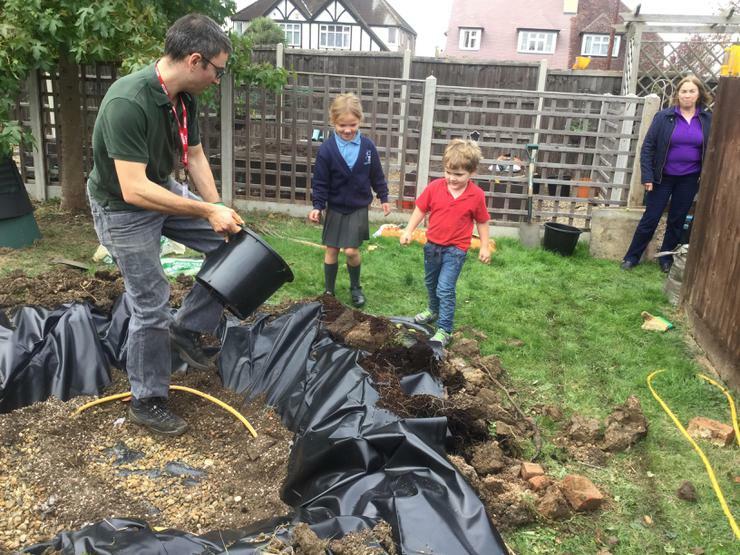 All year groups will be involved in the garden and the design is based on the the children's drawings and wishes for the space alongside expert advice from Eco Local . 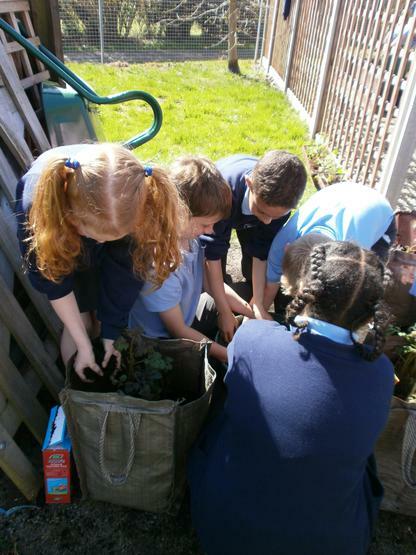 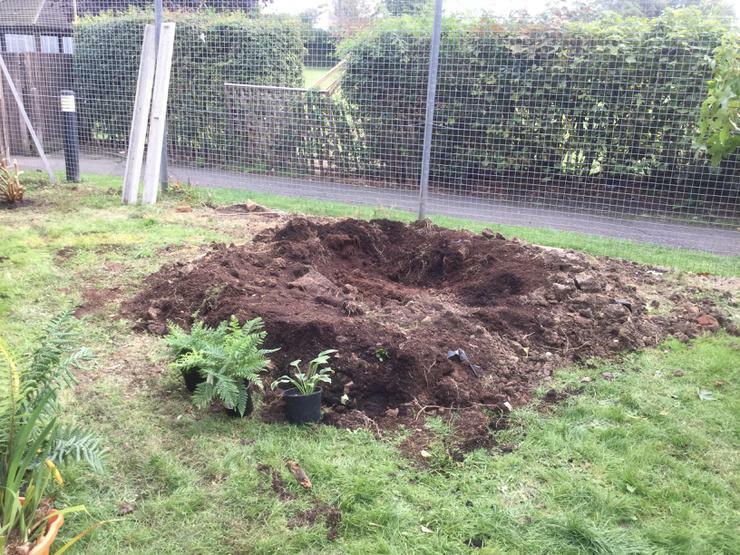 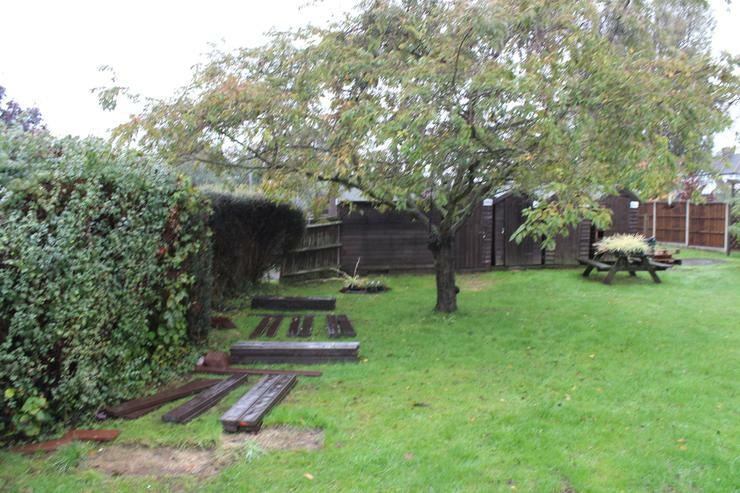 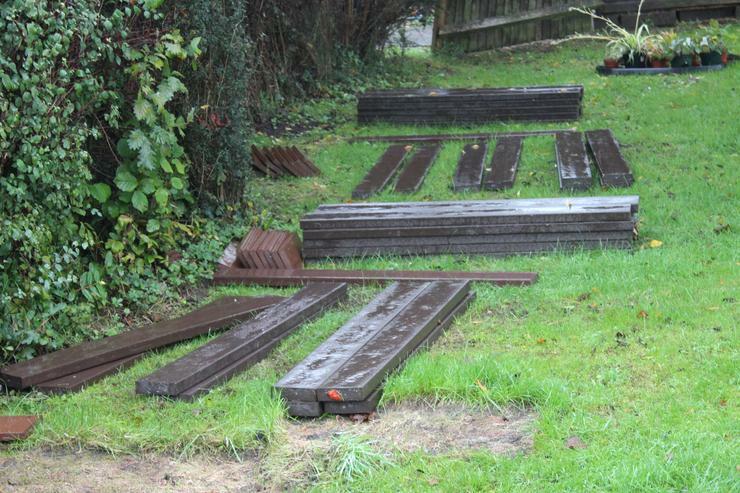 We are also working towards the Eco Schools Award and the garden will be an important part of our assessment. 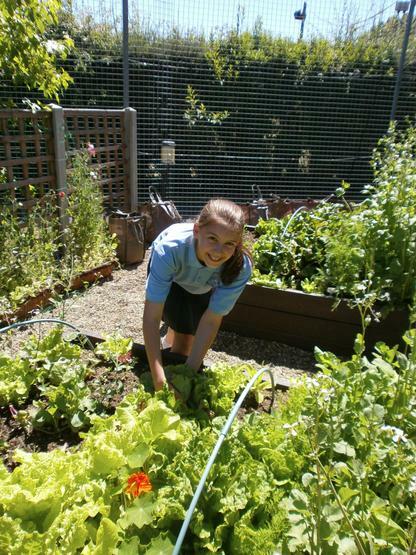 School gardening supports many government priorities like sustainability, healthy eating, food in schools and Eco schools. 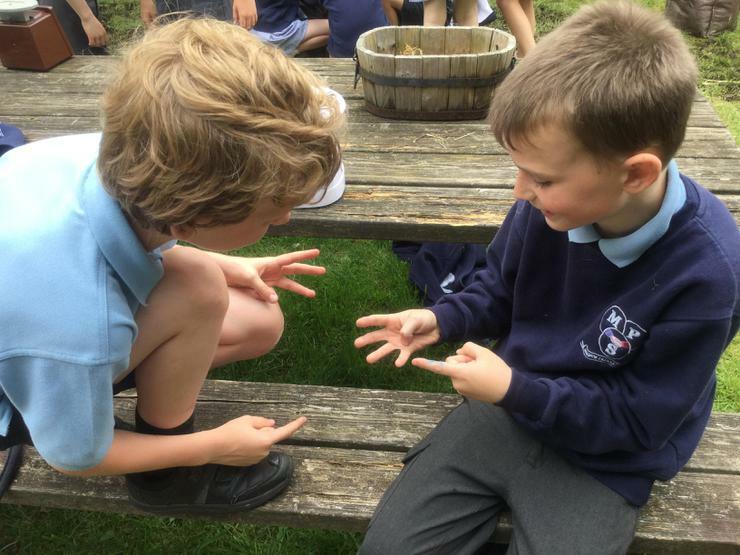 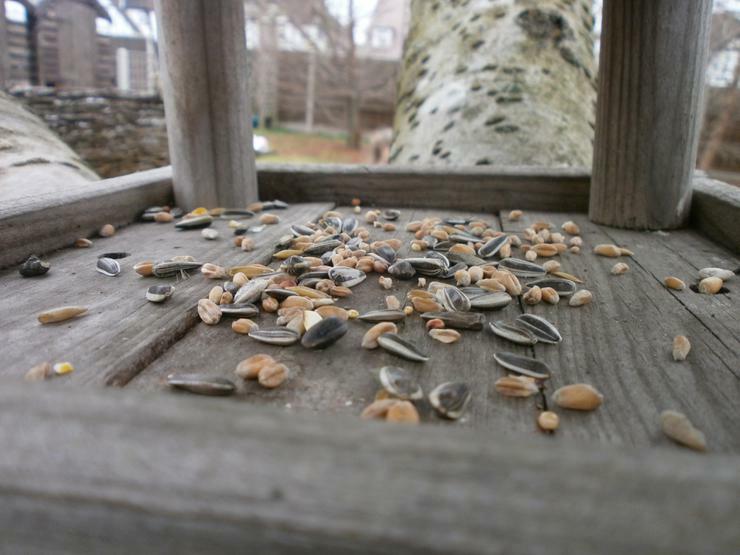 Contact with the natural world can also be wonderfully nurturing for children, as they make connections with natural environment, learn about the cyclic nature of the seasons, and begin to find out more about where their food comes from. 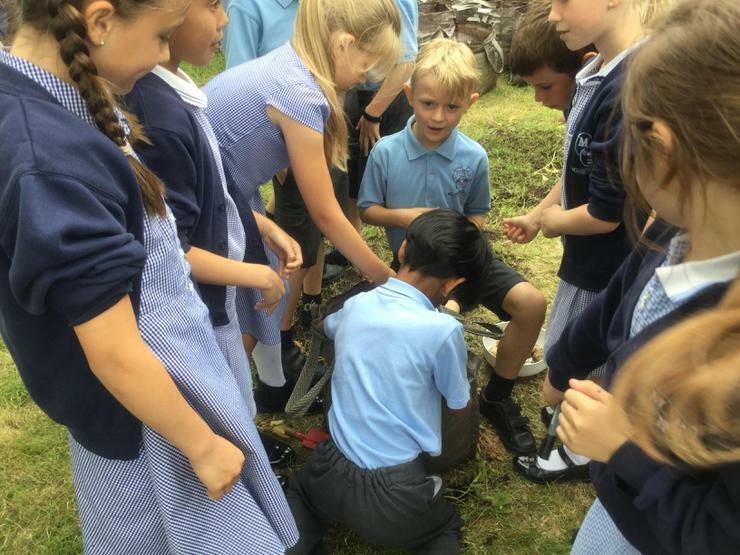 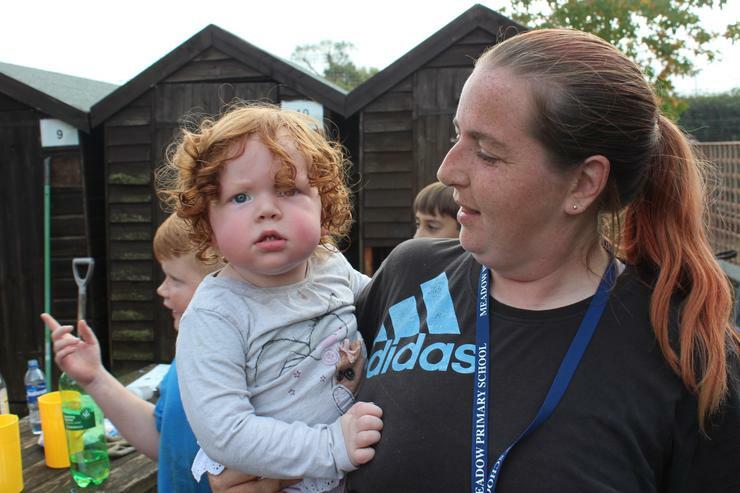 It is often the children who find it hard to engage in the classroom, who really come into their own and are able to shine in the physical activity of the outdoors. 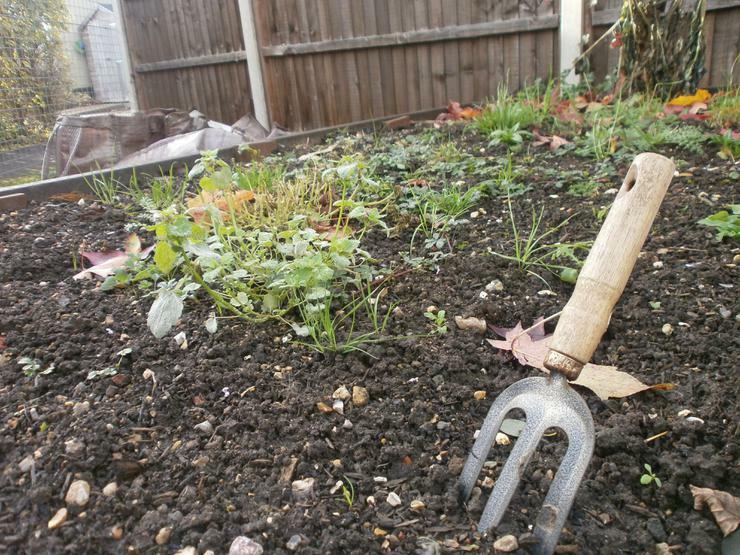 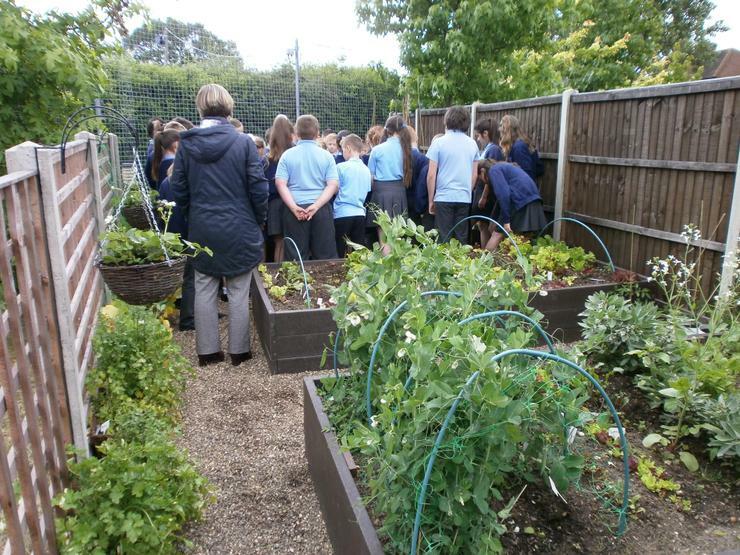 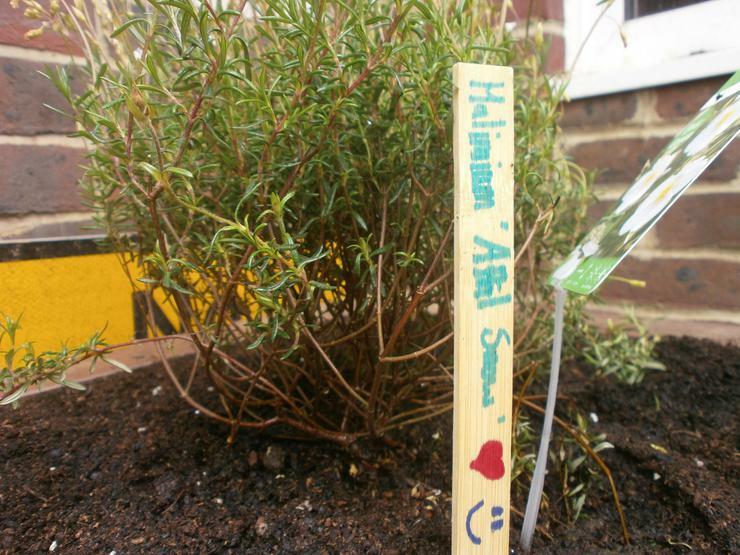 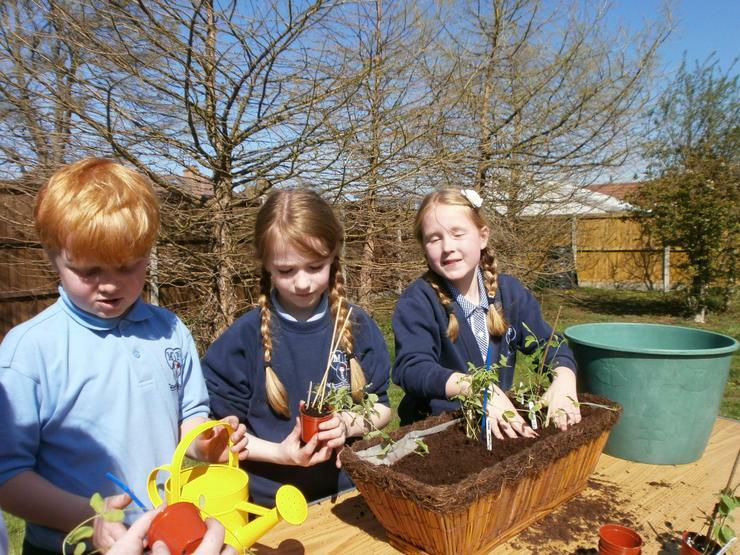 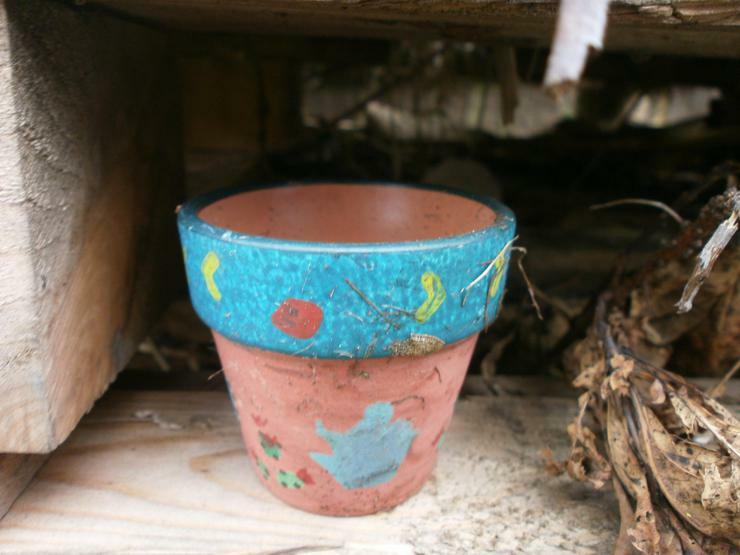 How Does Gardening Fit Into The National Curriculum? 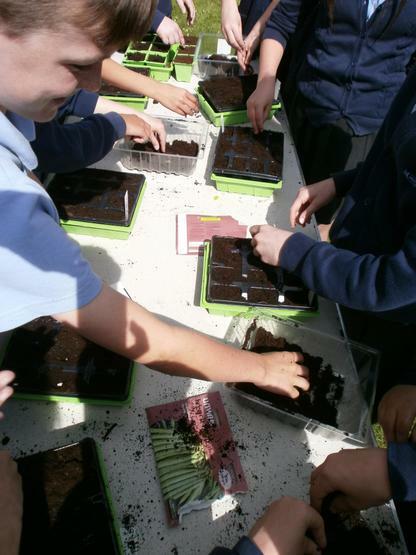 There are a whole myriad of ways in which the national curriculum can be delivered through school gardening. 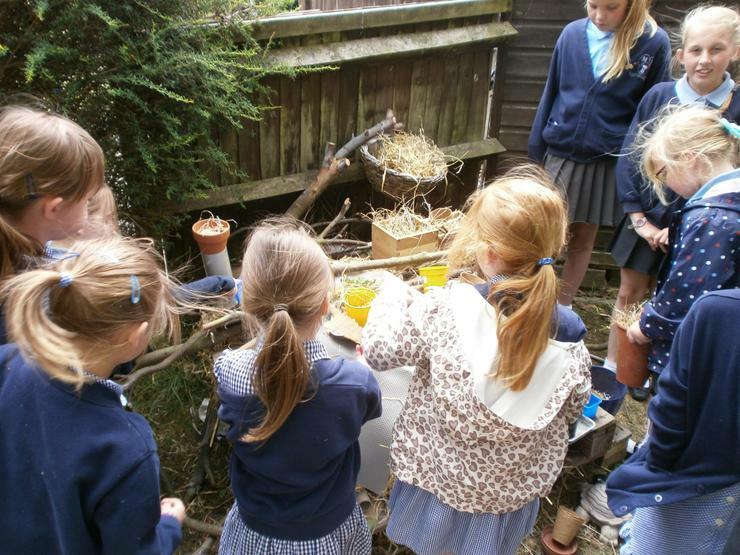 Here we give you just a flavour of what’s possible and include some useful links to more resources.